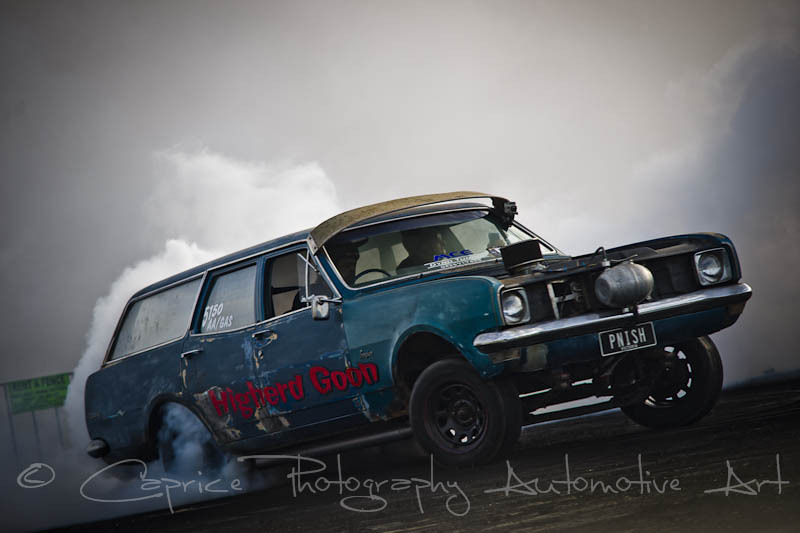 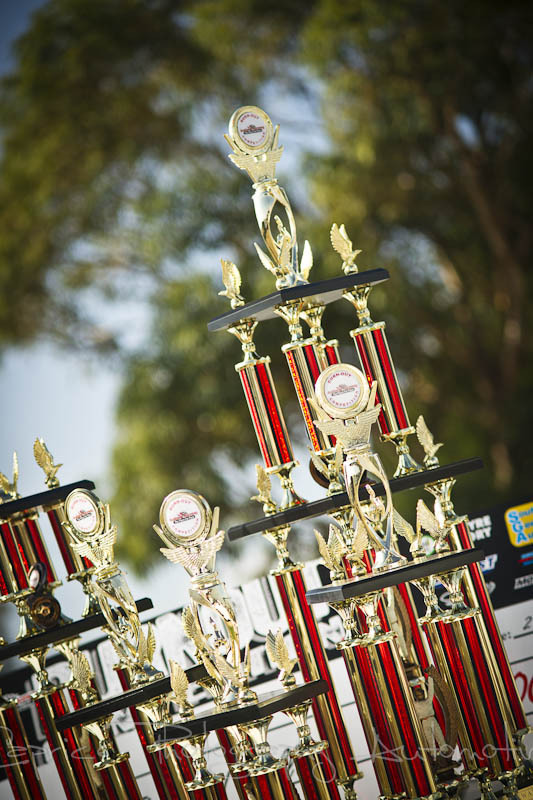 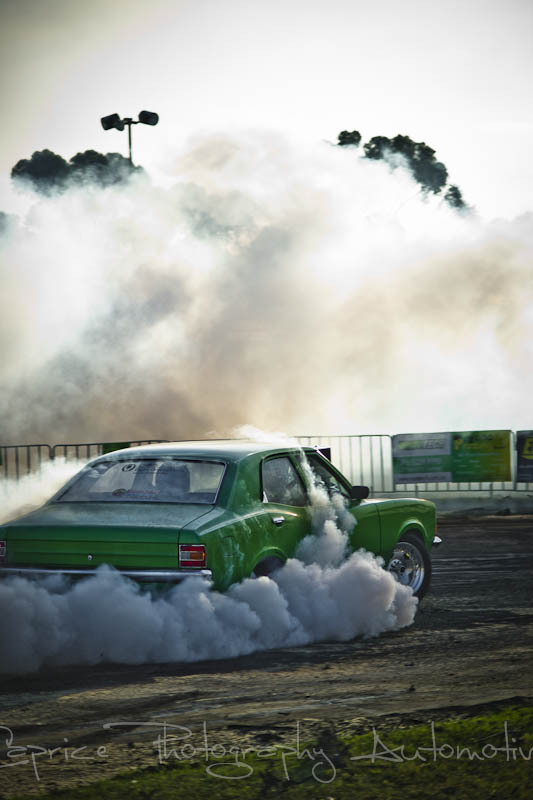 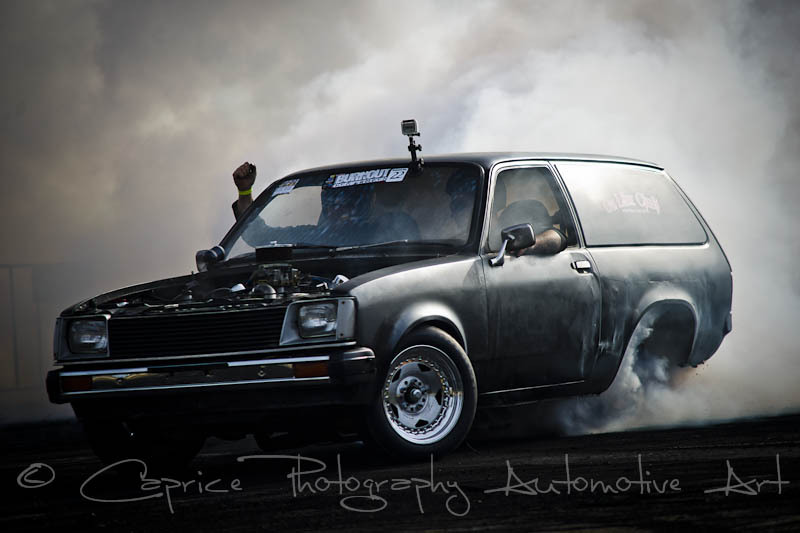 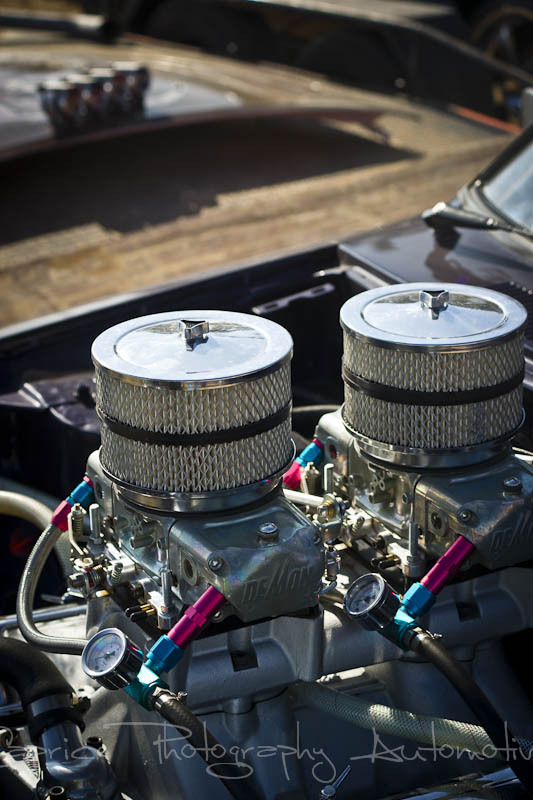 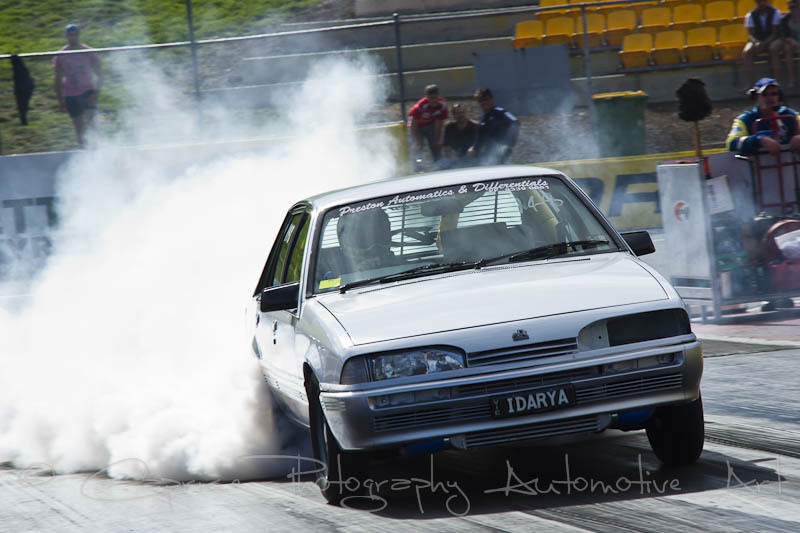 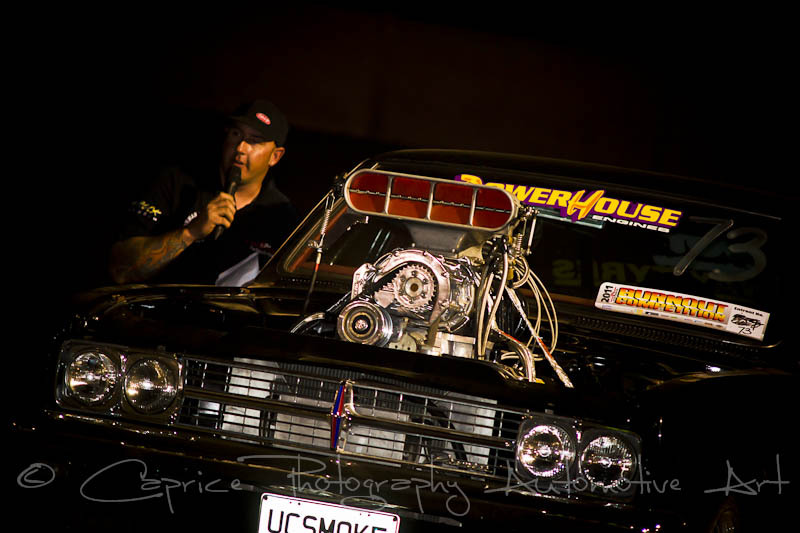 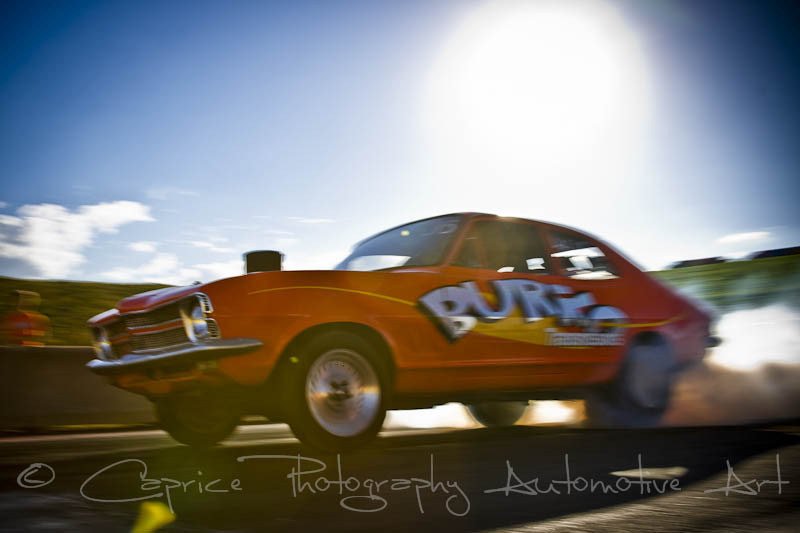 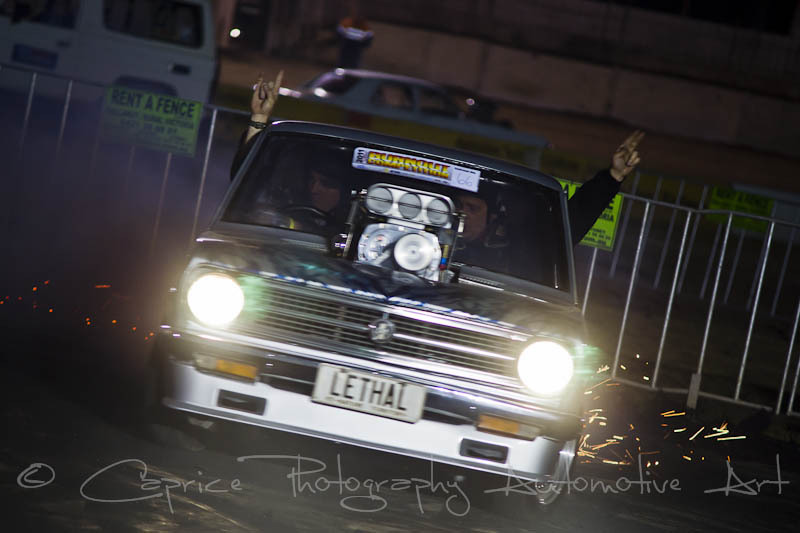 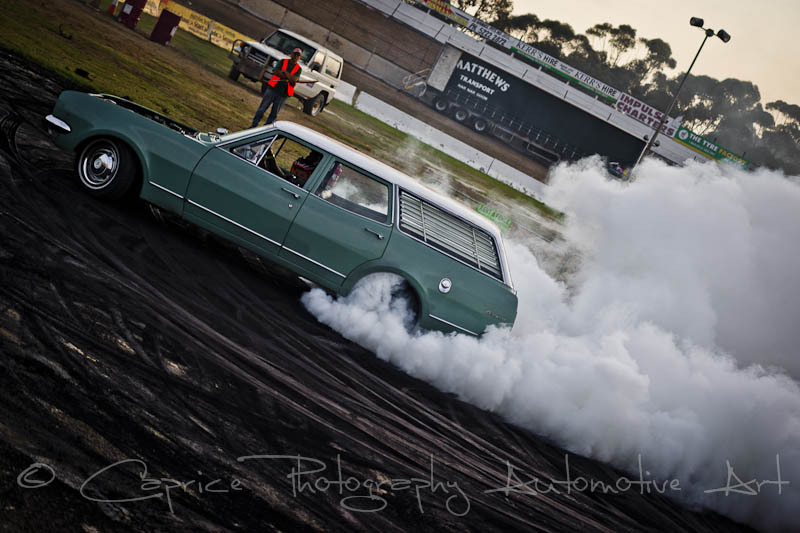 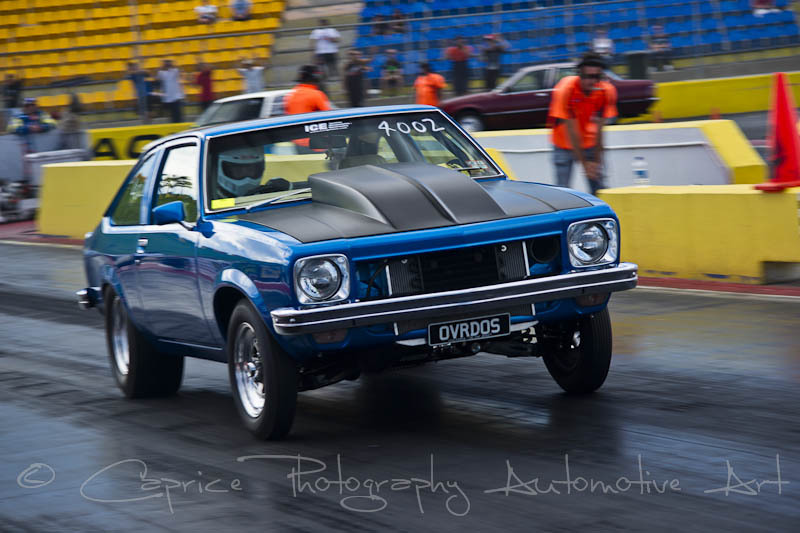 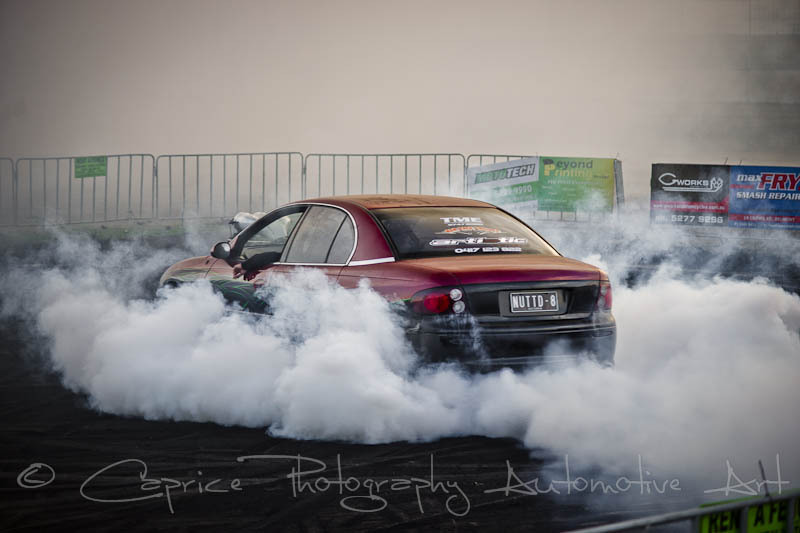 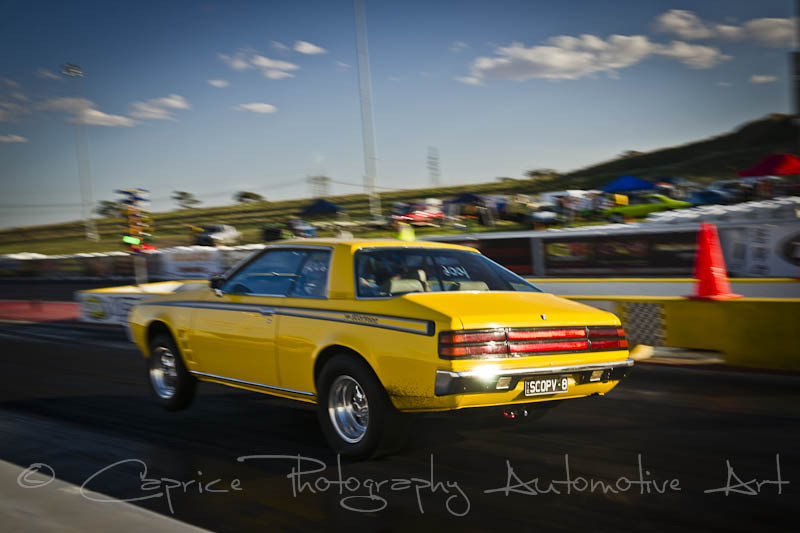 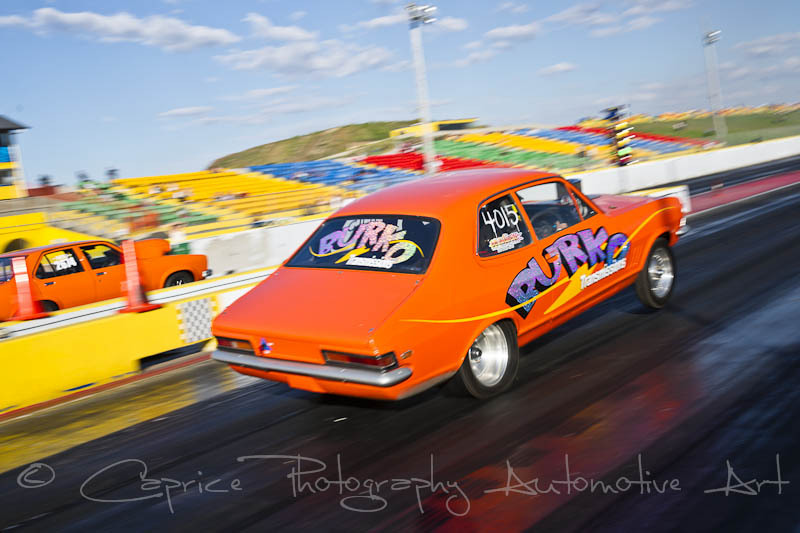 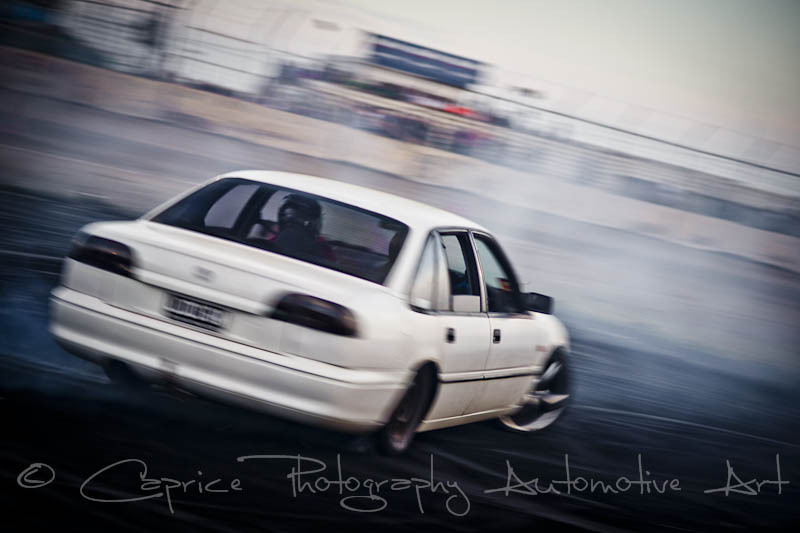 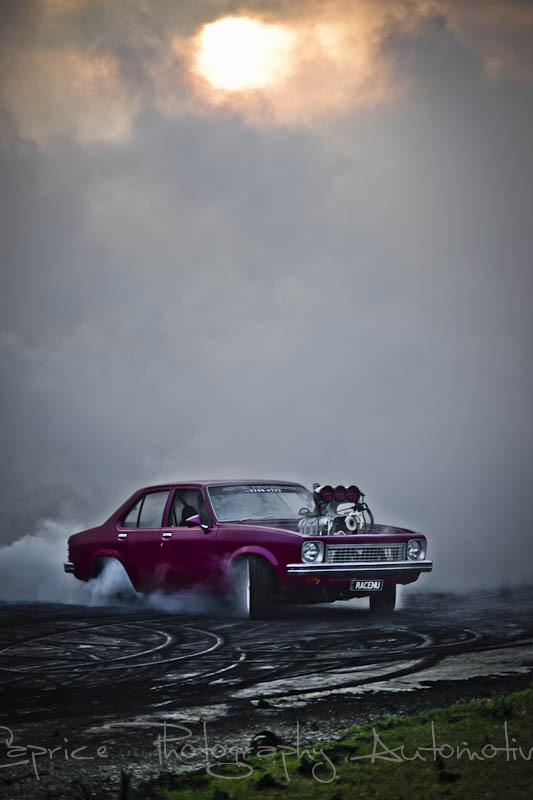 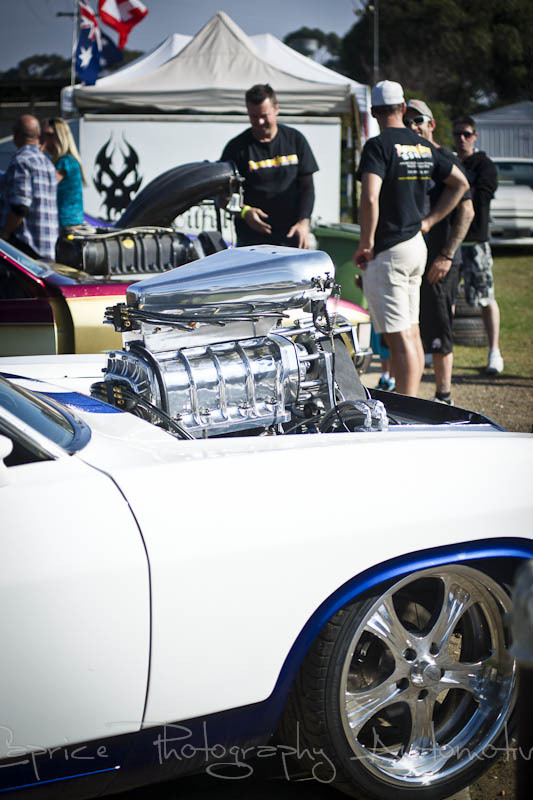 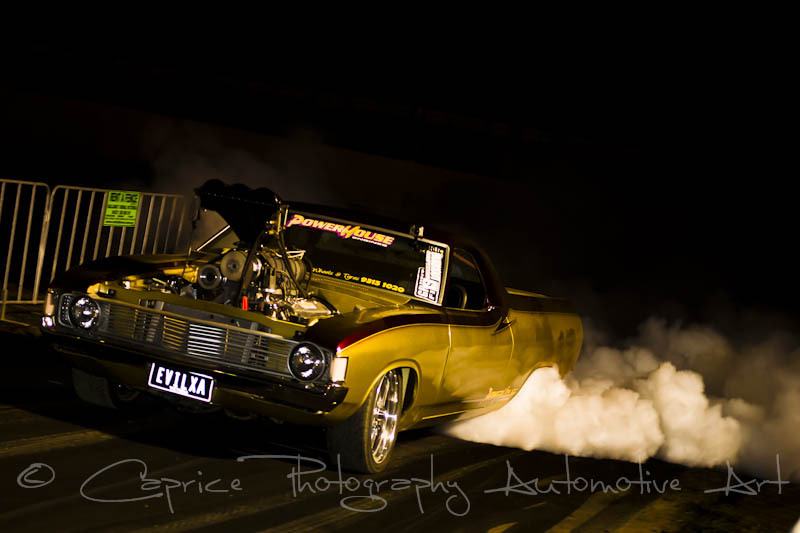 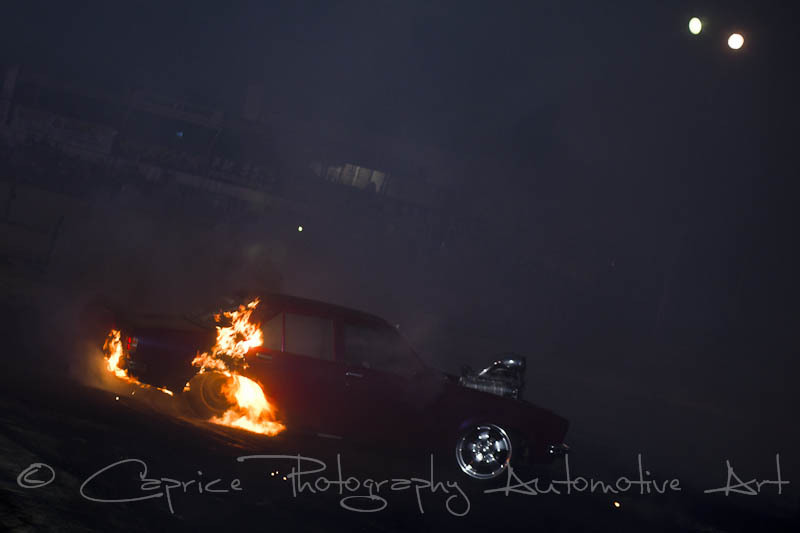 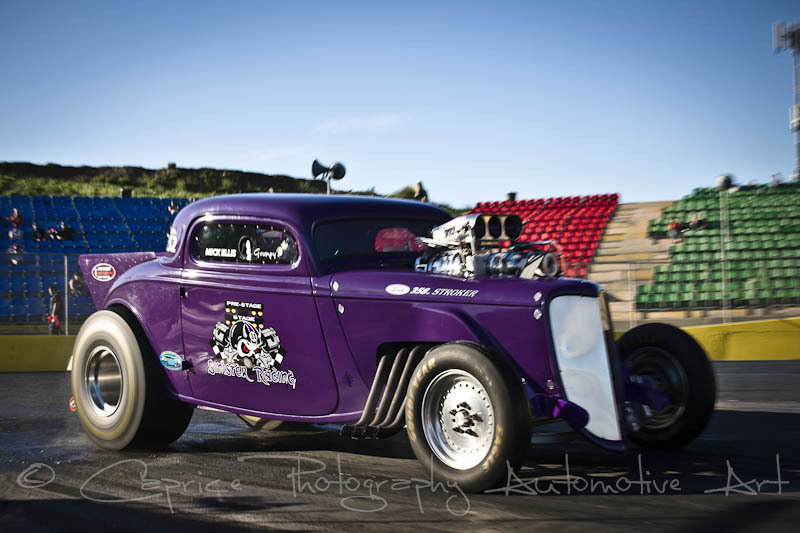 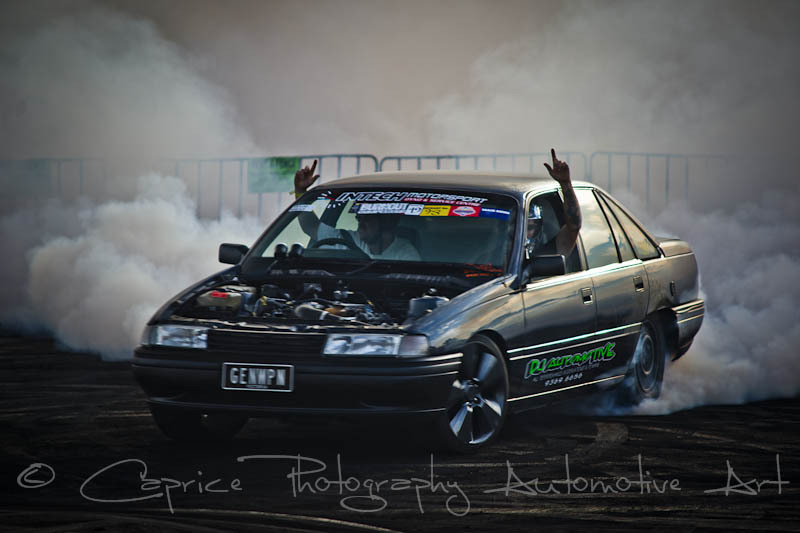 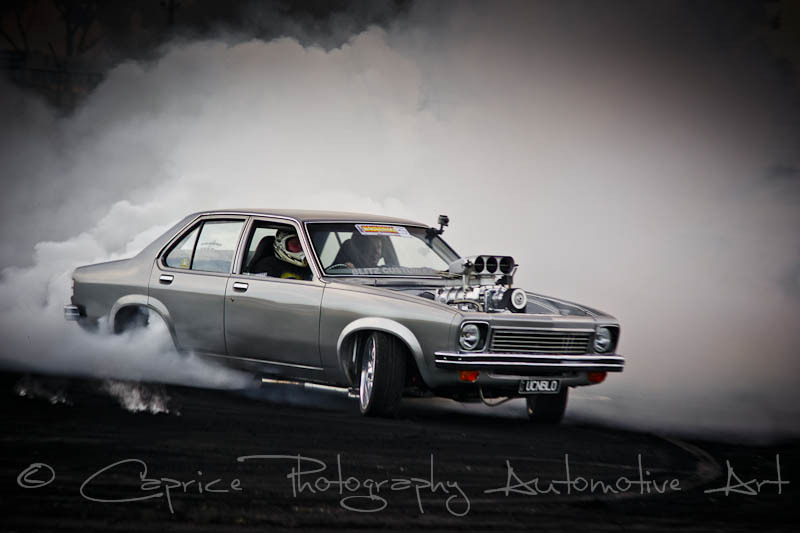 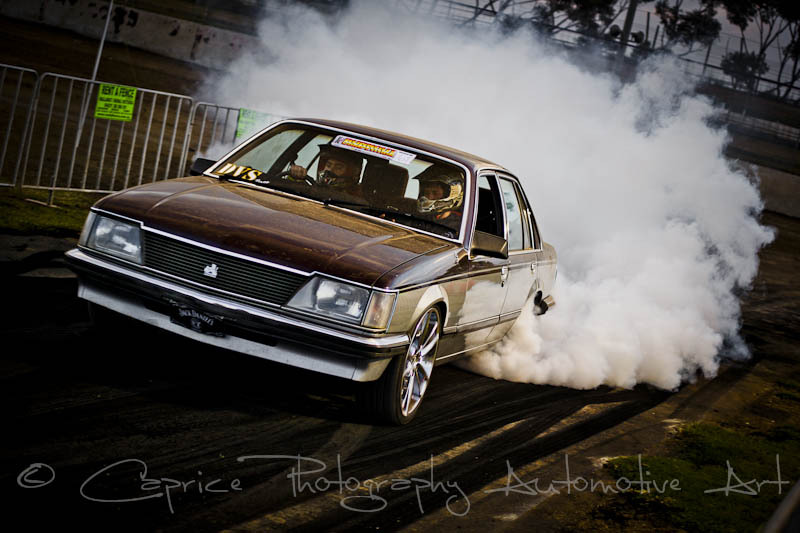 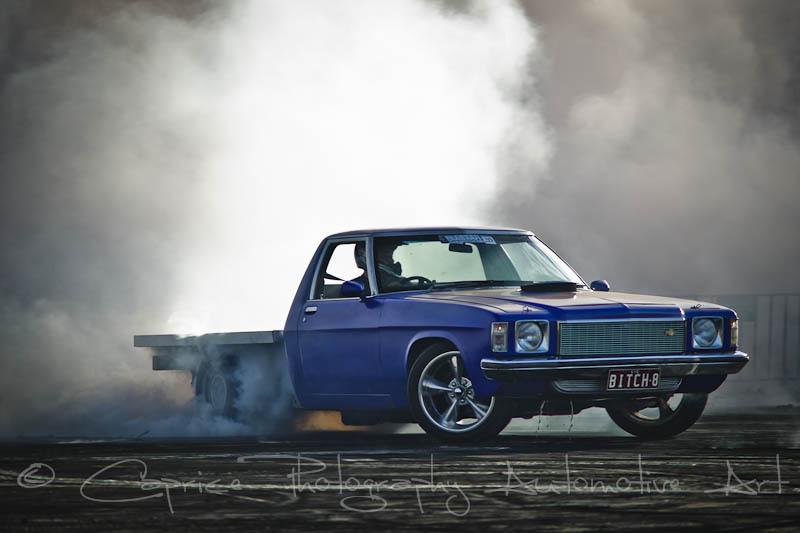 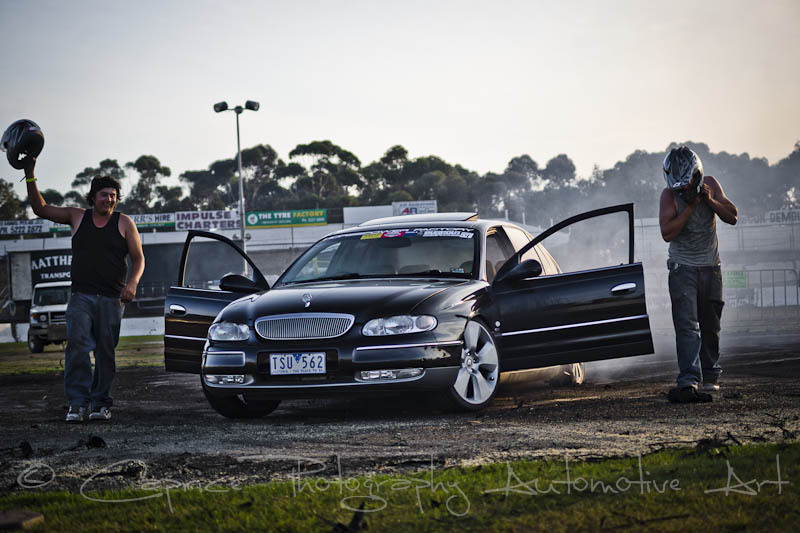 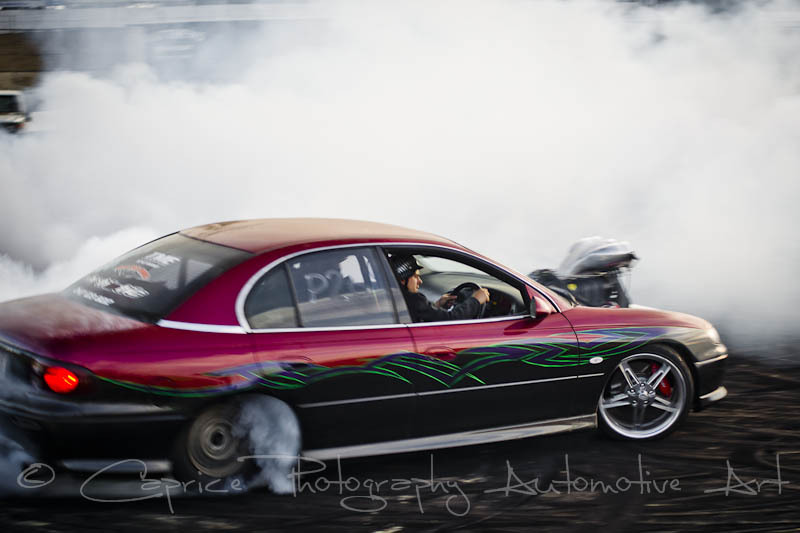 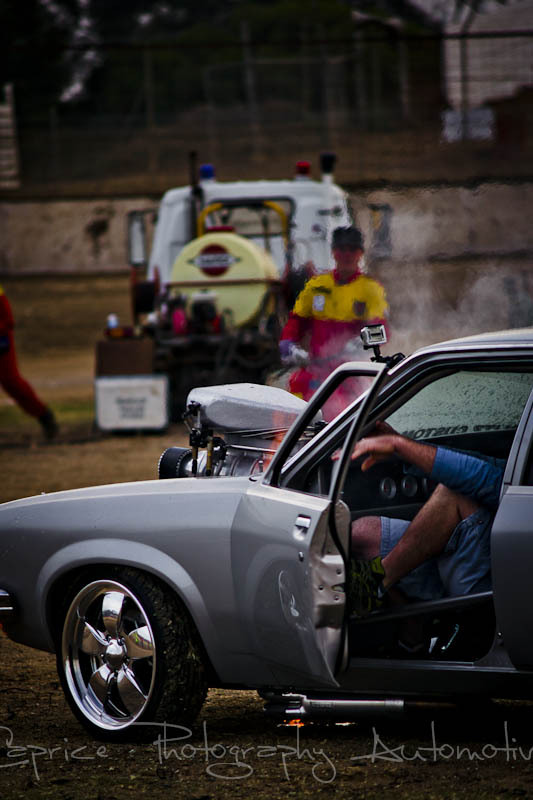 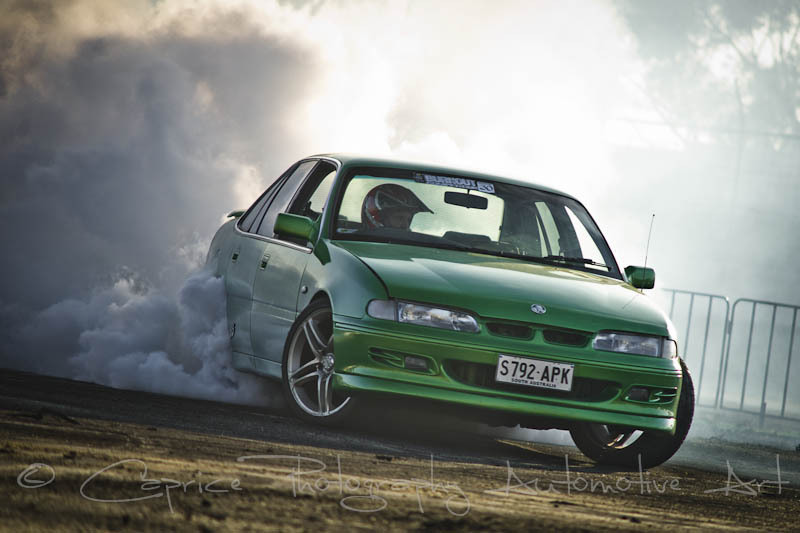 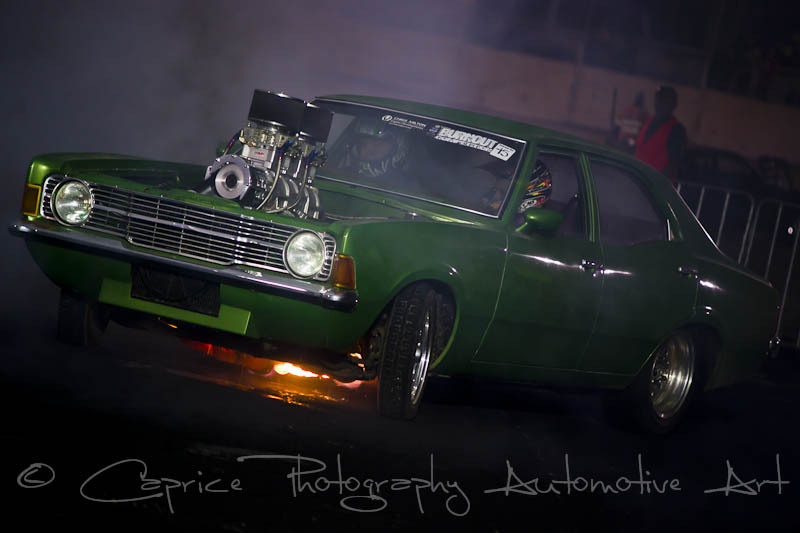 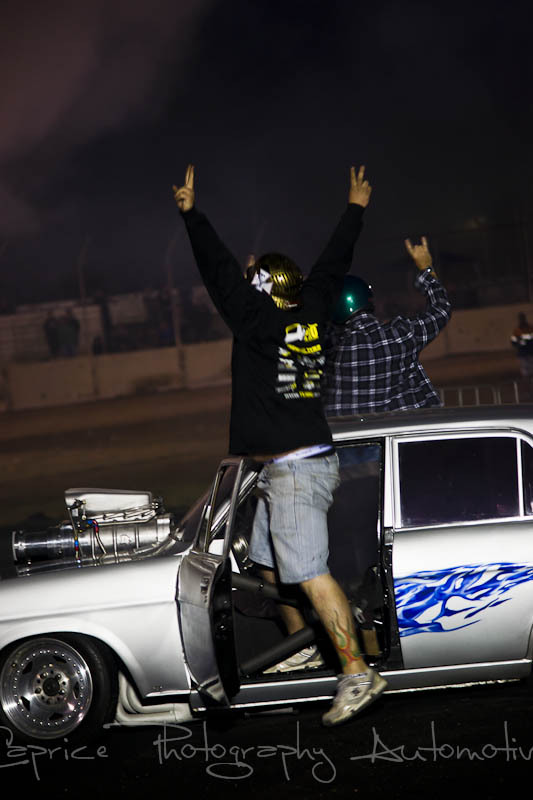 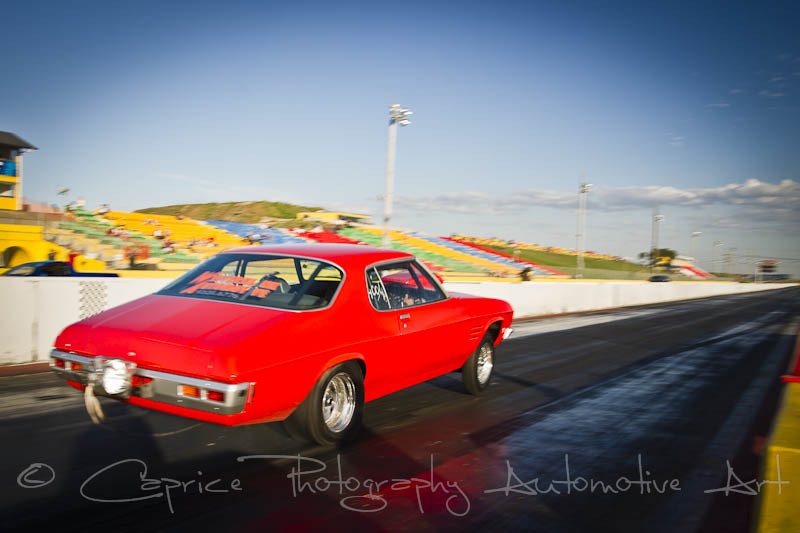 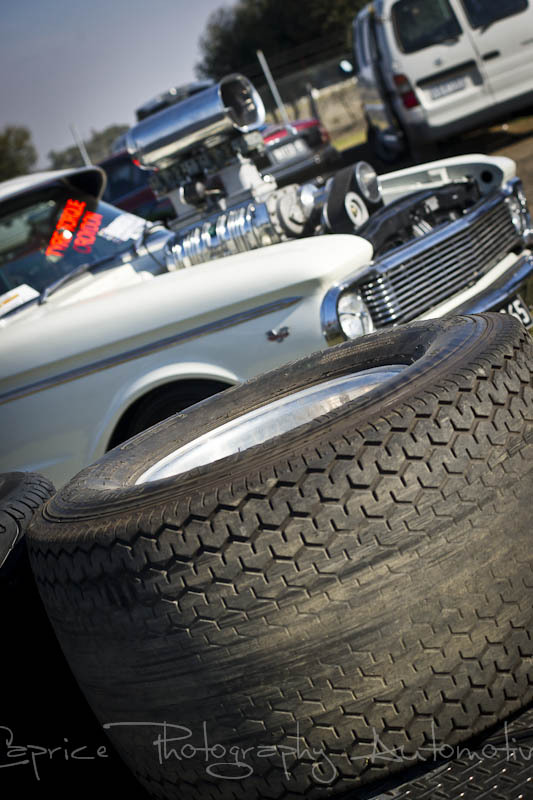 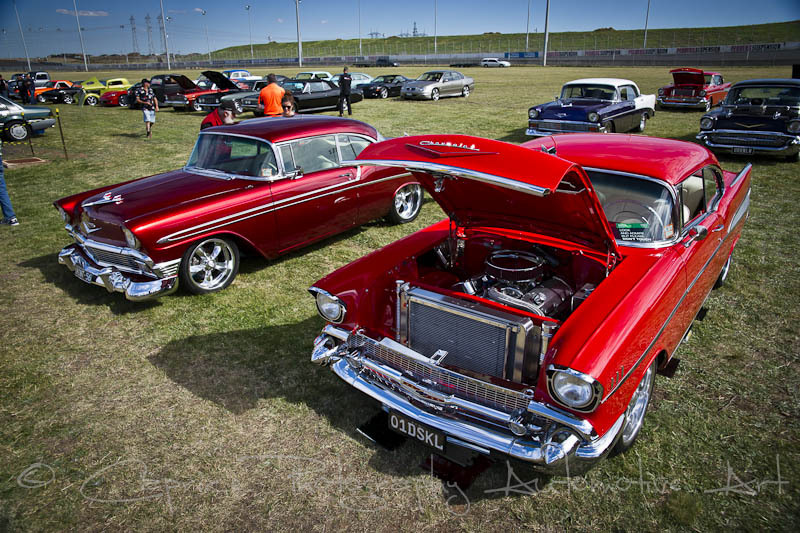 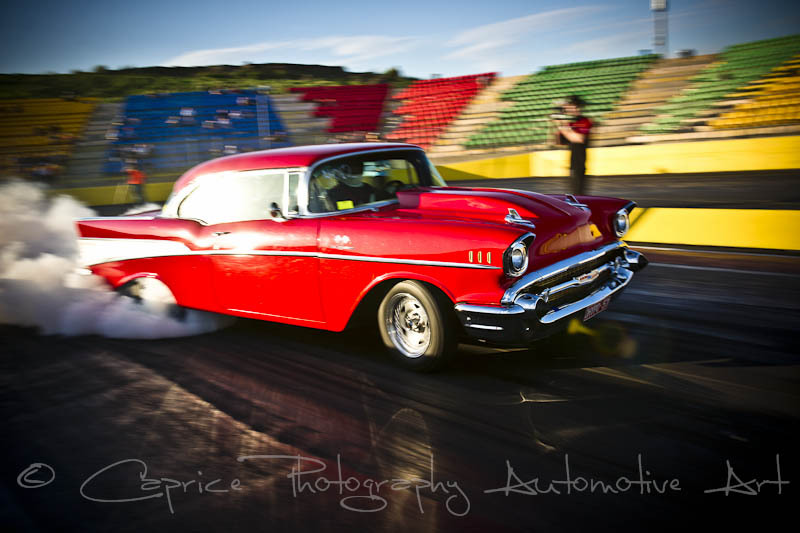 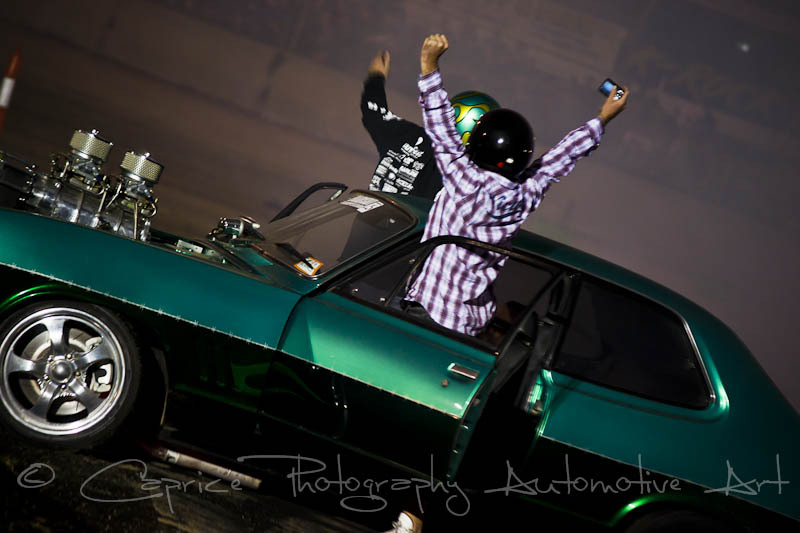 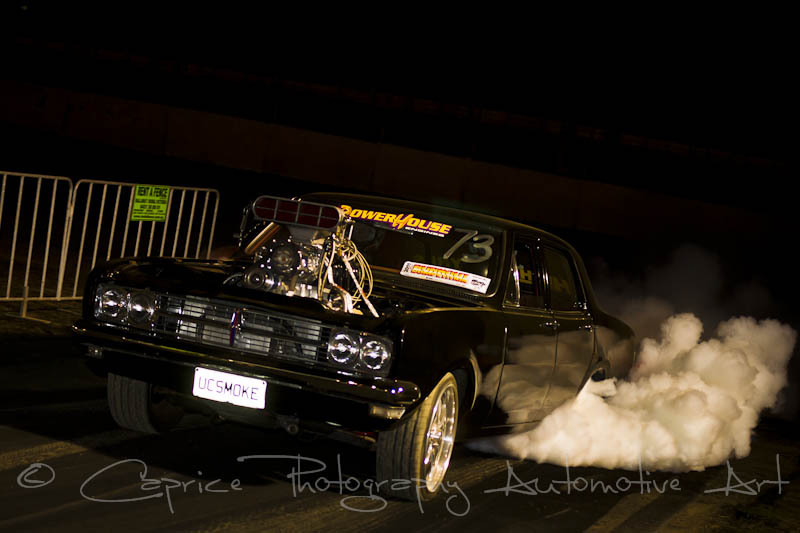 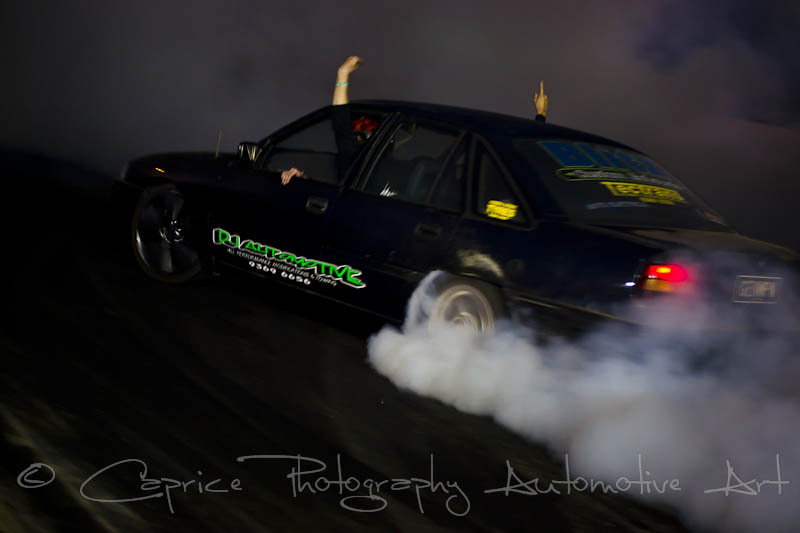 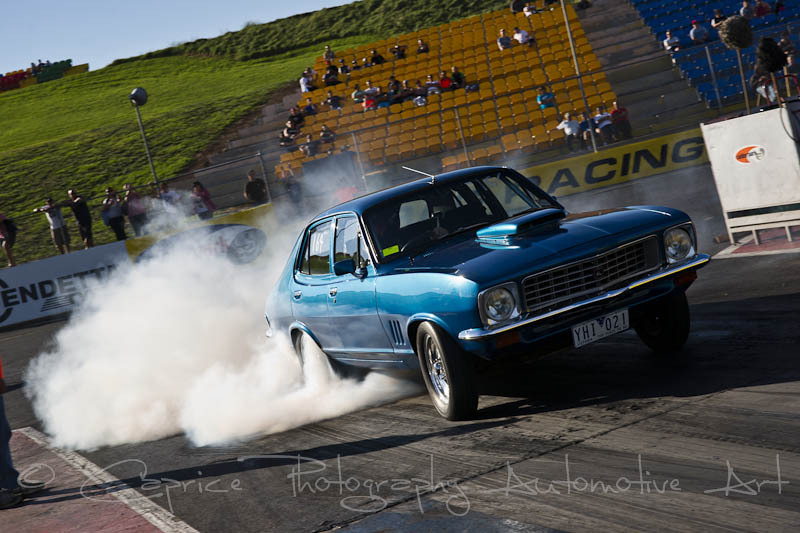 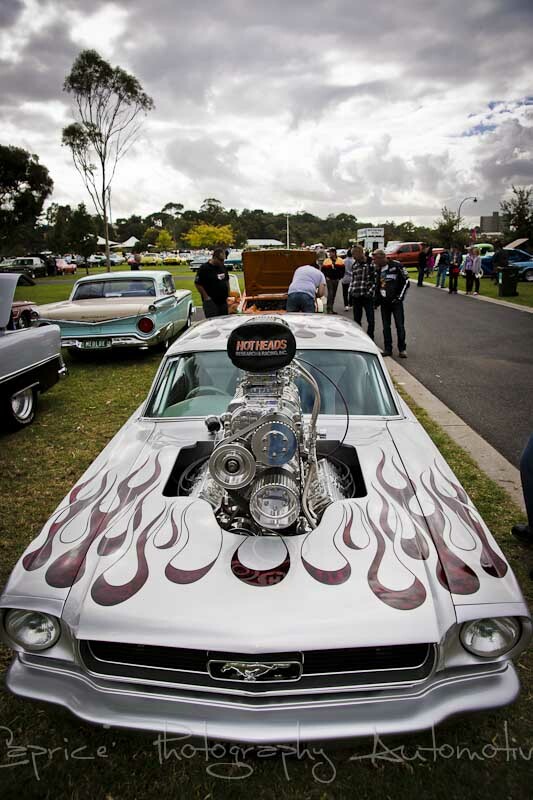 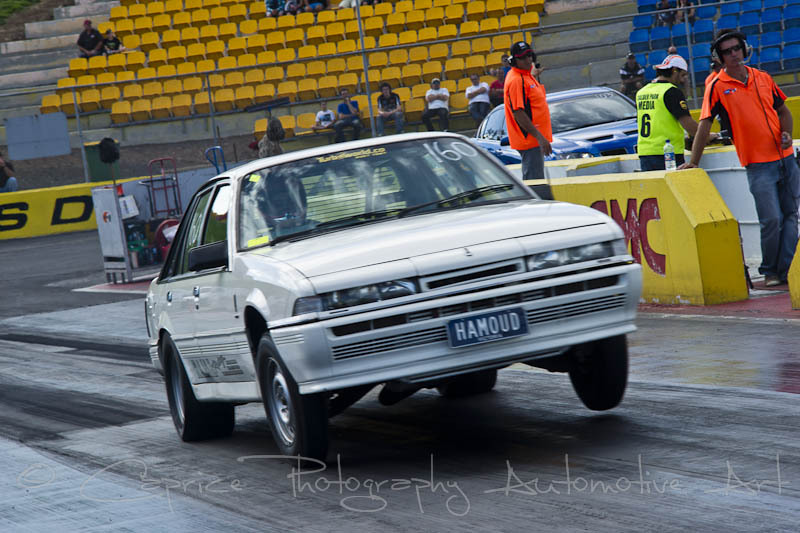 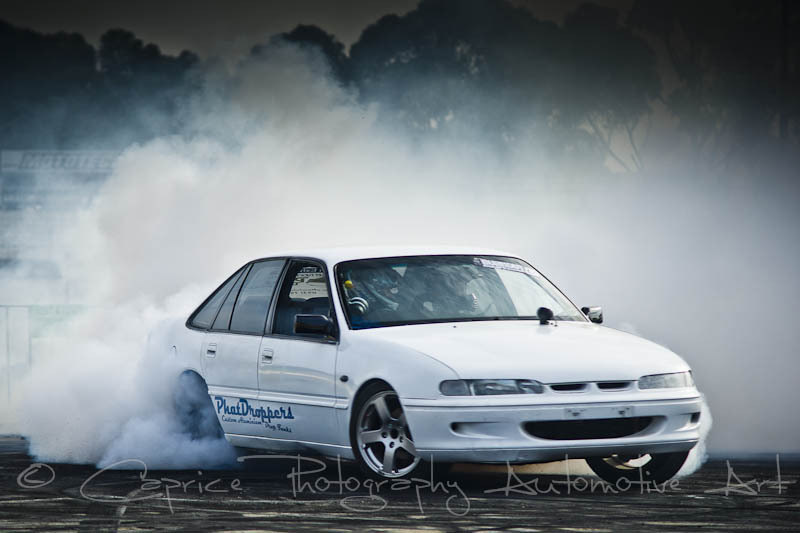 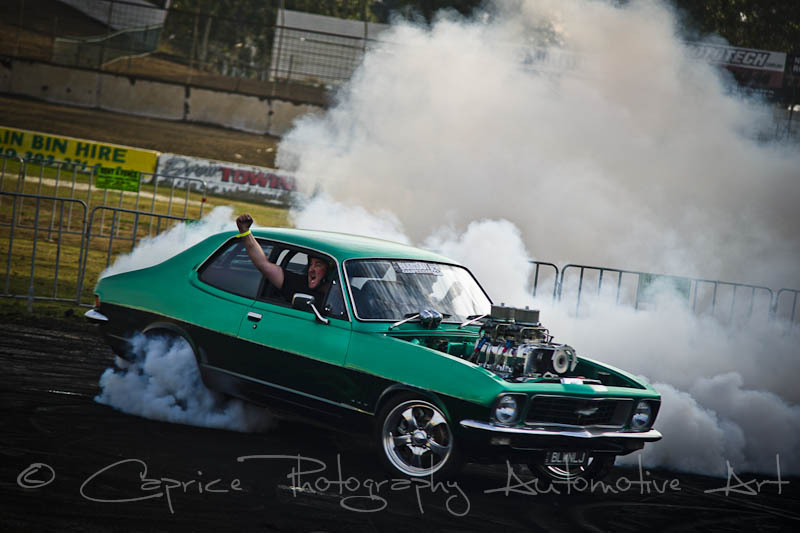 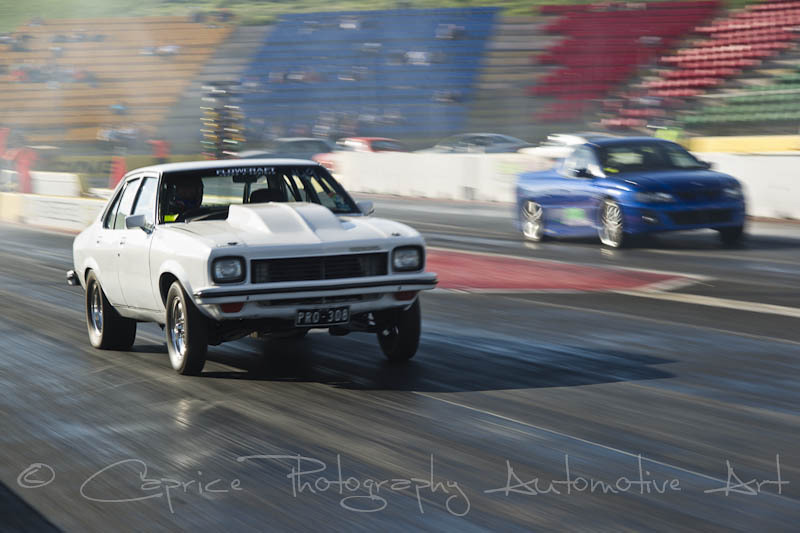 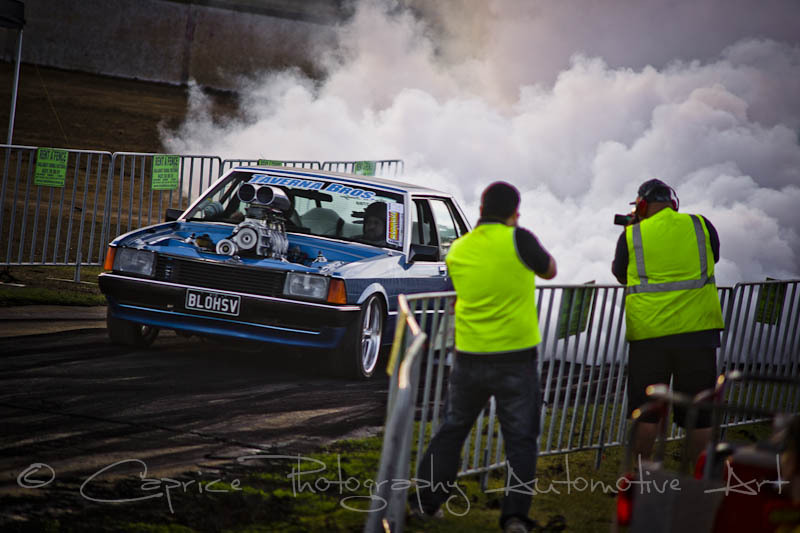 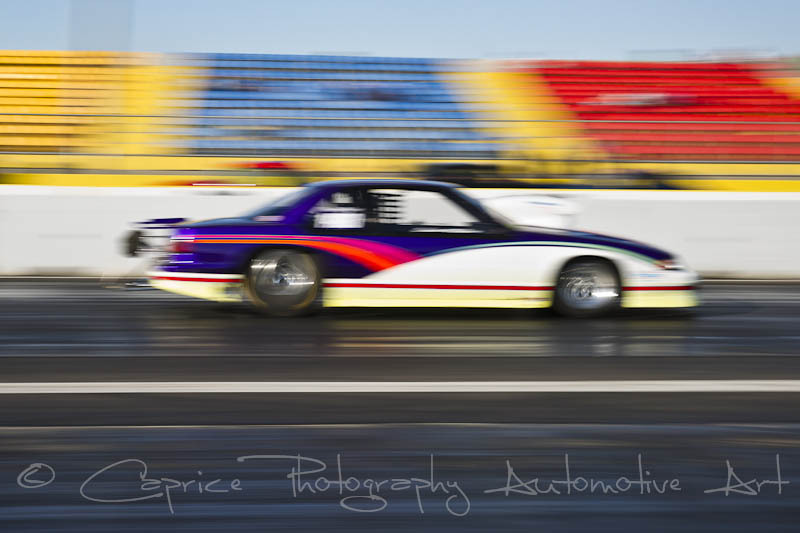 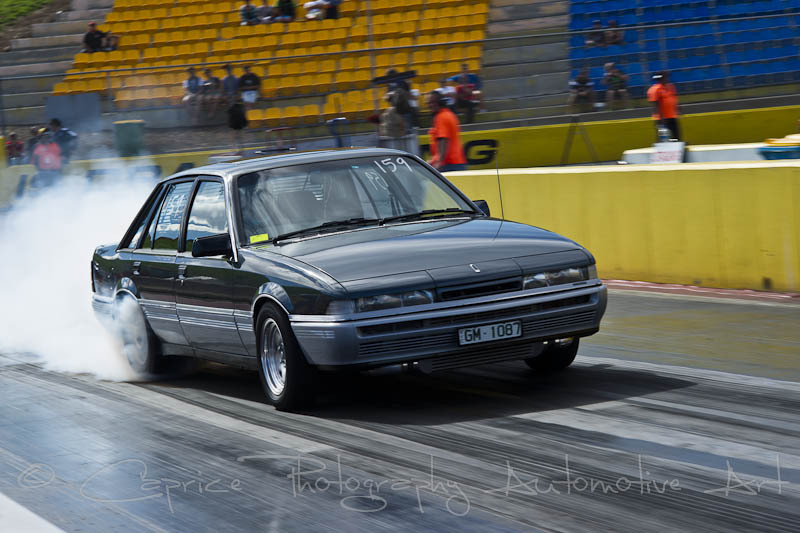 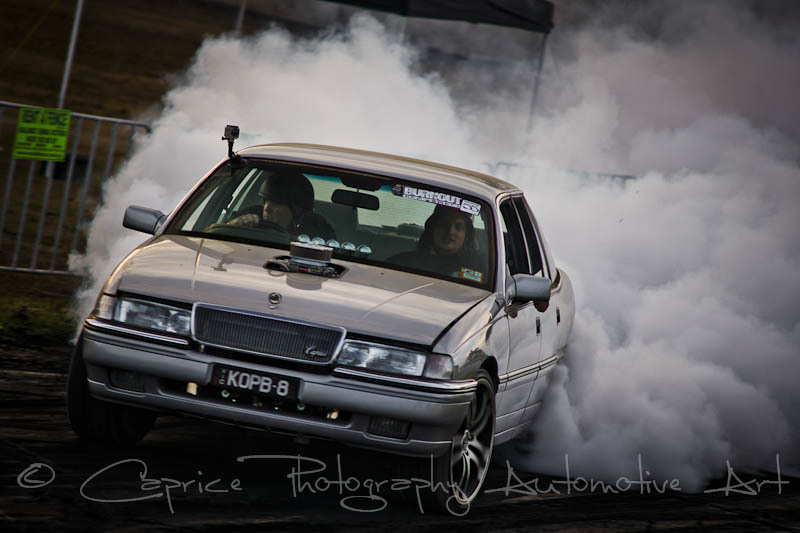 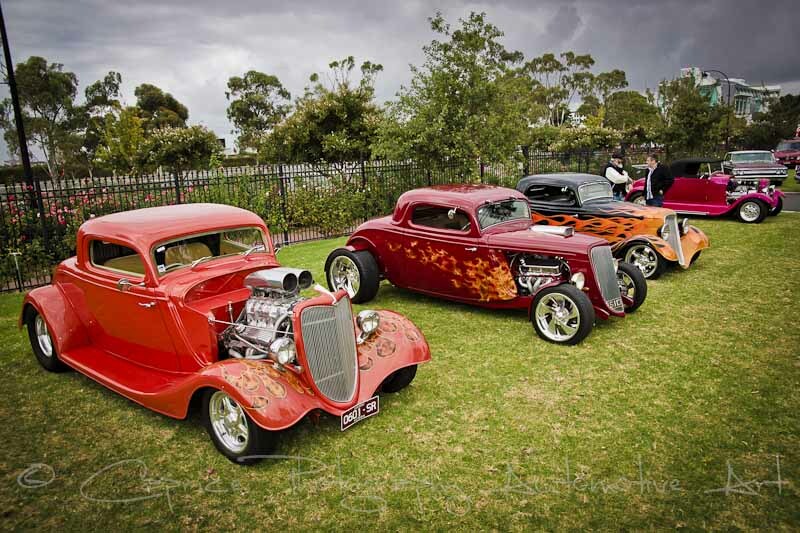 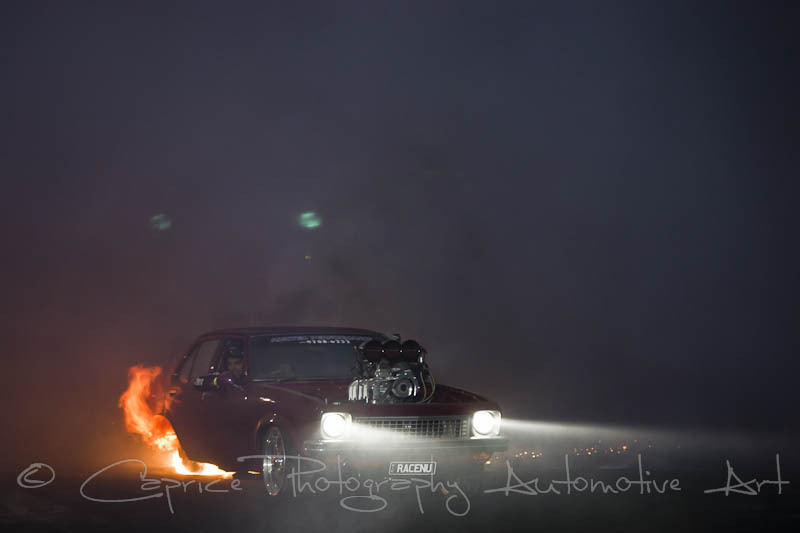 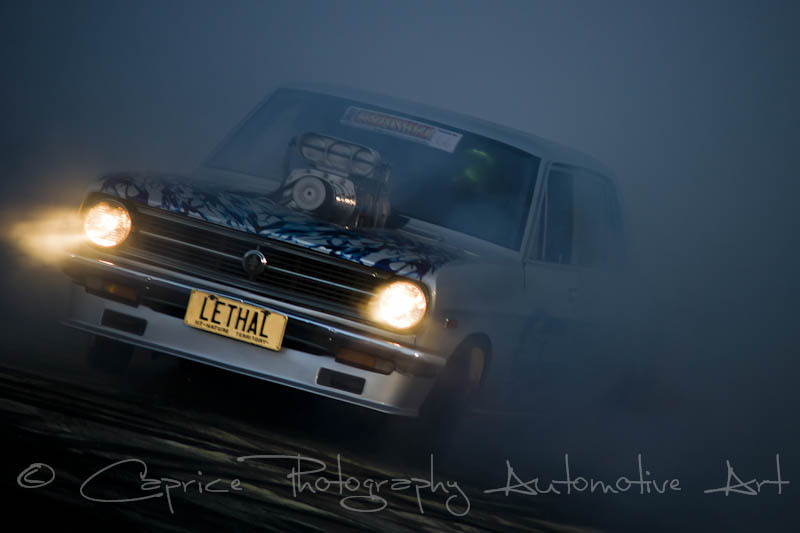 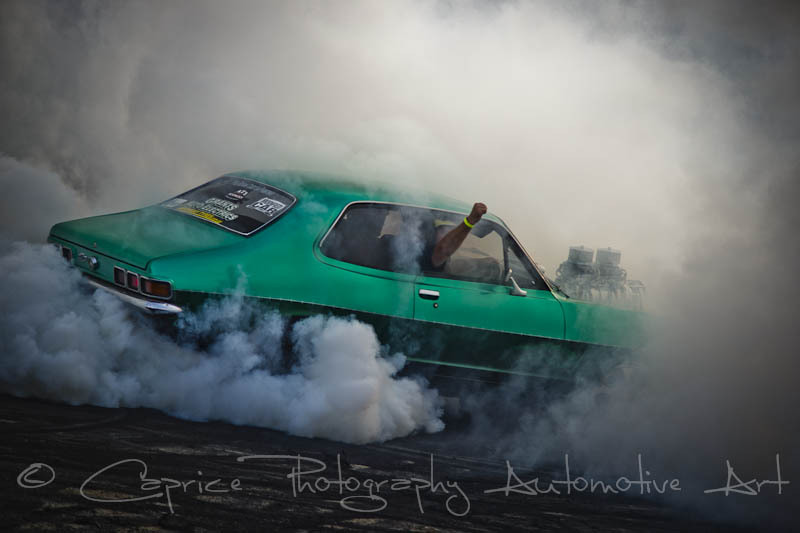 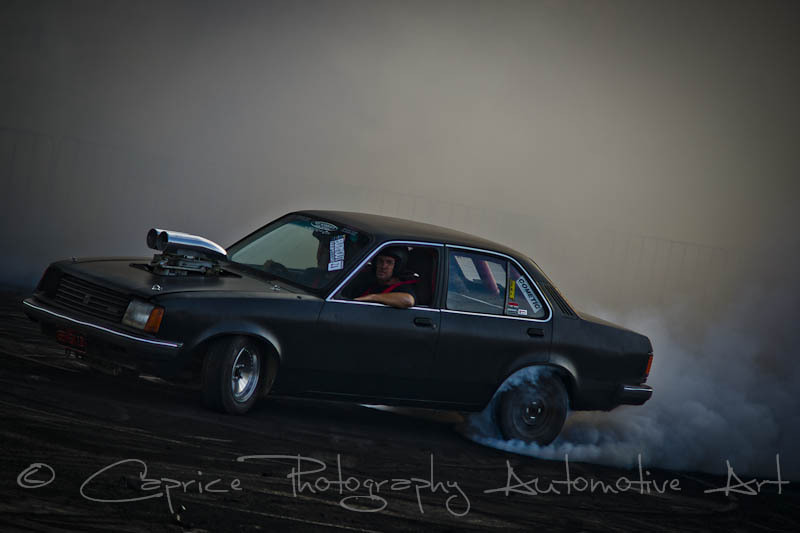 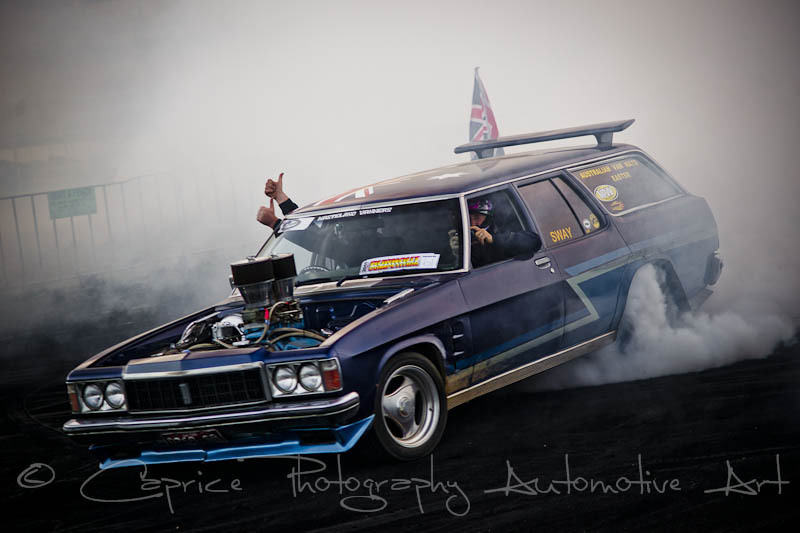 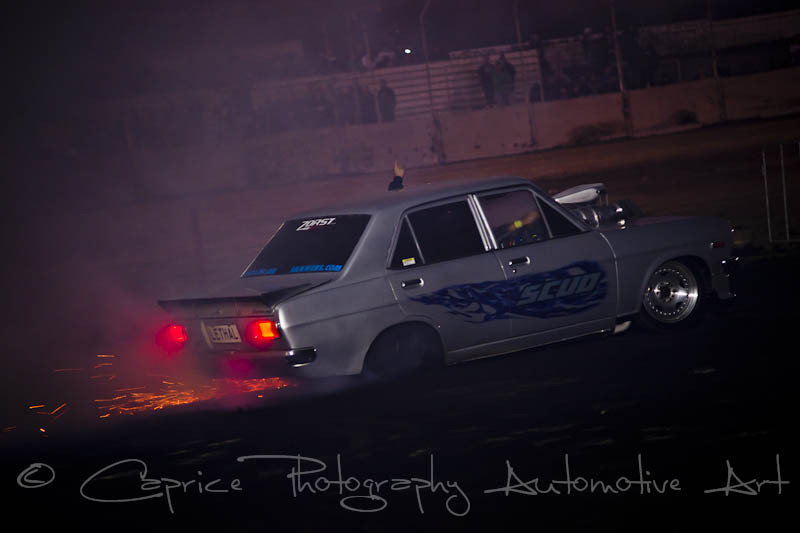 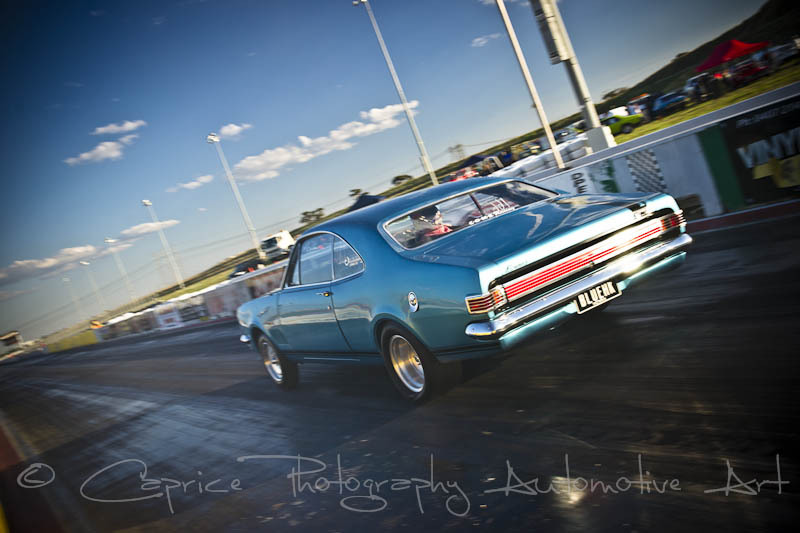 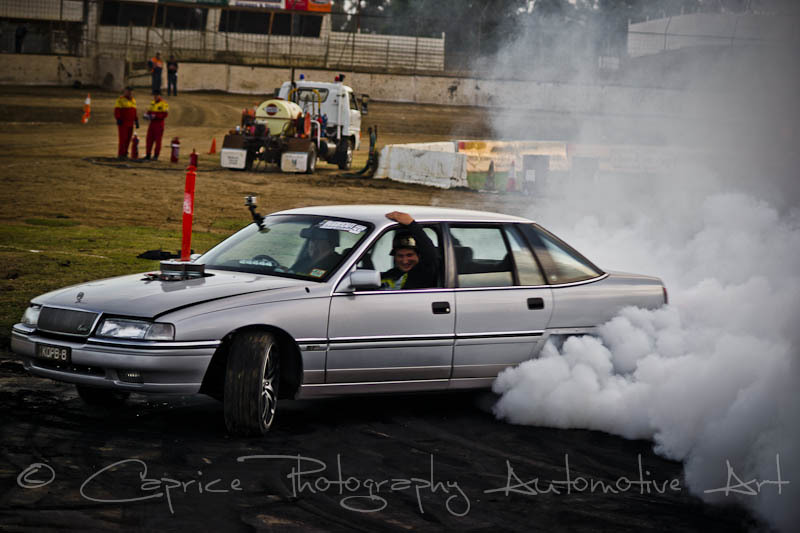 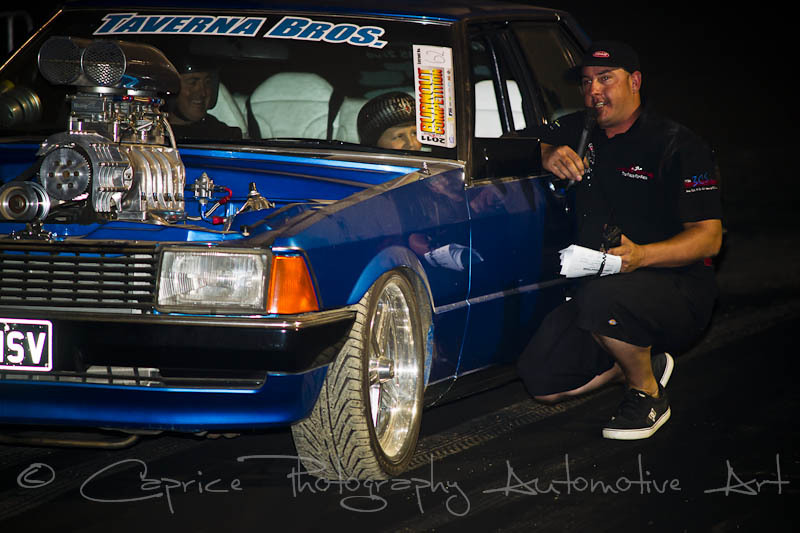 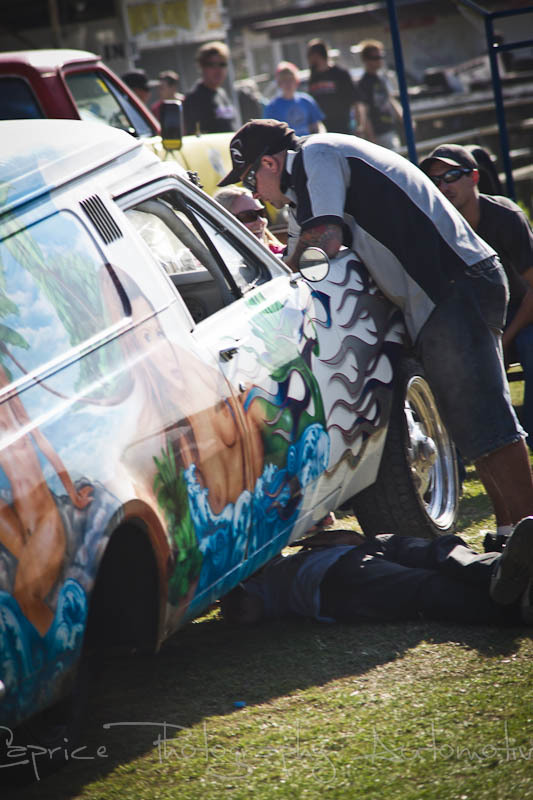 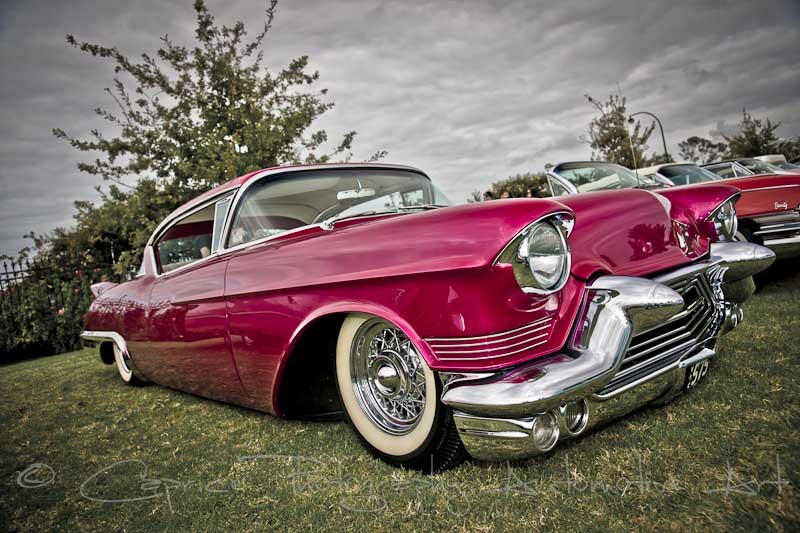 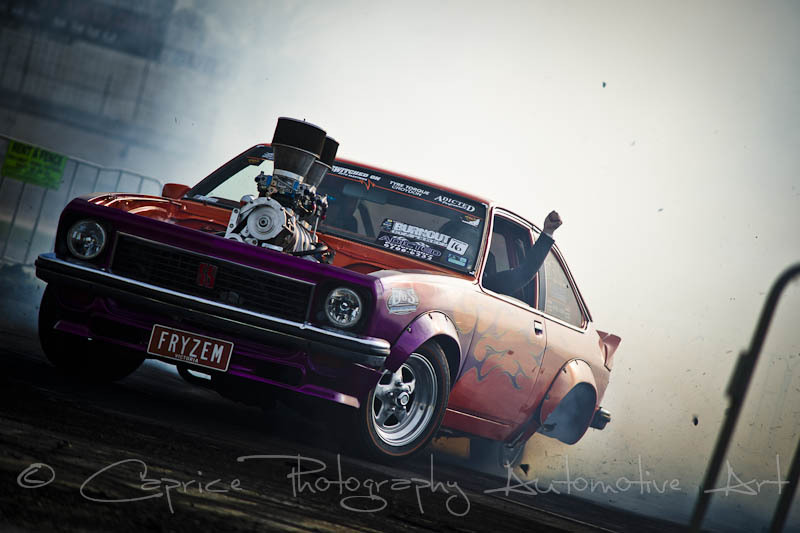 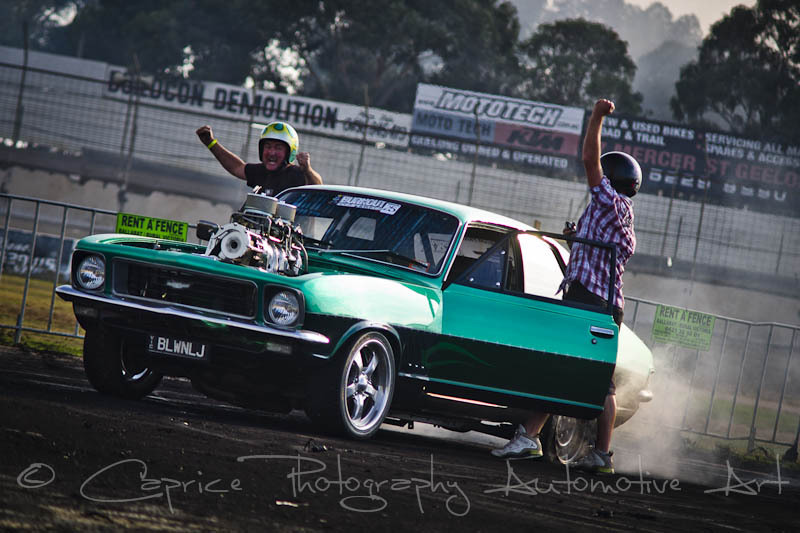 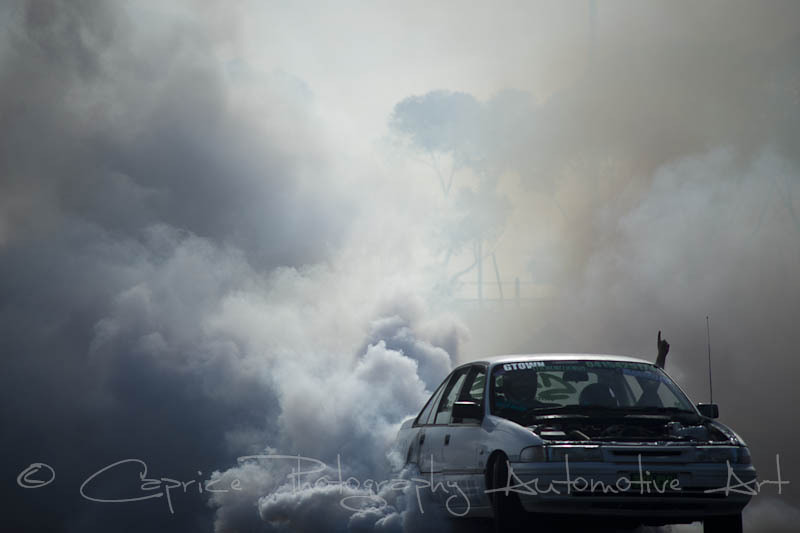 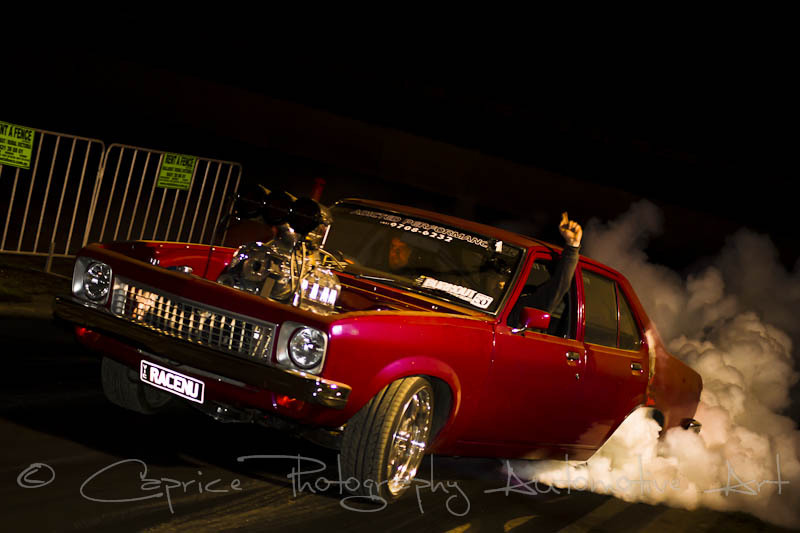 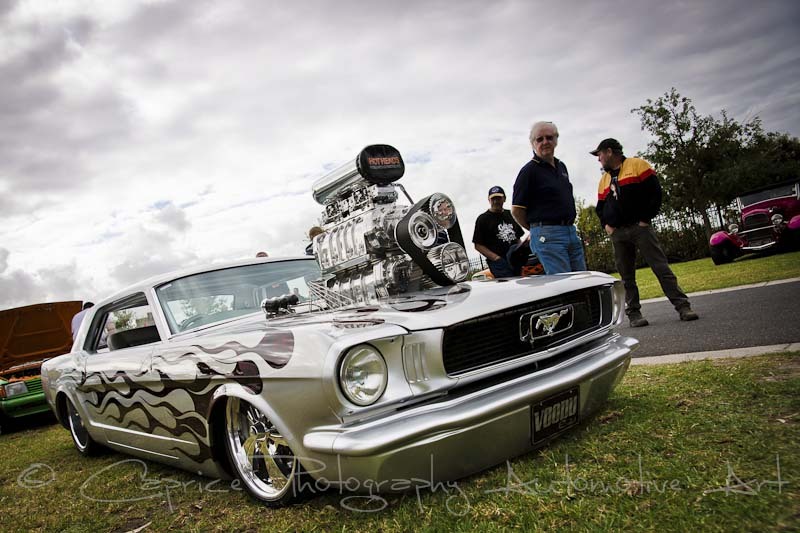 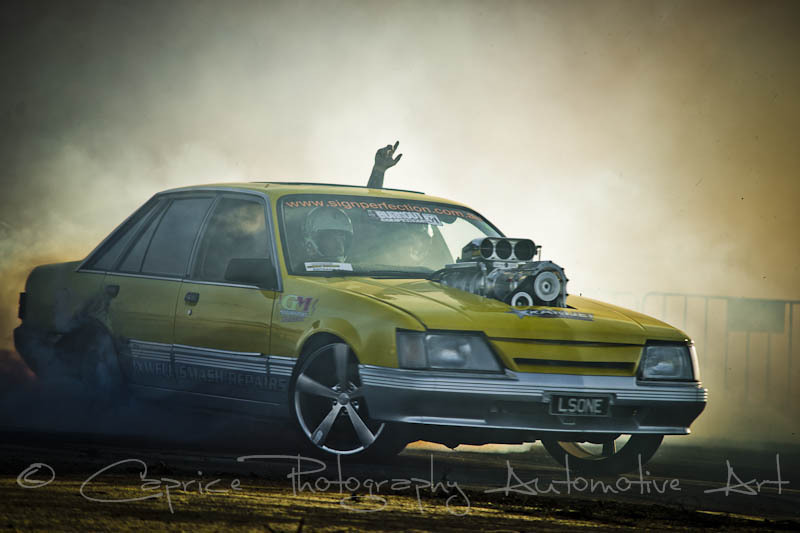 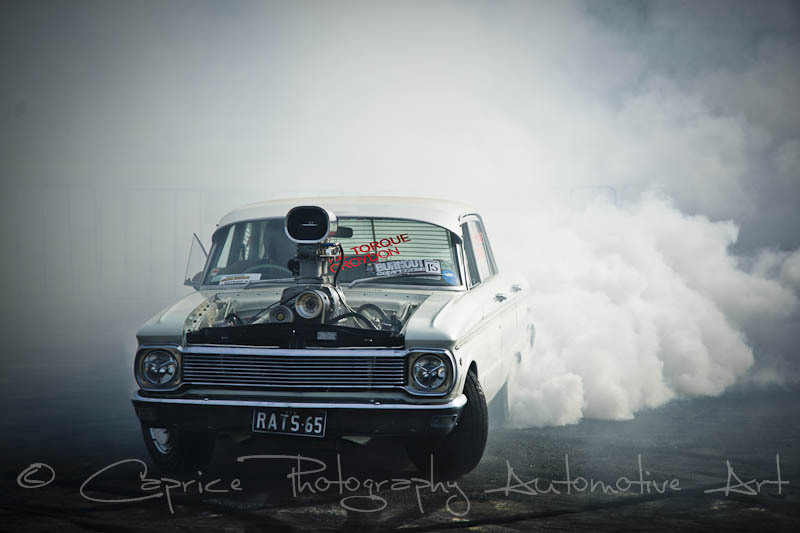 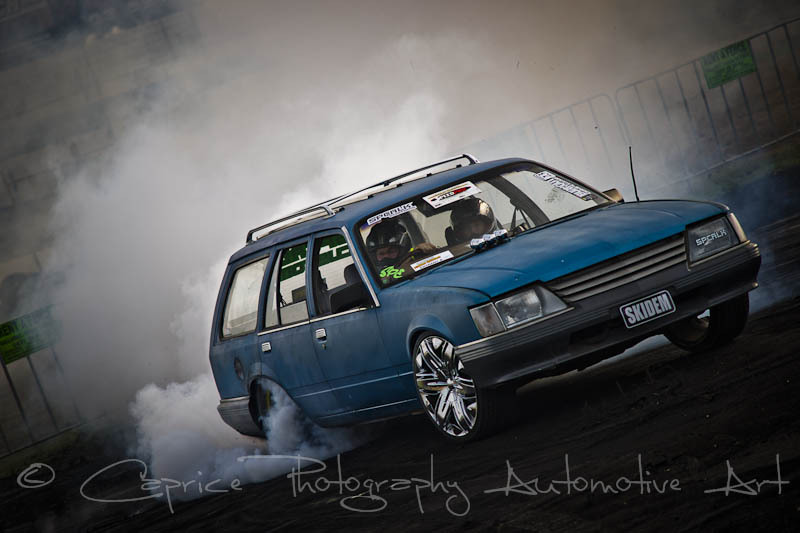 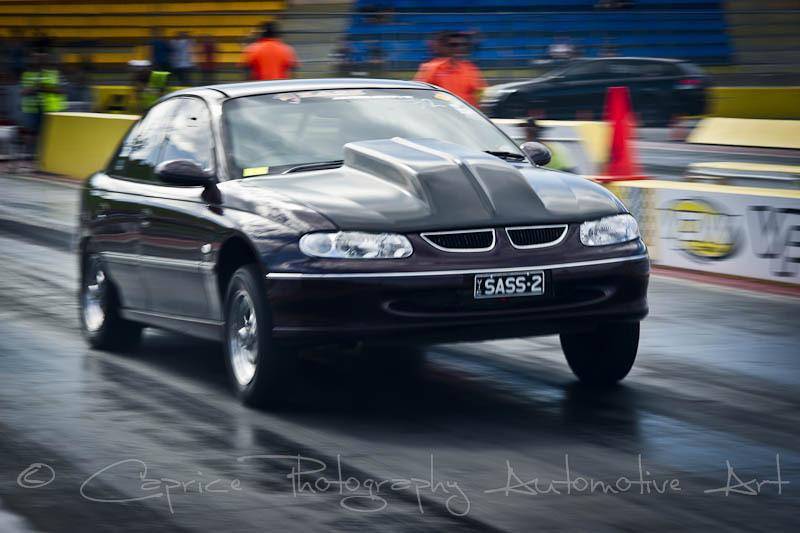 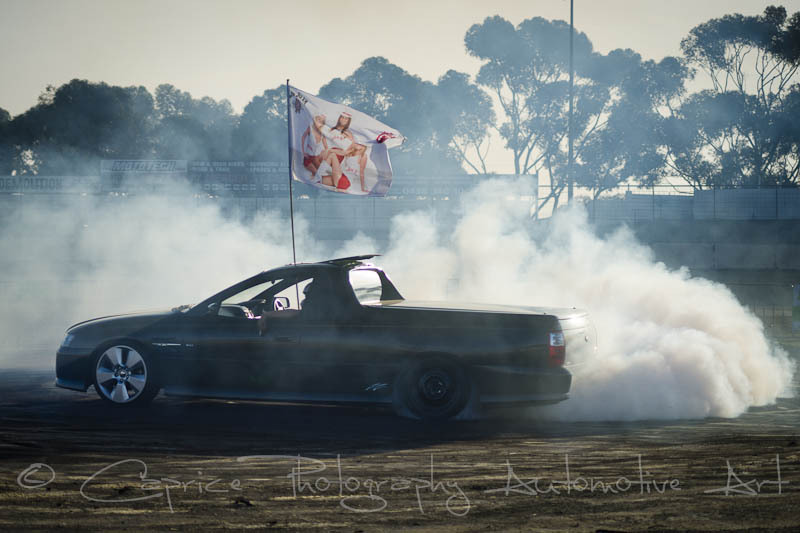 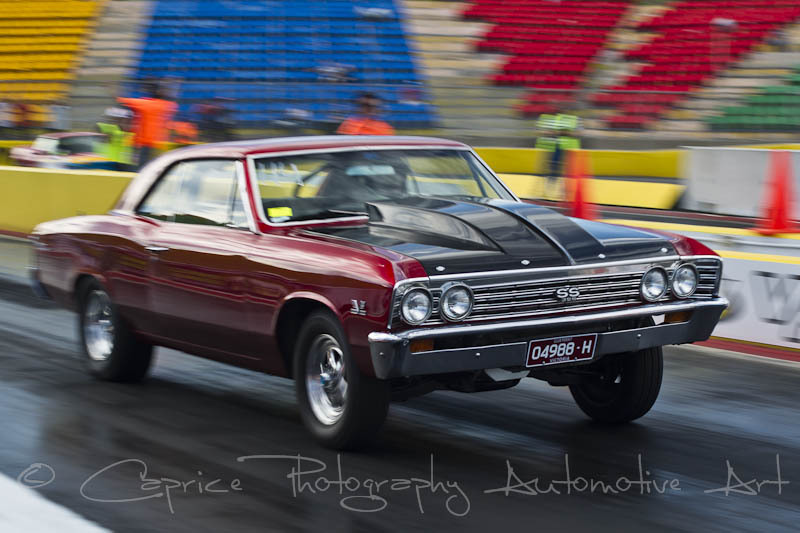 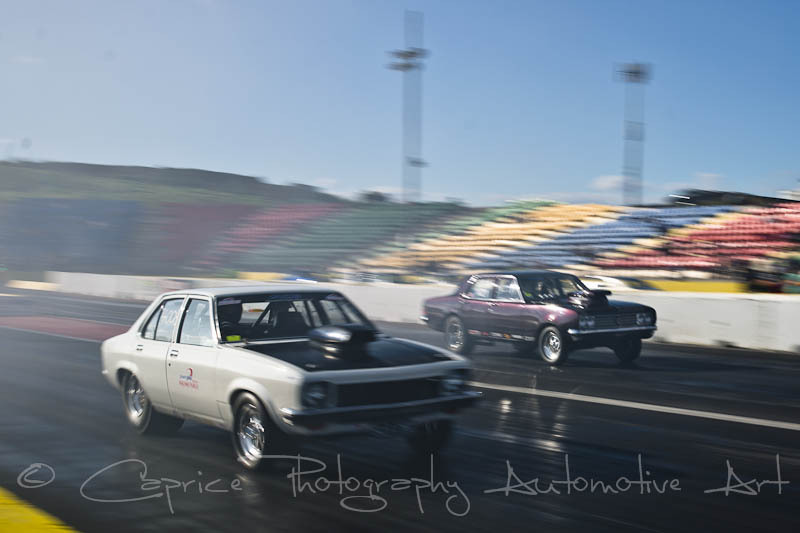 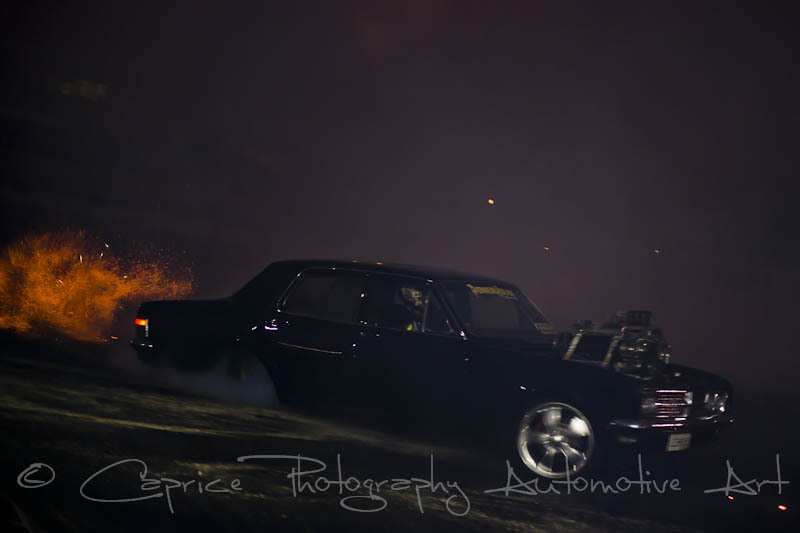 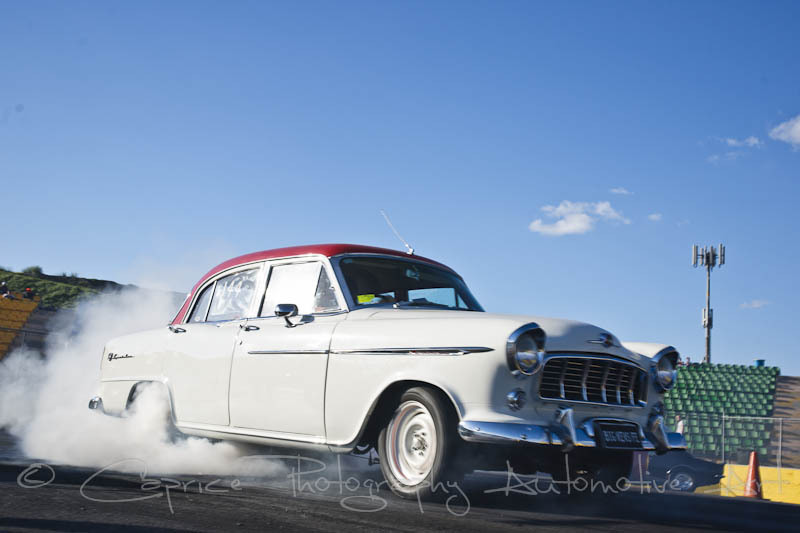 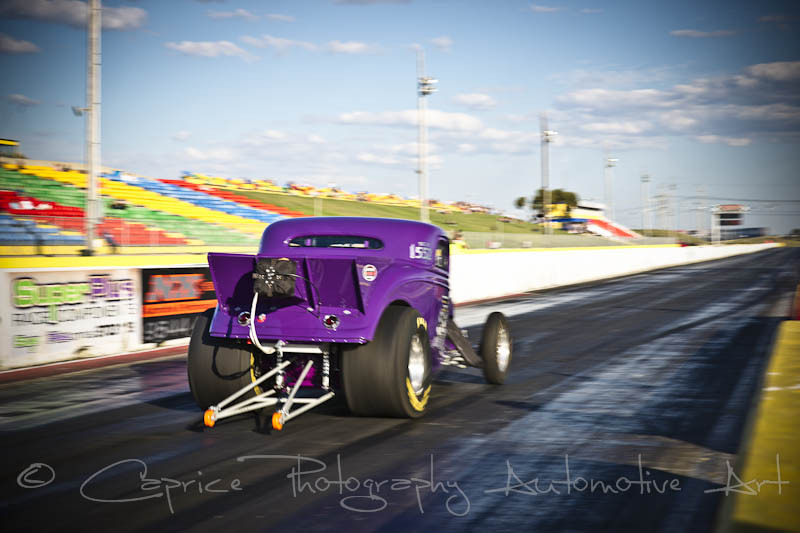 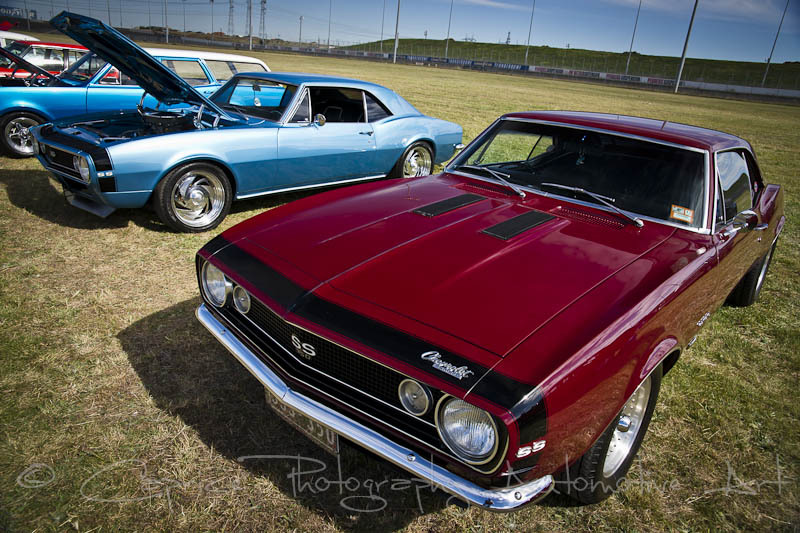 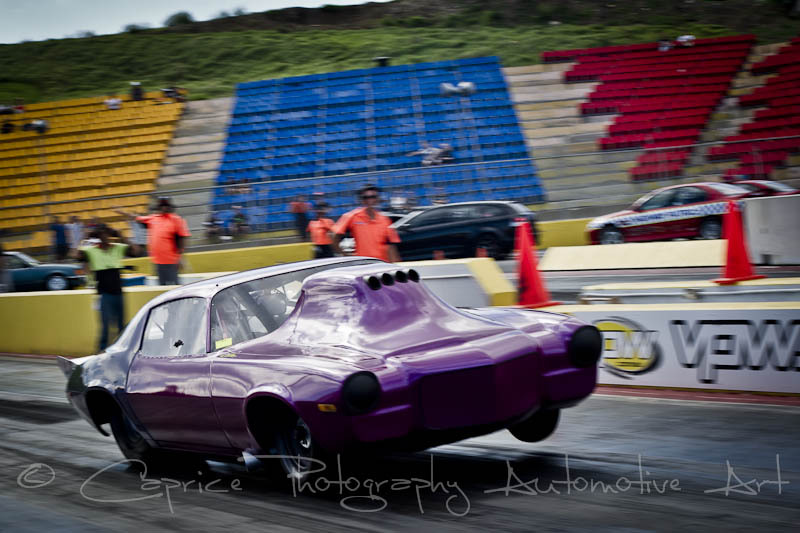 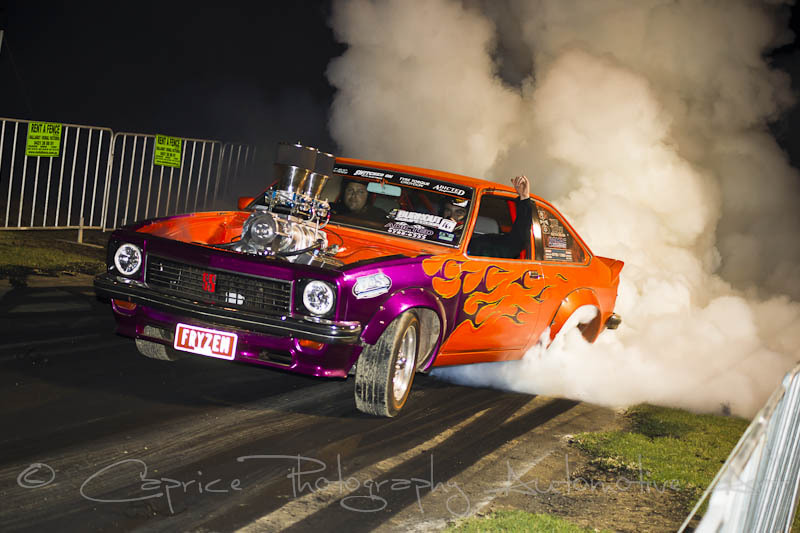 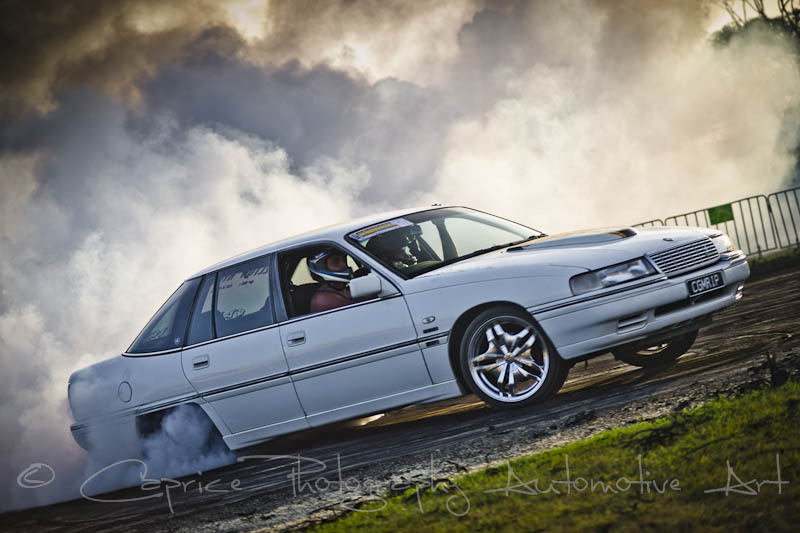 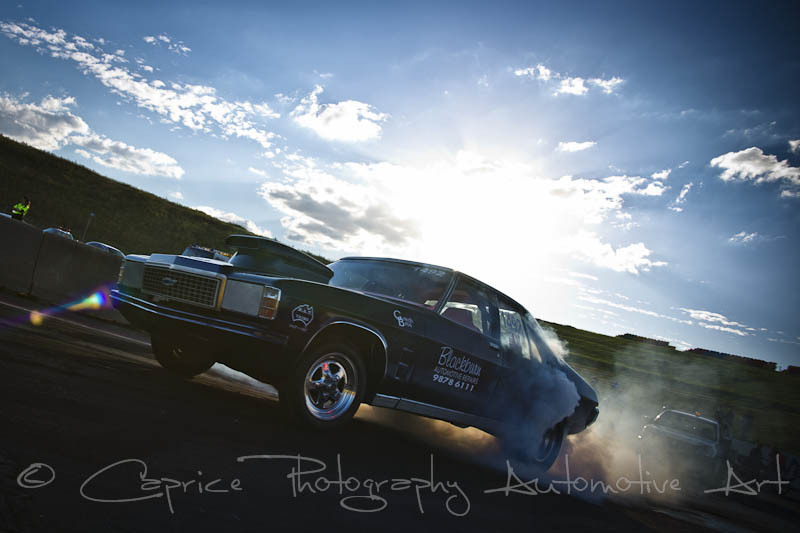 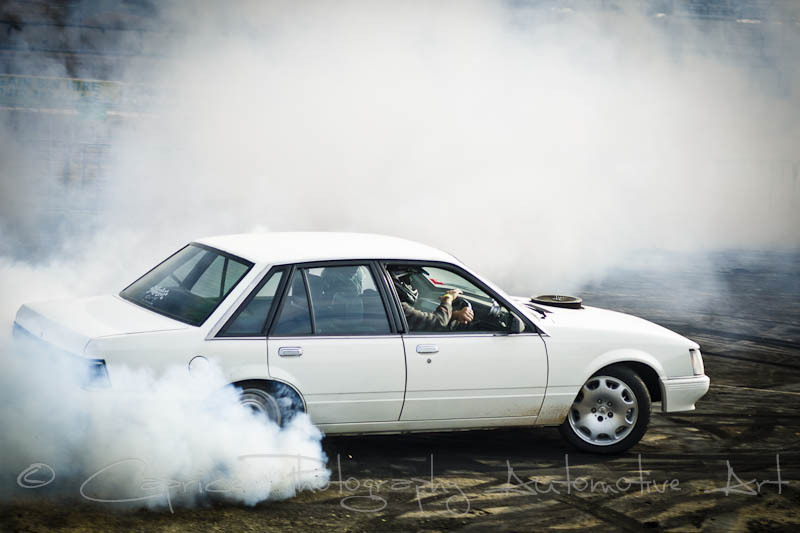 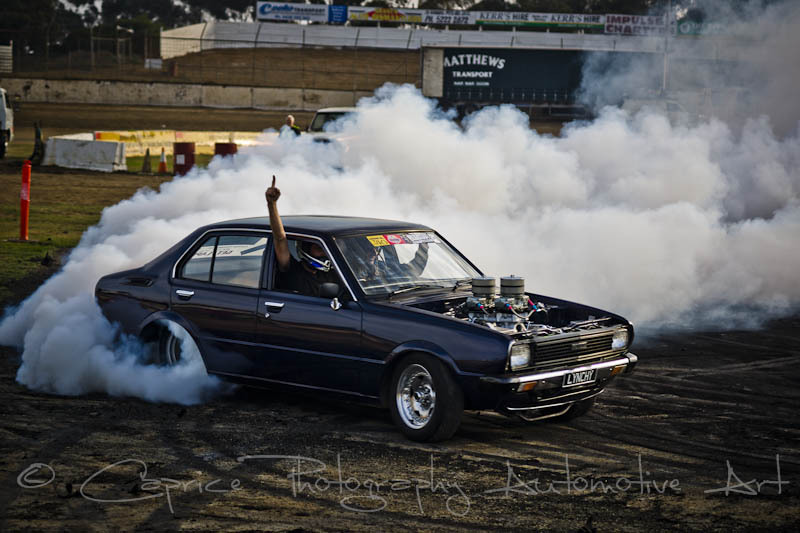 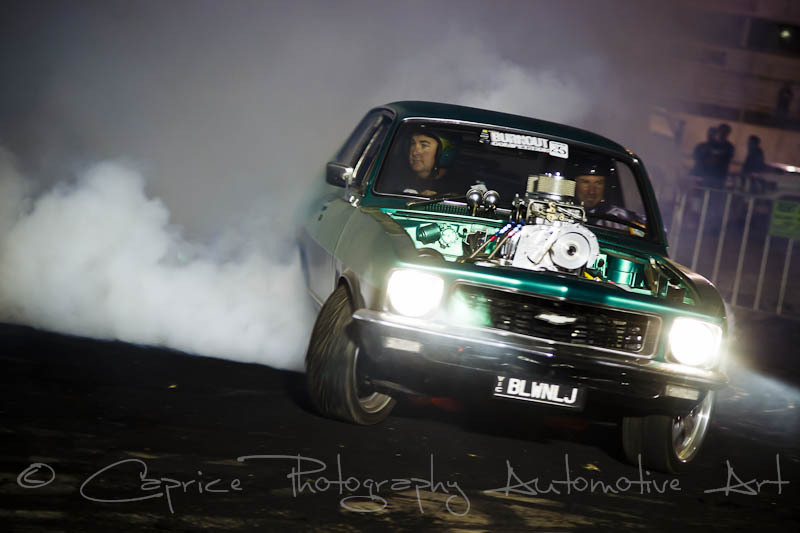 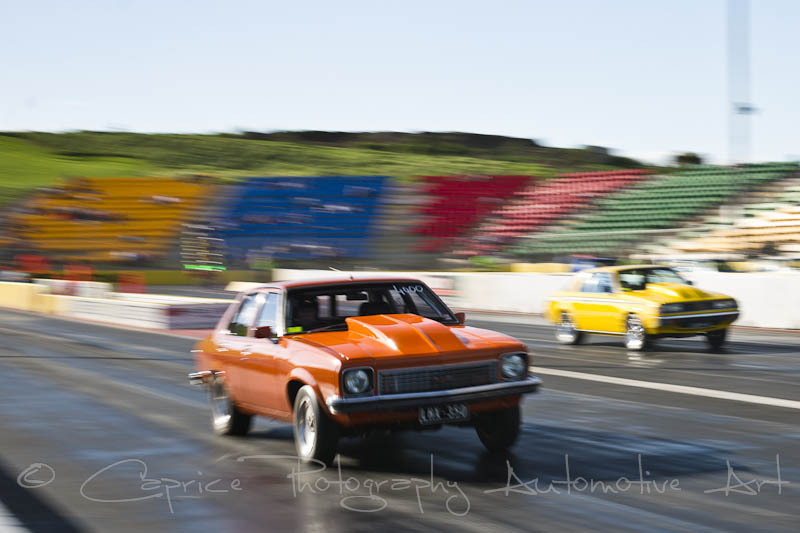 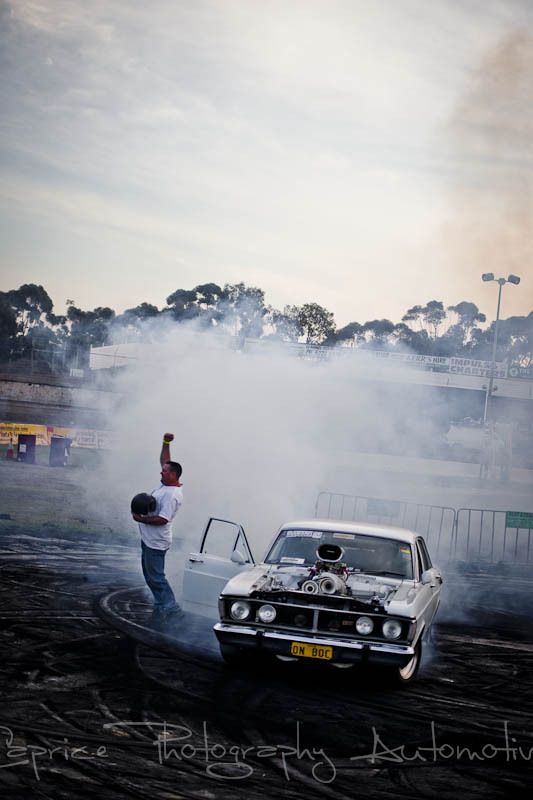 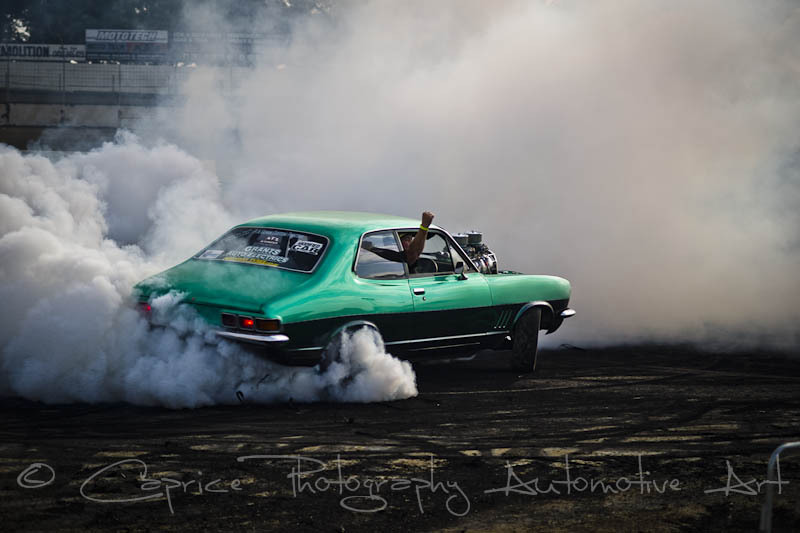 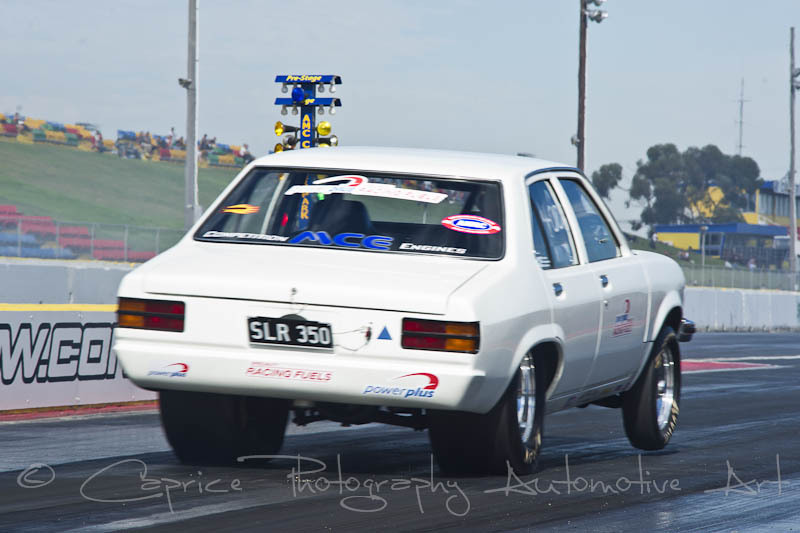 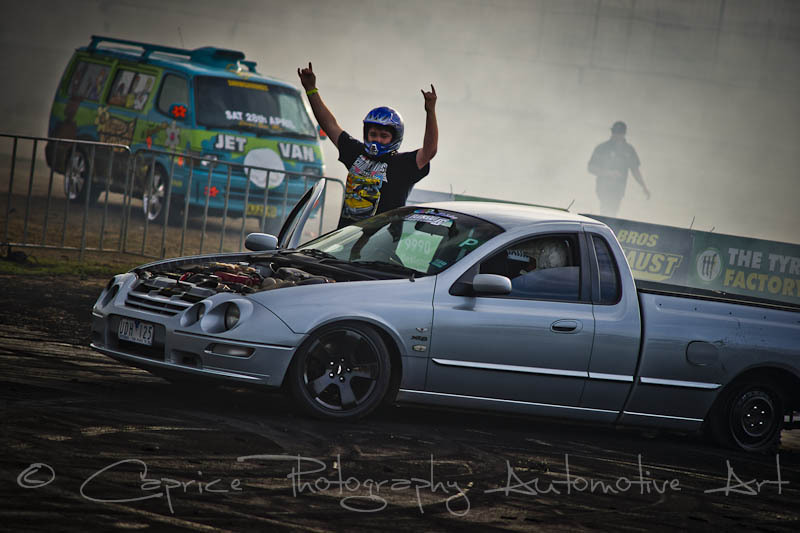 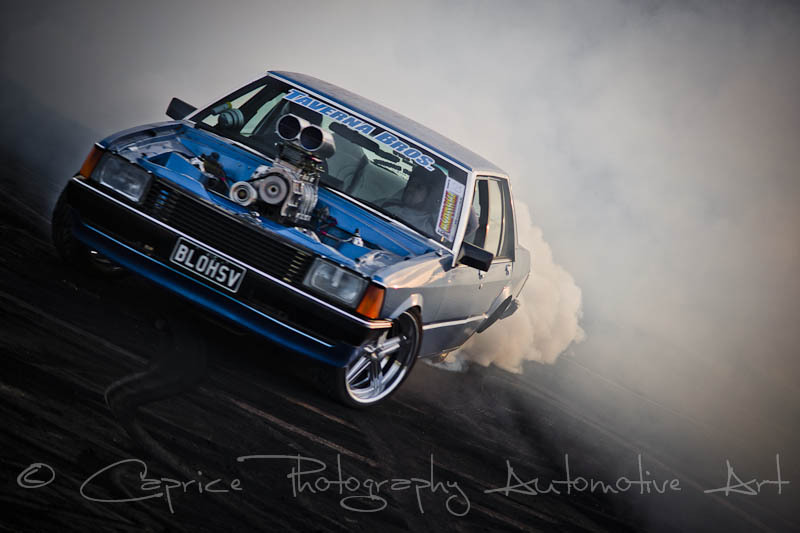 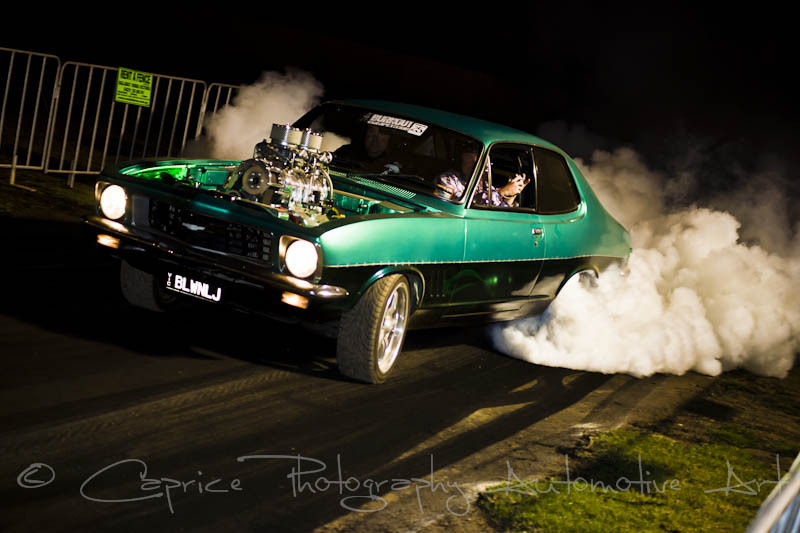 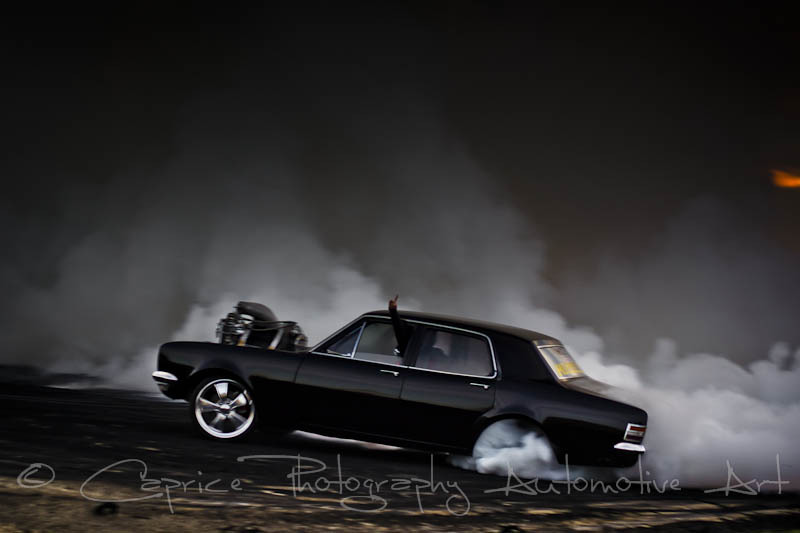 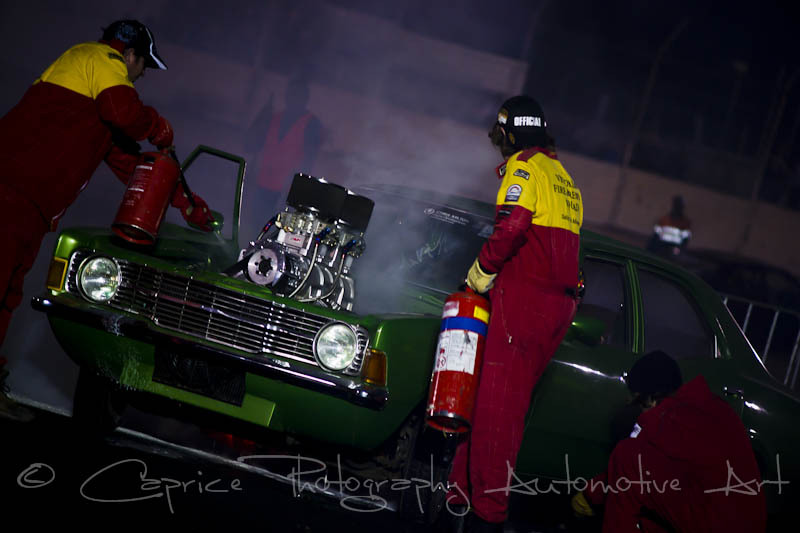 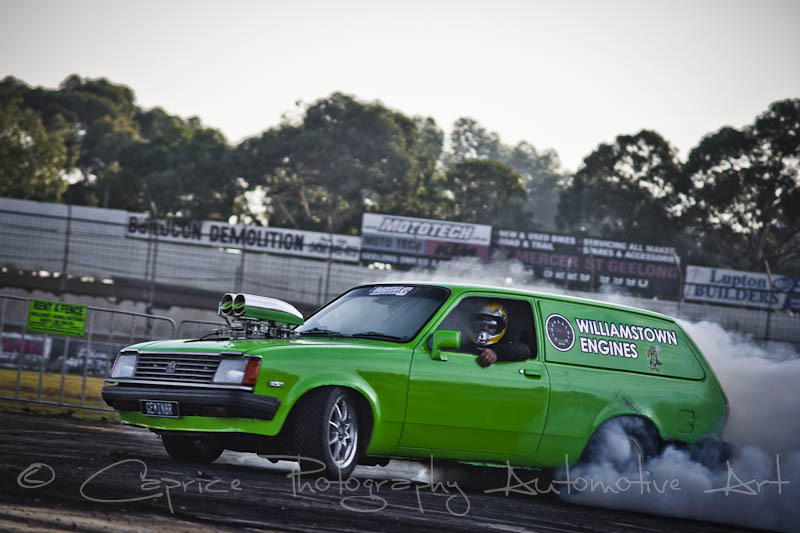 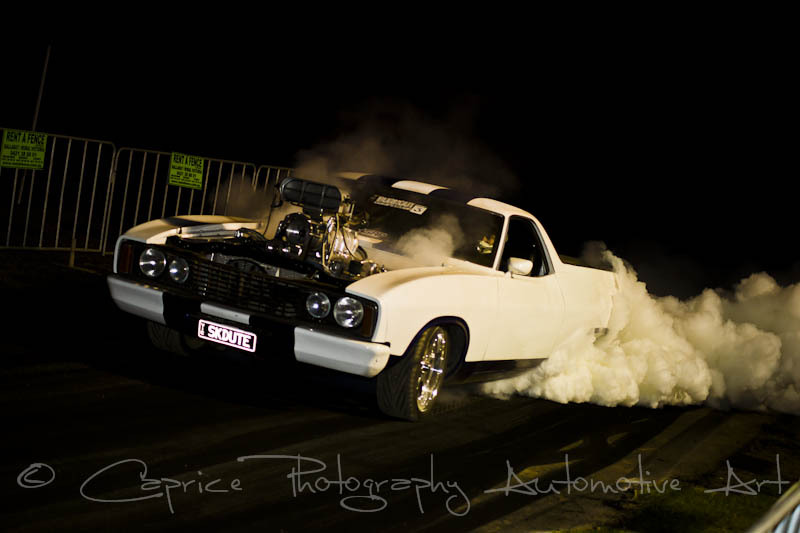 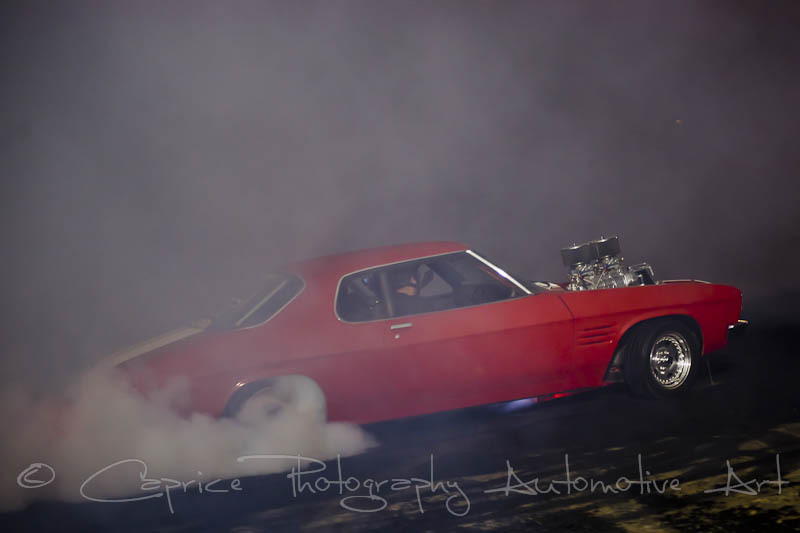 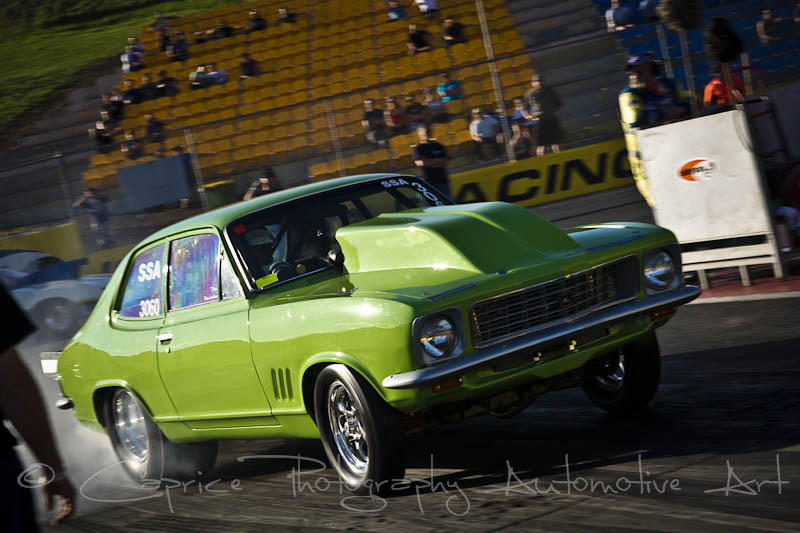 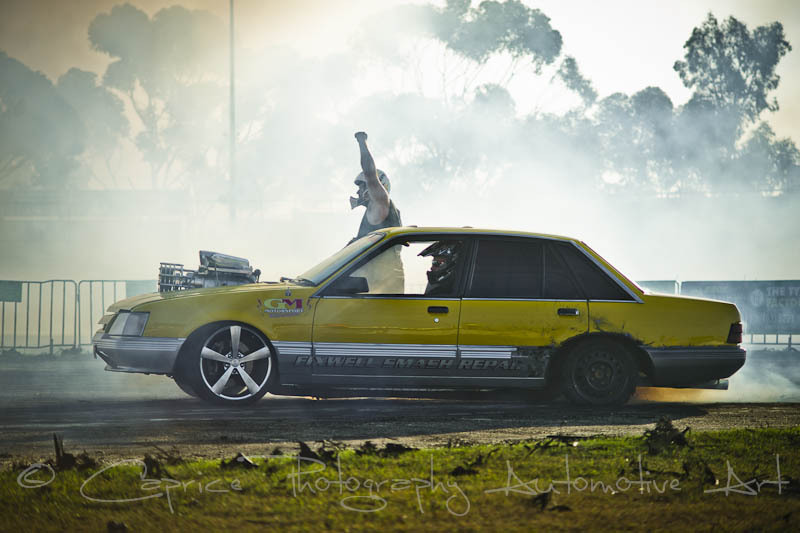 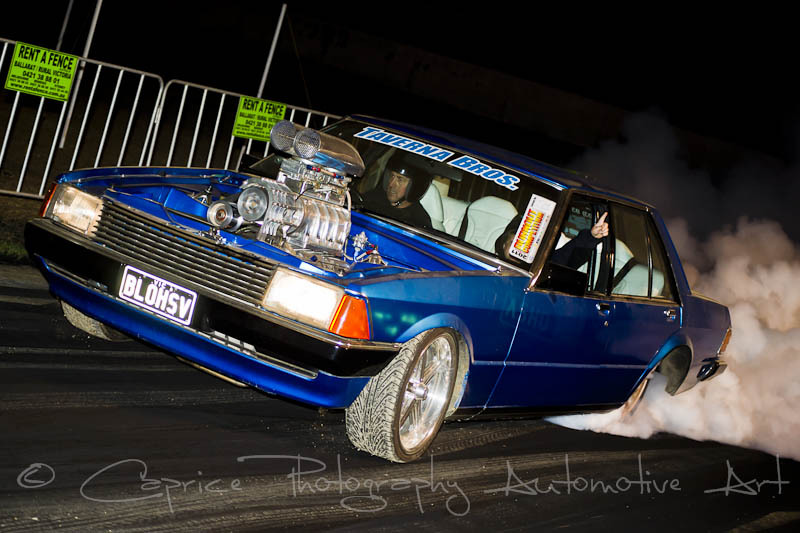 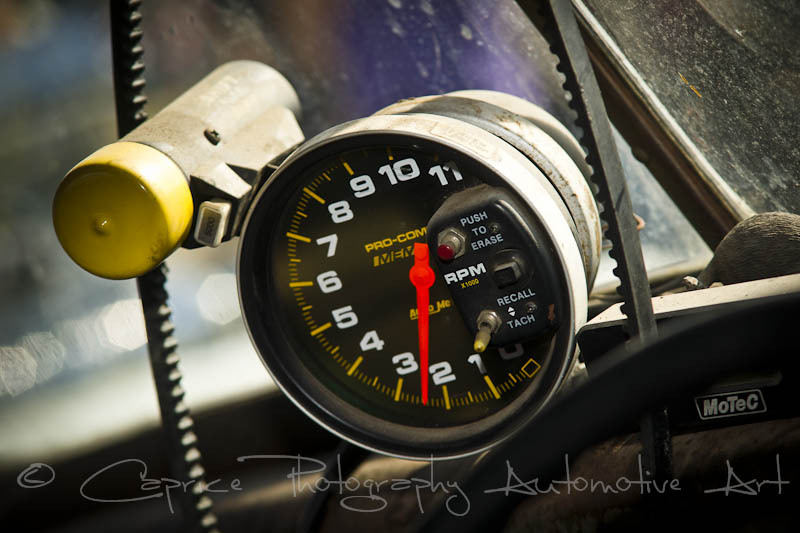 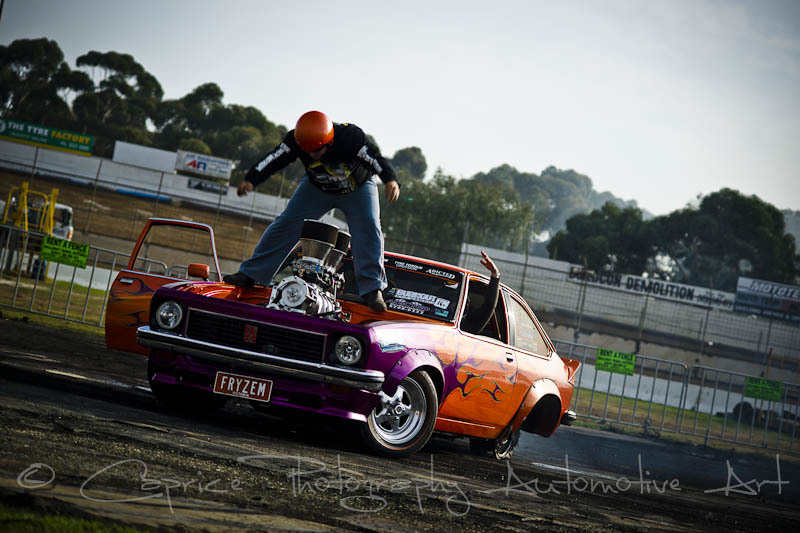 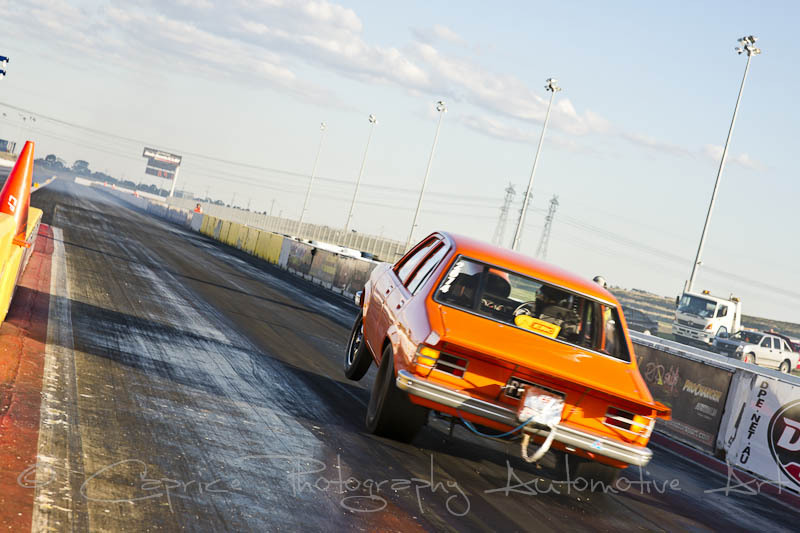 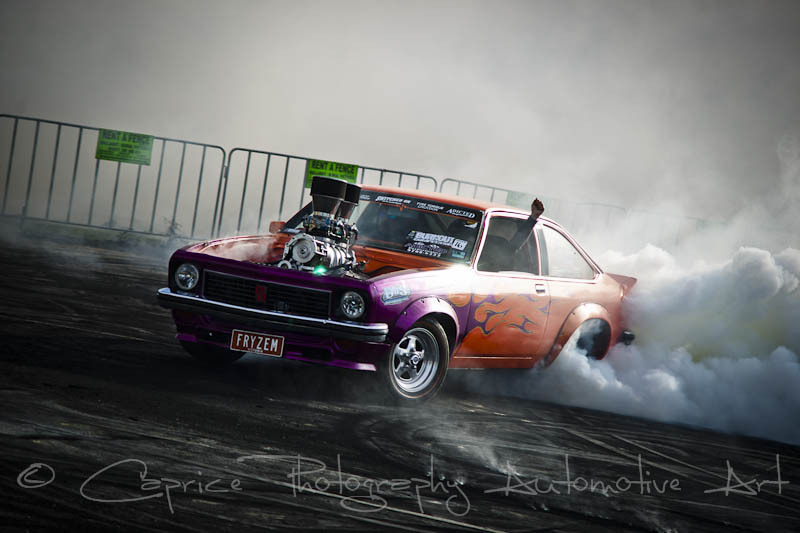 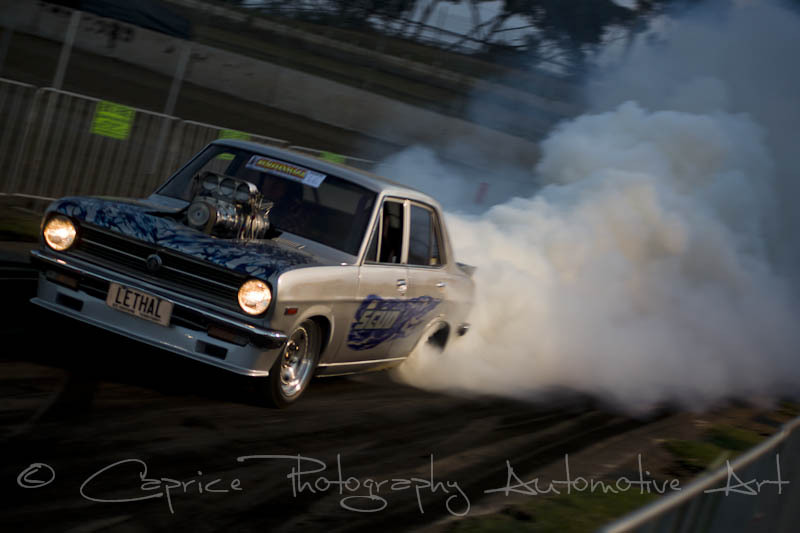 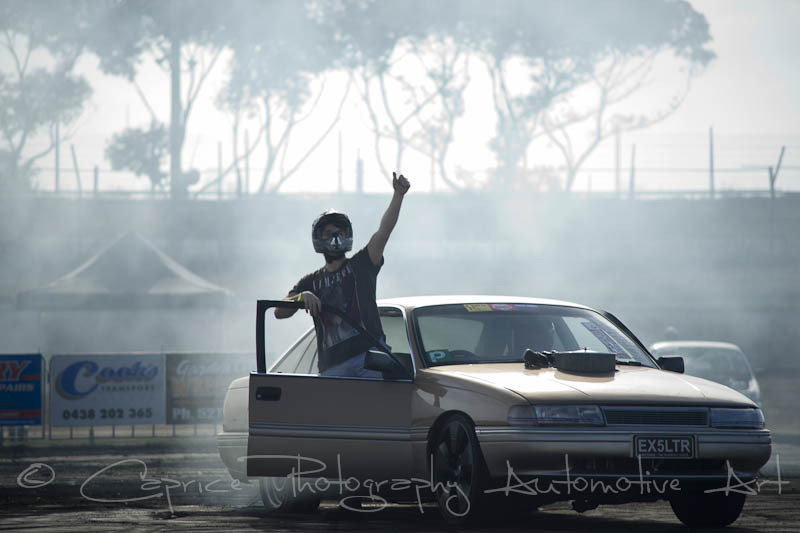 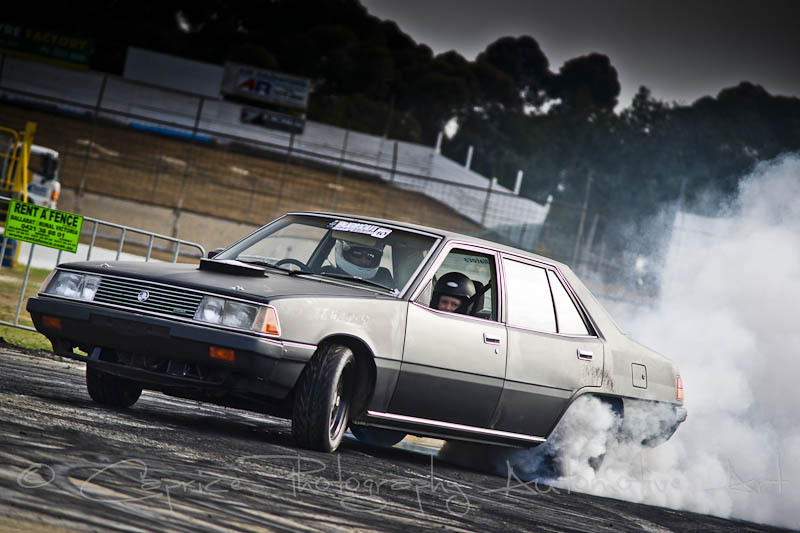 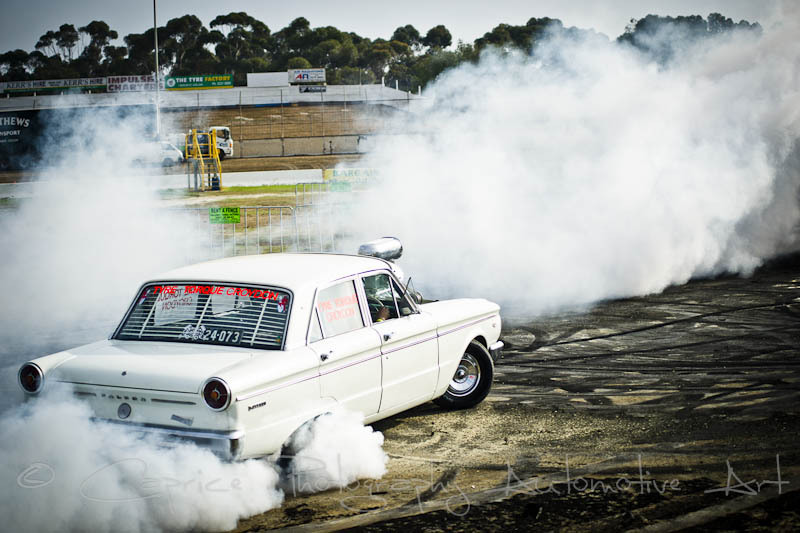 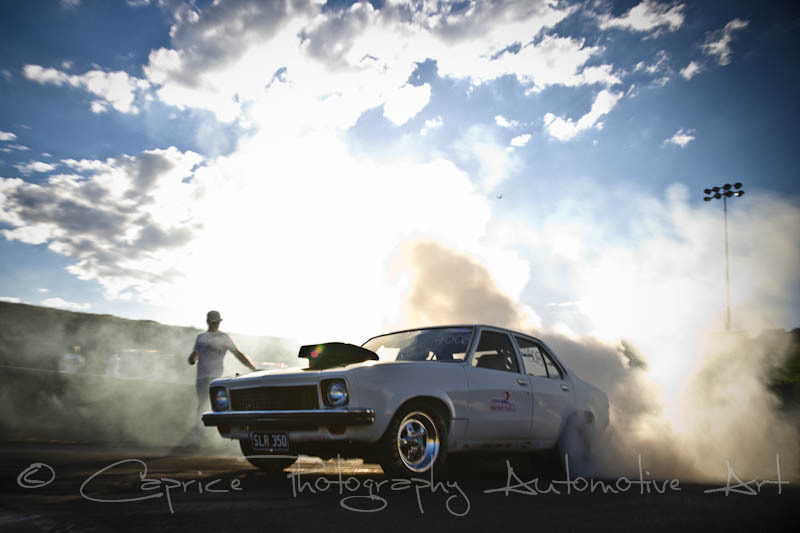 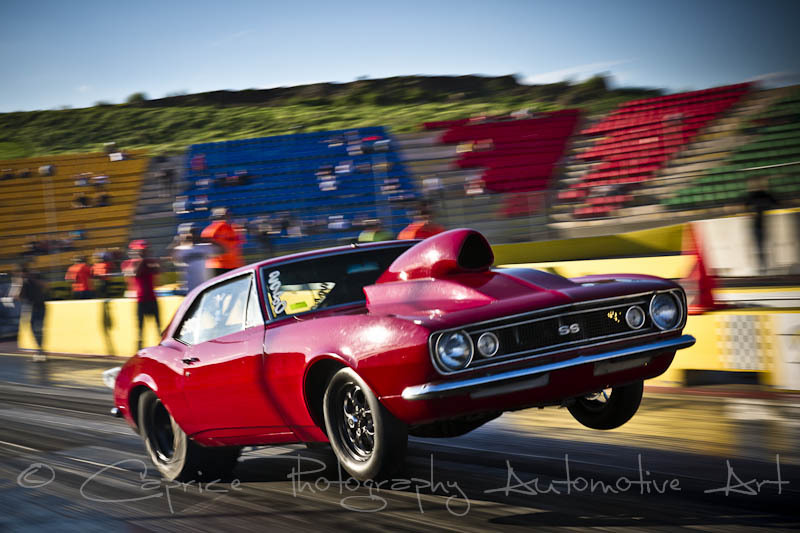 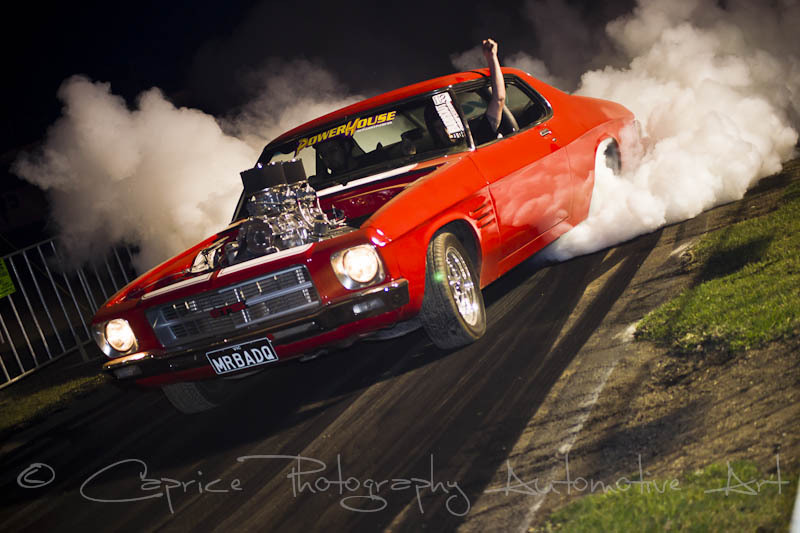 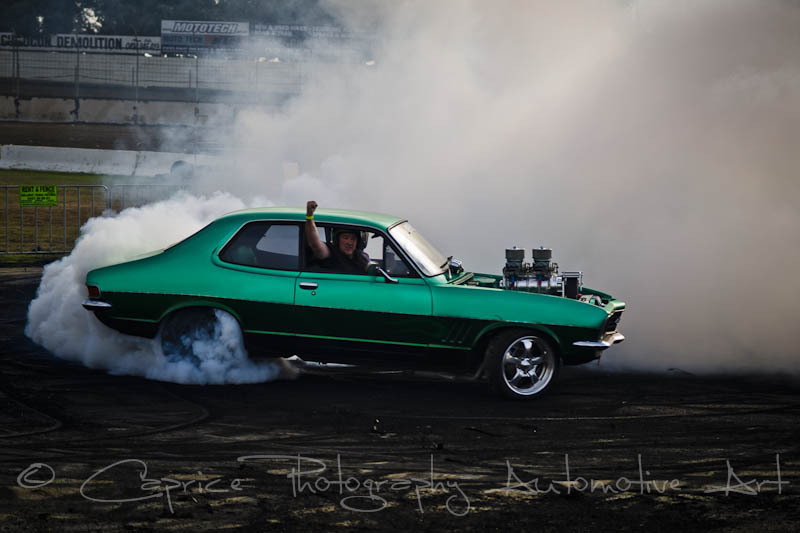 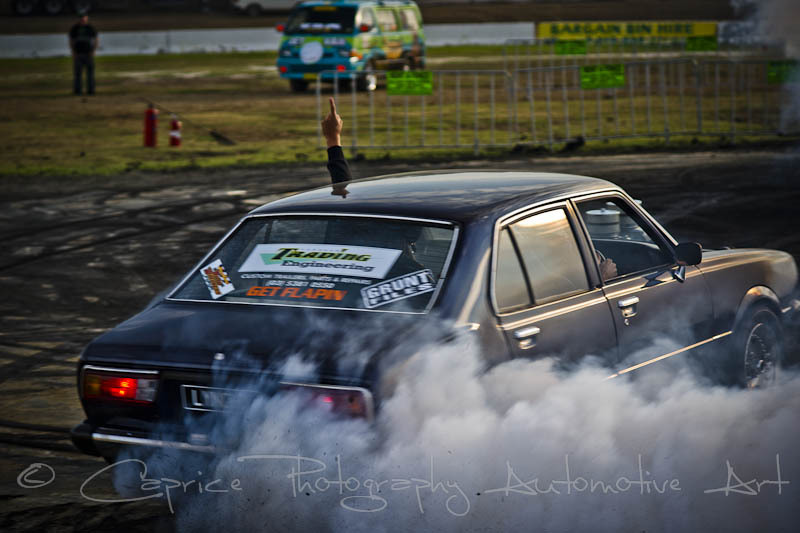 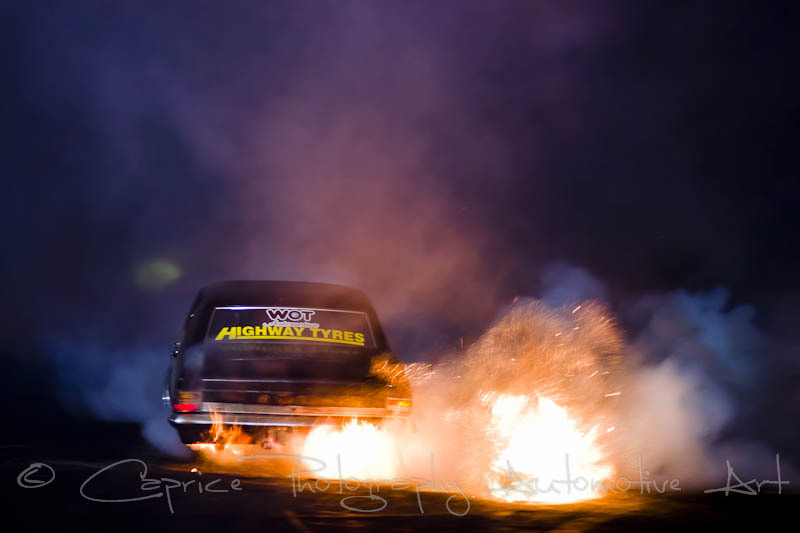 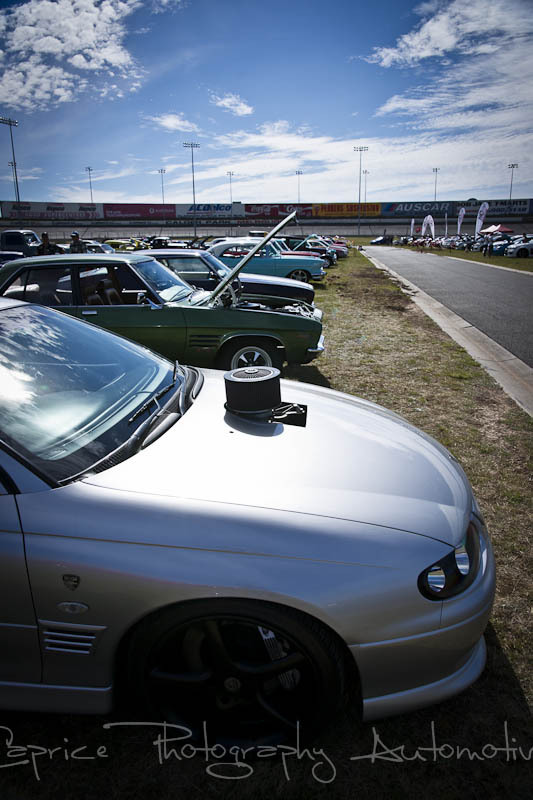 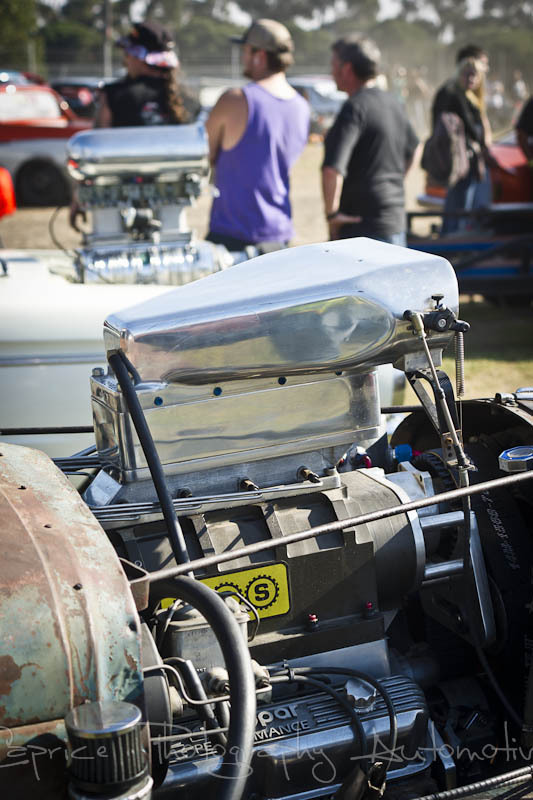 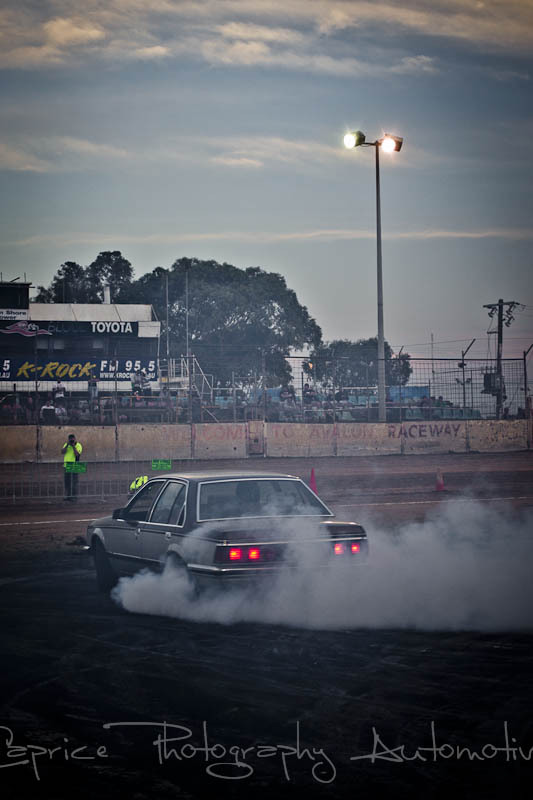 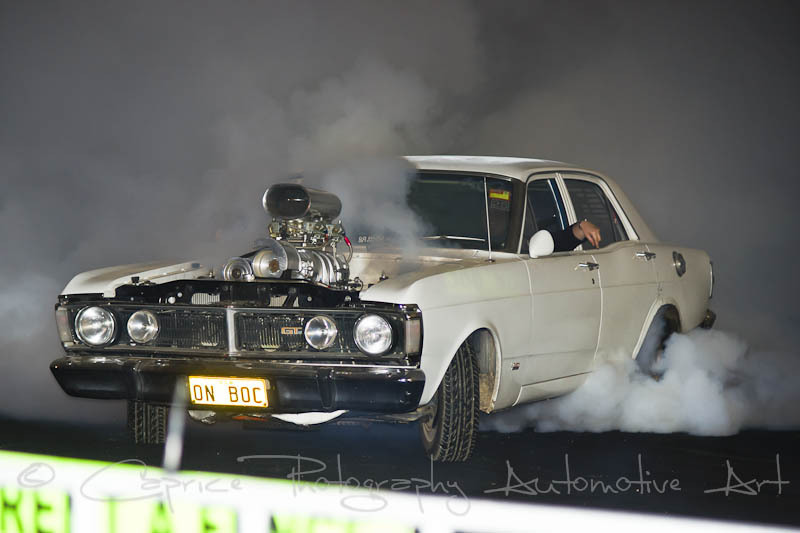 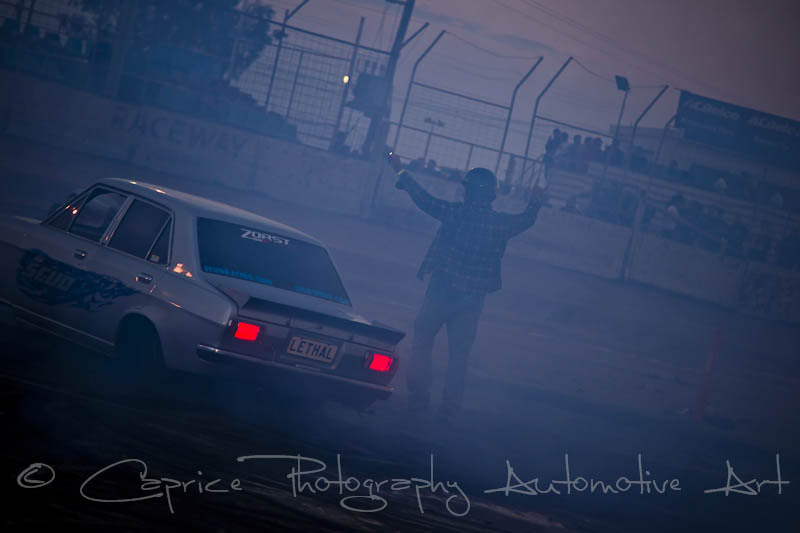 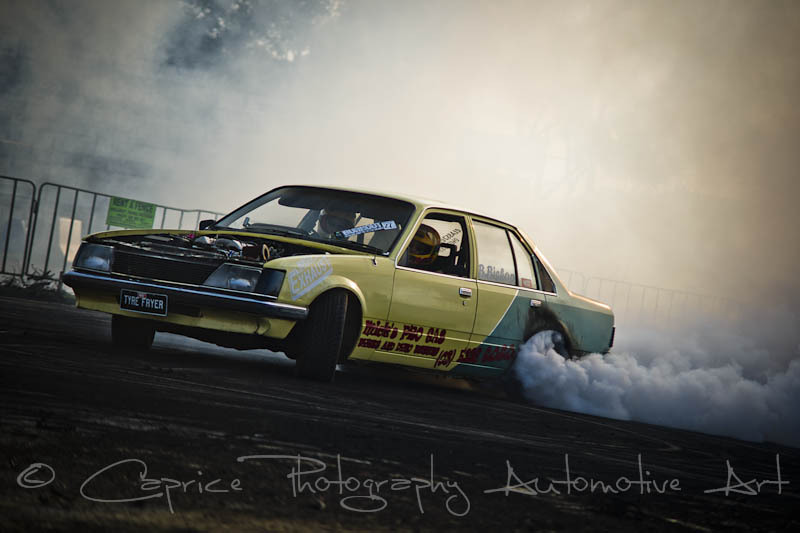 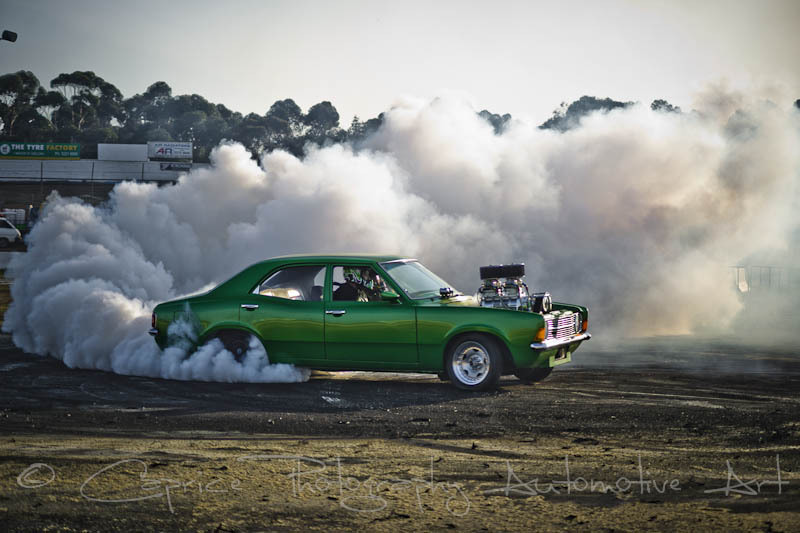 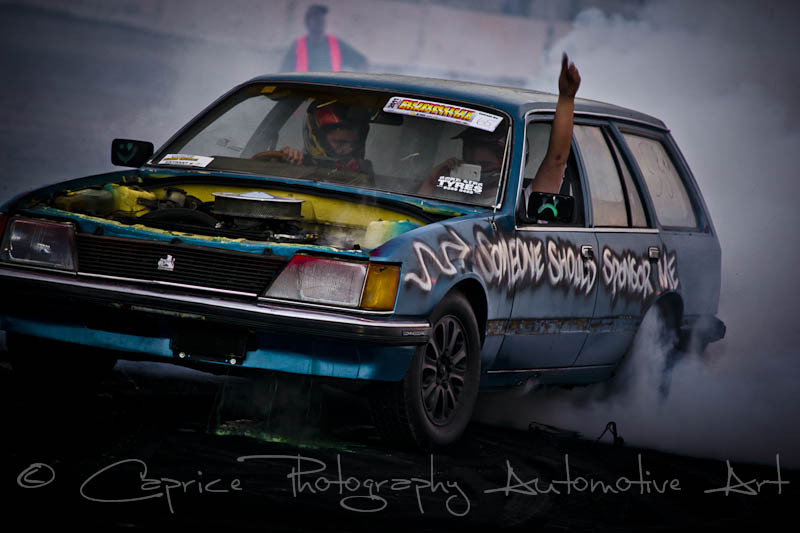 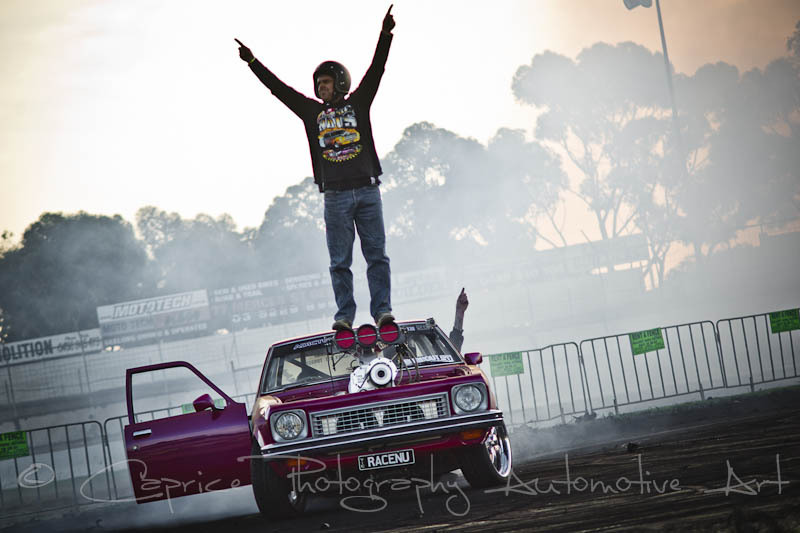 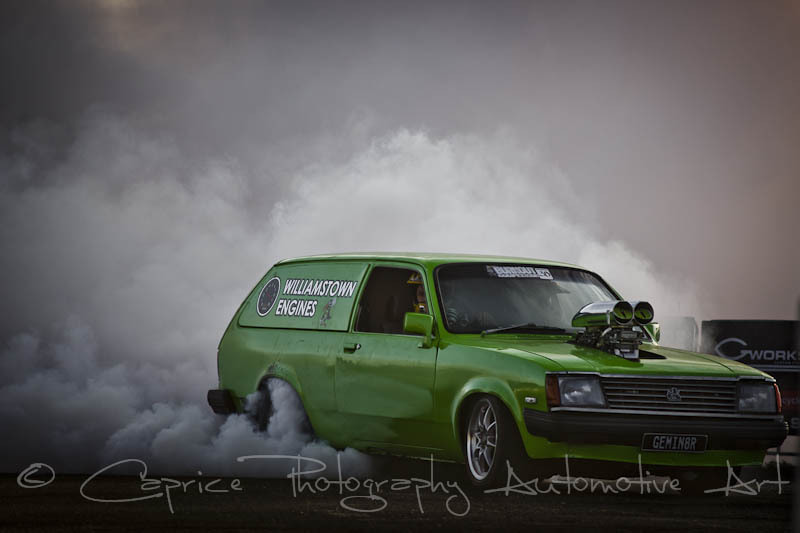 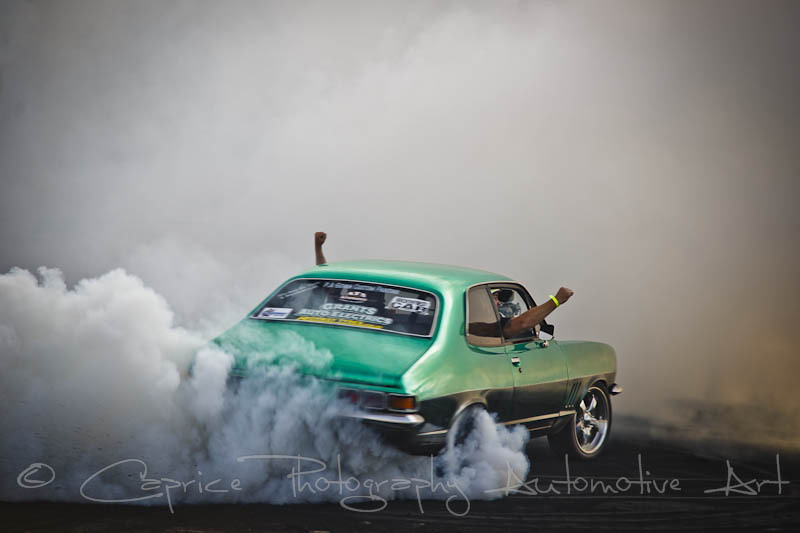 Any petrol head looking for action on Saturday would have hit nirvana if they attended the Avalon burnout competition put on by Paul and Jason Drew with assistance from Garden City Wreckers, The Picture Magazine and other various sponsors. 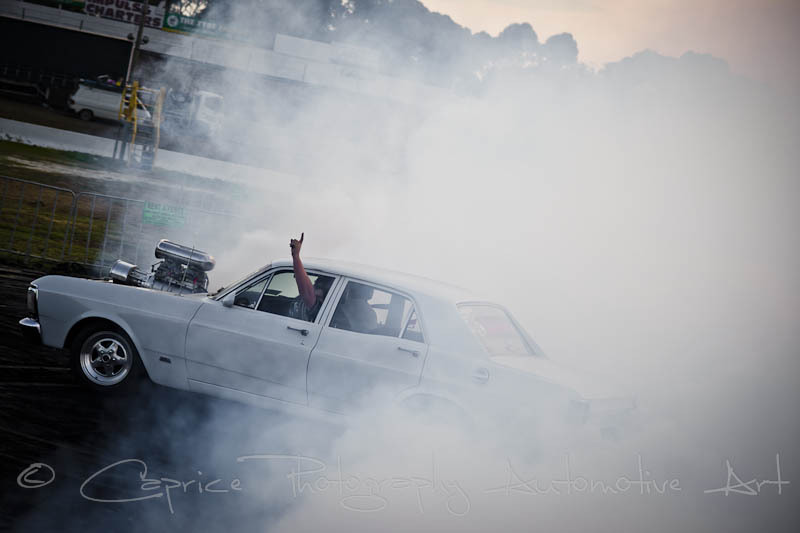 With five grand cash up for grabs, over sixty entrants signed up to have a go at conquering the pad while entertaining the smoke hungry crowd. 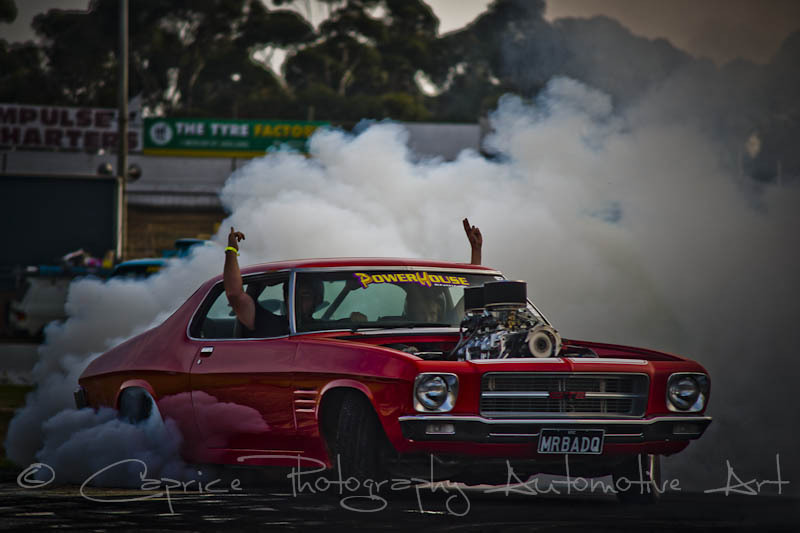 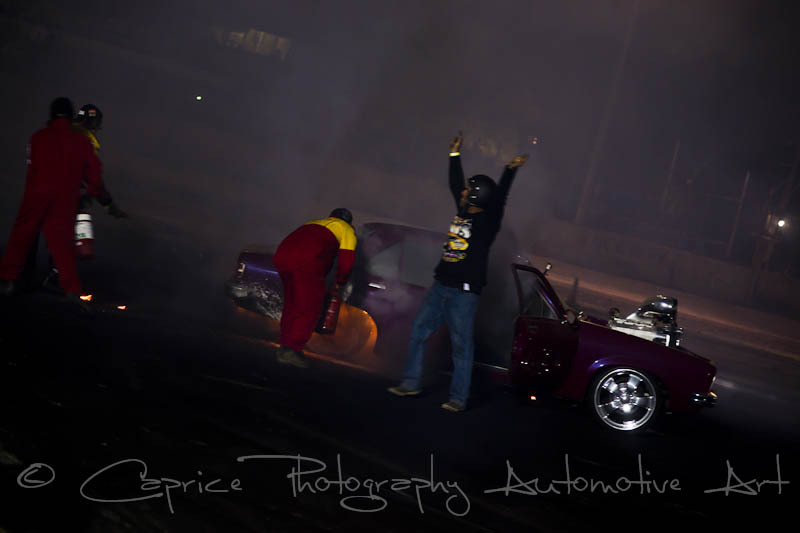 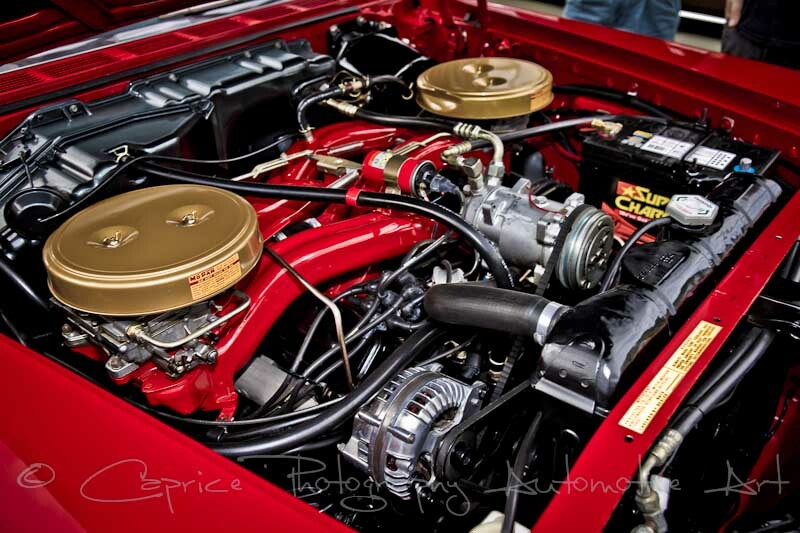 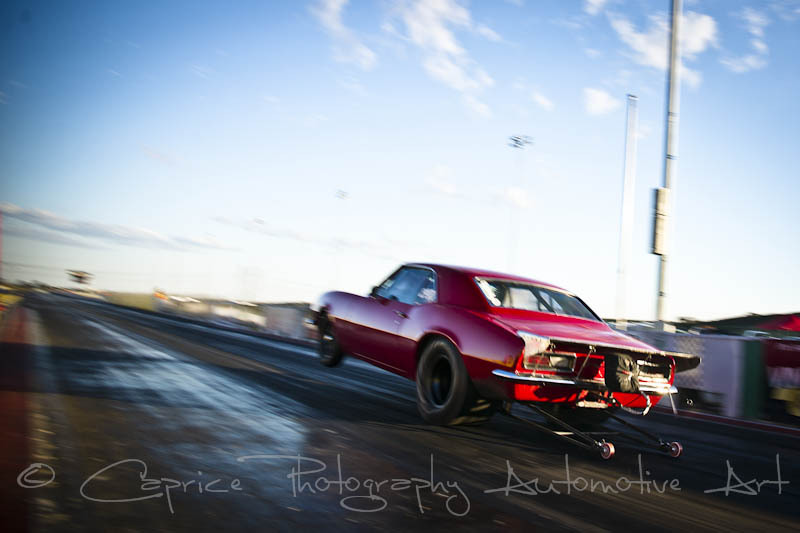 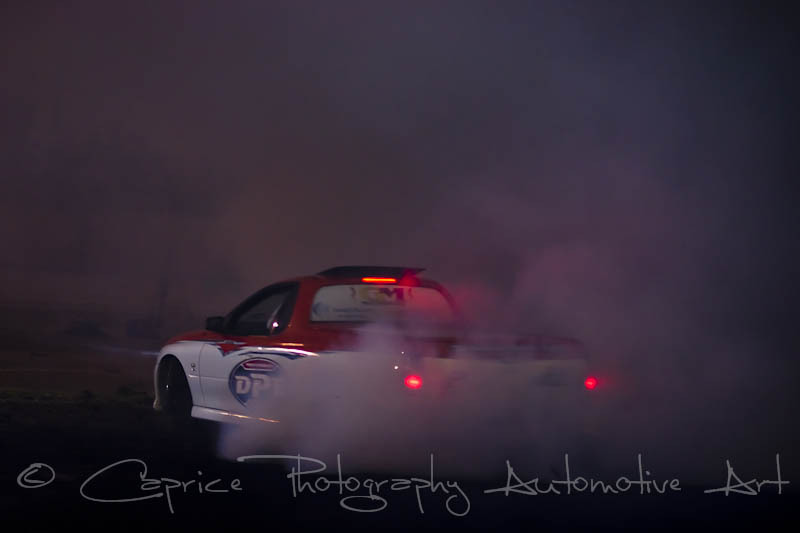 The howl of blowers, the scream of turbos and the roar of untamed donks filled the cool Autumn air while entrants went about shredding tires, boiling radiators and heating their exhausts up red hot to the point it’d fry the paint off the floor. 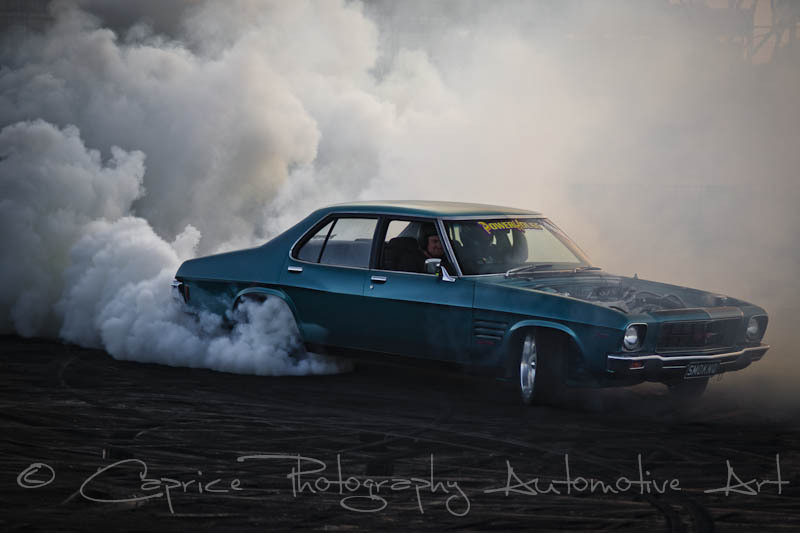 With little to no wind available, many were lost in their own smoke to what seemed an eternity leaving us to wonder what they were doing in there. 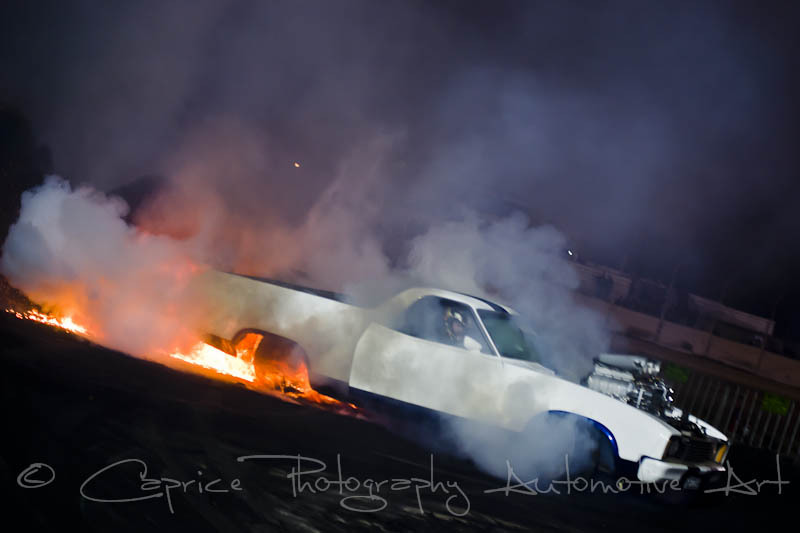 While some were busy chewing on the fencing, others seemed content to bask in the glow of the shift light screaming at them “change up, change up!” as they negotiated their way around the rubber hungry pad. 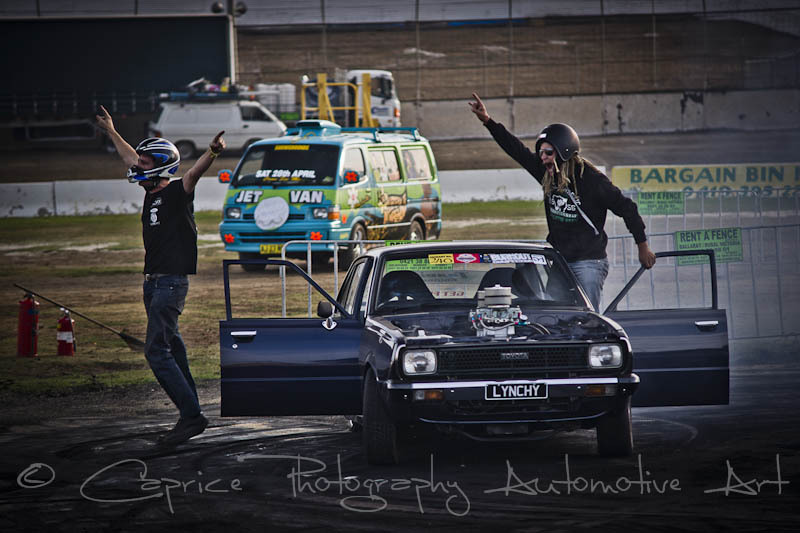 The girls from Picture magazine provided the half time entertainment by strutting their stuff on stage with an invitation to audience members to participate as well. 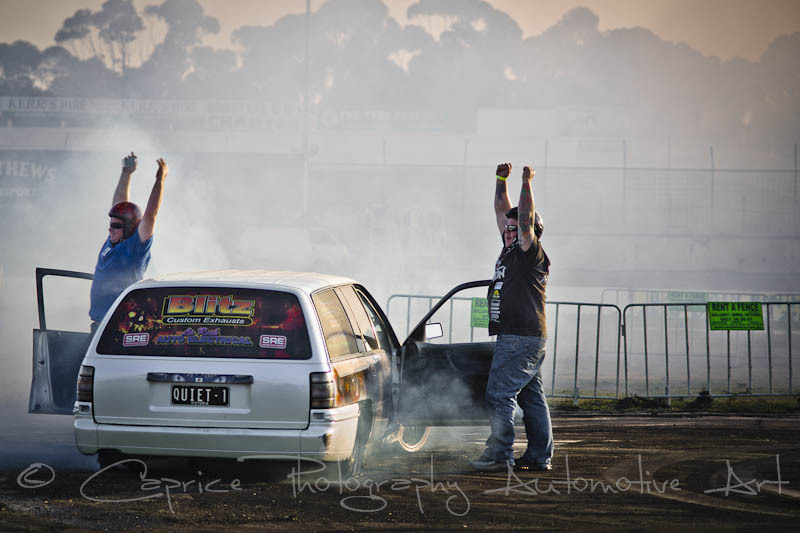 The competition was tough so it was left up to the raucous mob to decide the winner which they had no objections to. 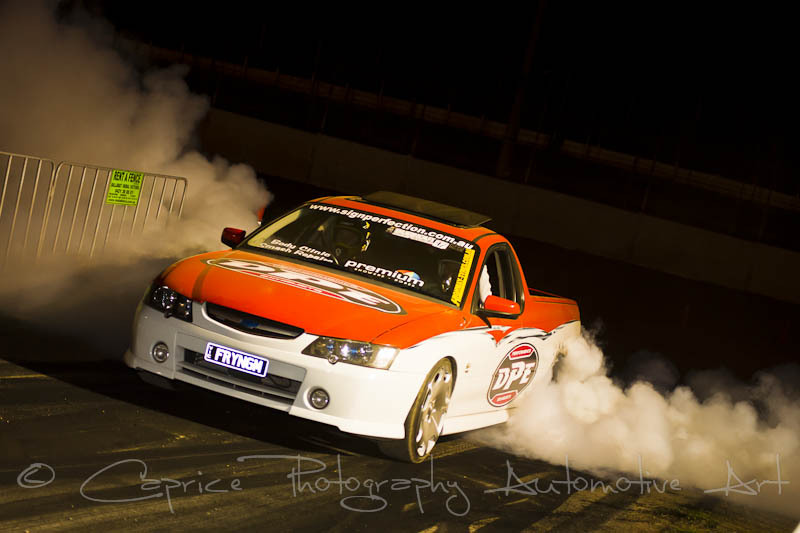 As dusk fell over the raceway, it was up to the top fifteen to put their skills to the decisive test doing what they do best while under lights. 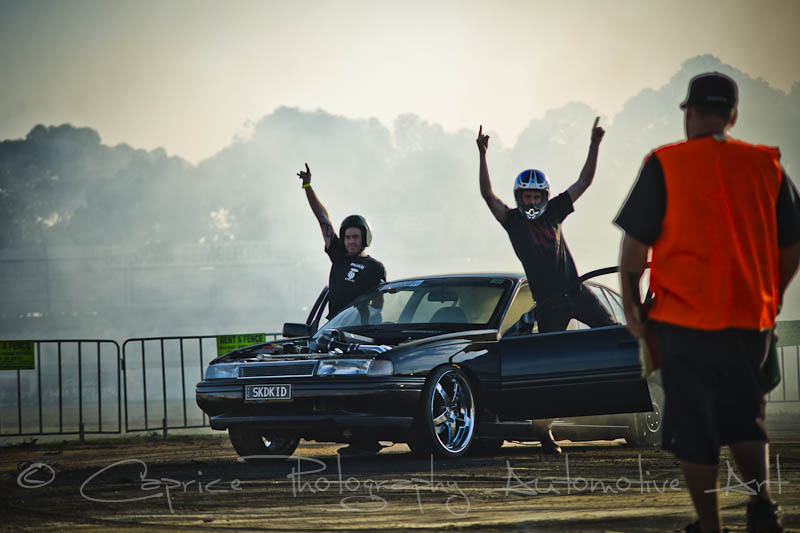 One by one they threw down the gauntlet with some surviving to the finish while others exited in spectacular fashion. 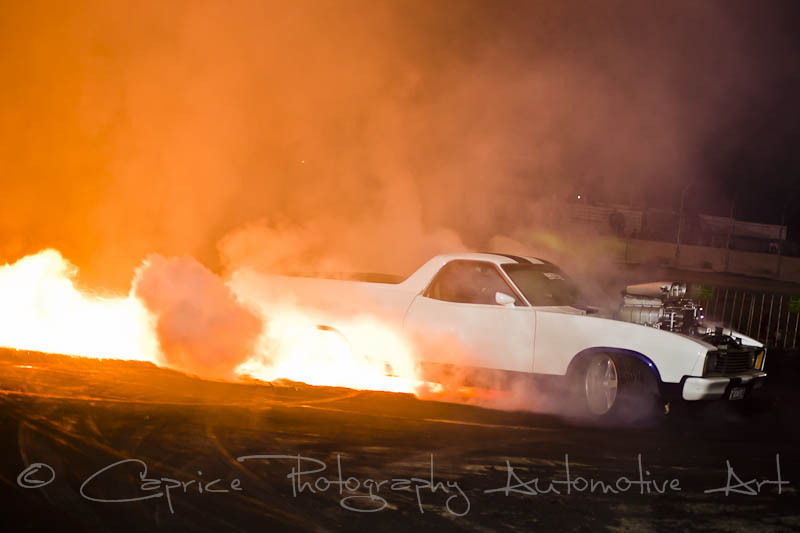 Flame ups would inevitably count as the ultimate burnout seeing the rear ends do away with custom paint jobs while adding a new one giving new meaning to a “flame job”. 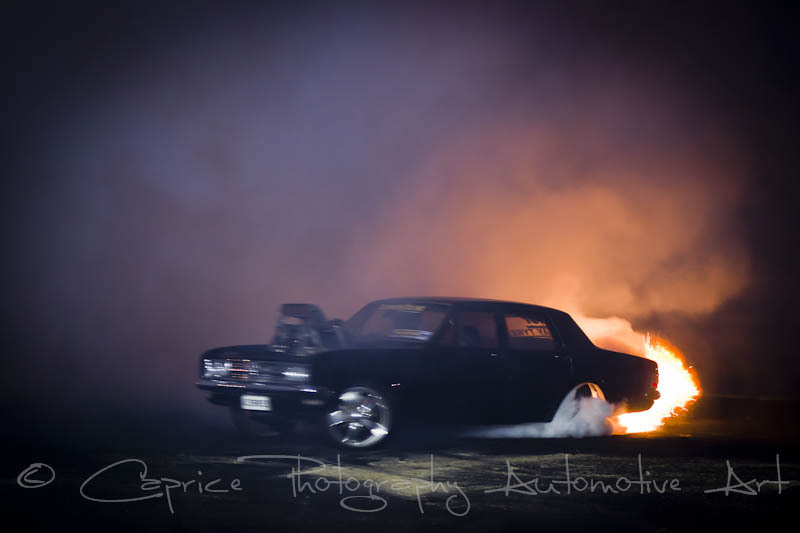 Steve Loader would eventually take out the cash with a spectacular flame up frying his rear end while leaving spot fires across the track for the volunteer fire fighters to put out. 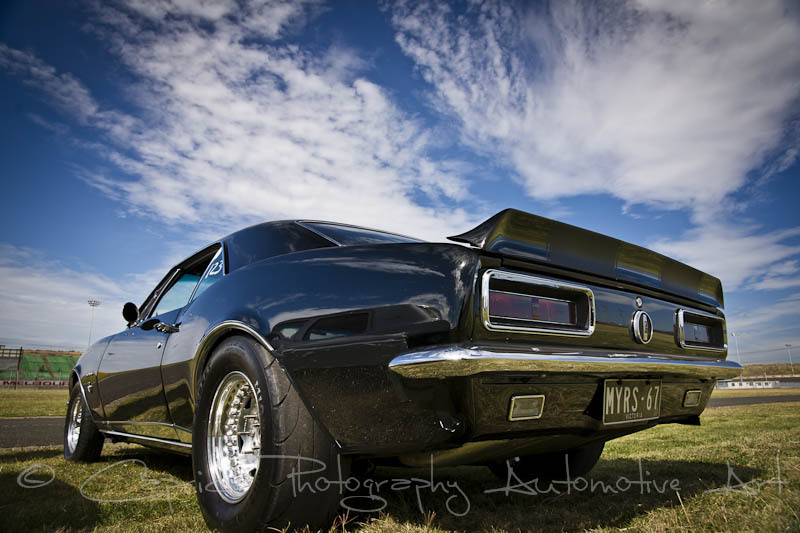 We’ve lost count how many times Steve’s had to repaint his rear end but I reckon they’re due to name a shade of black paint after him. 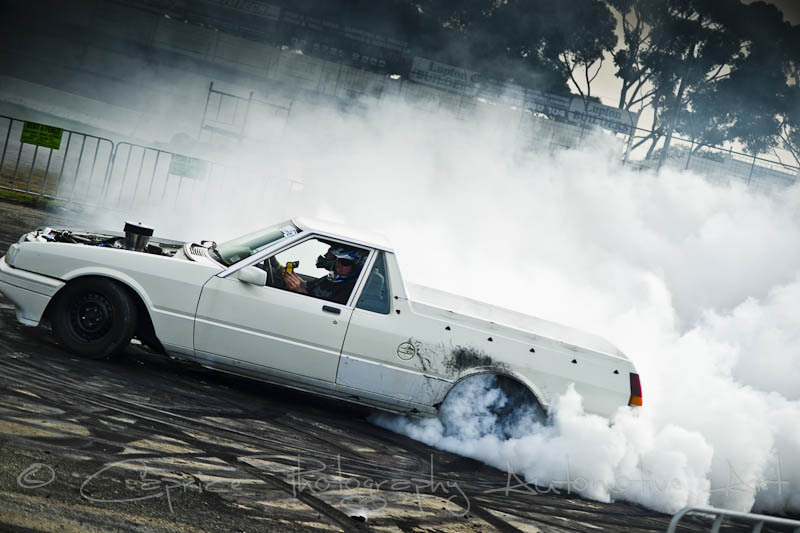 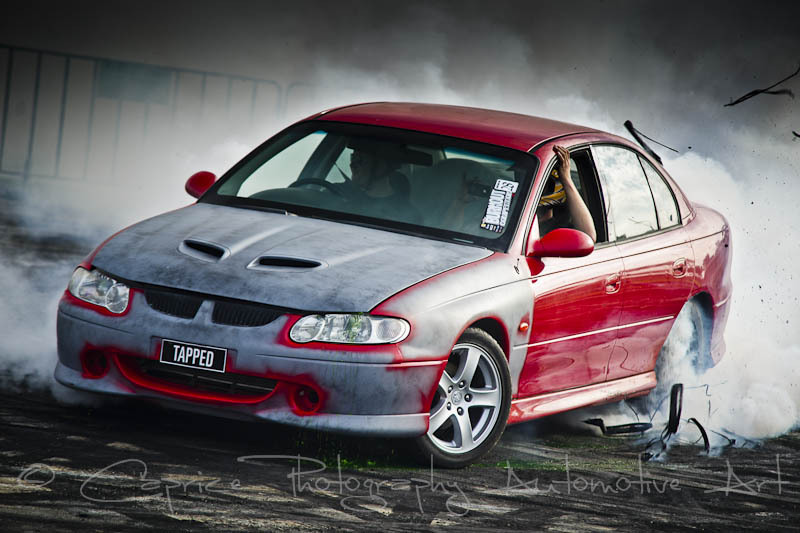 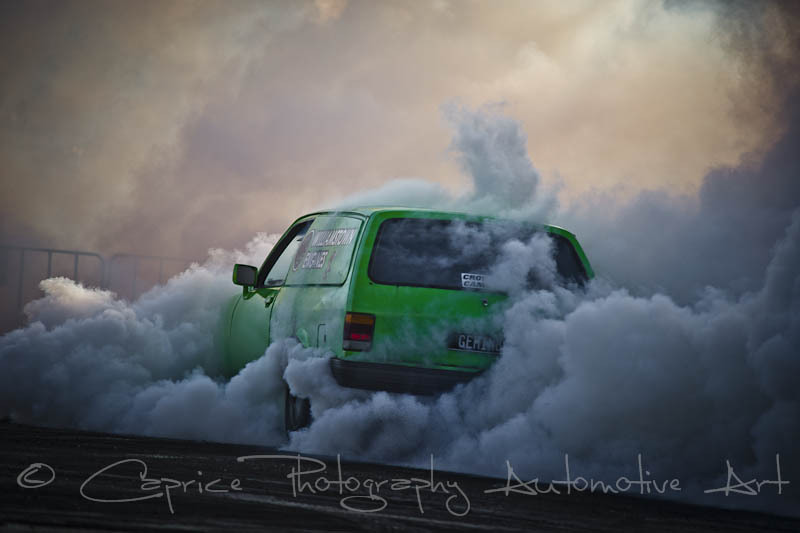 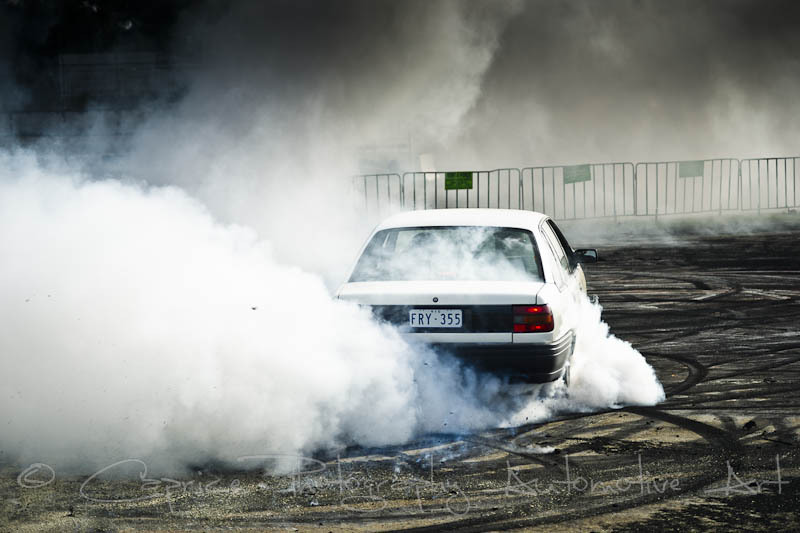 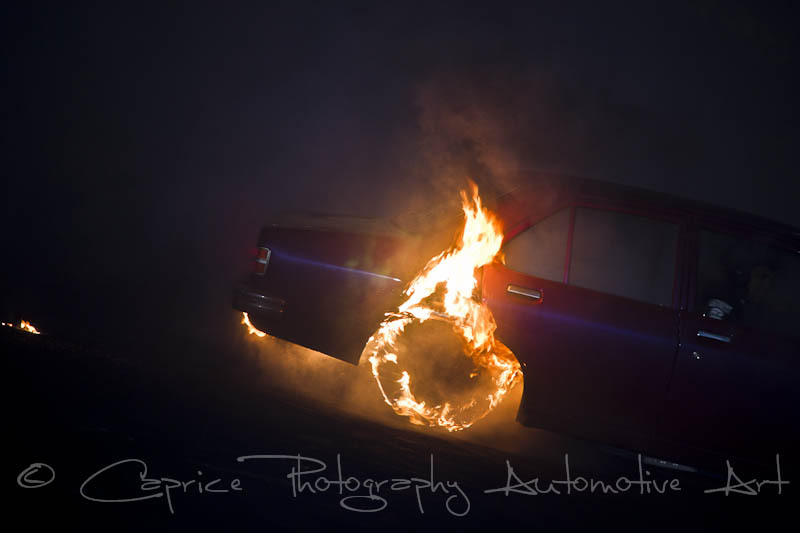 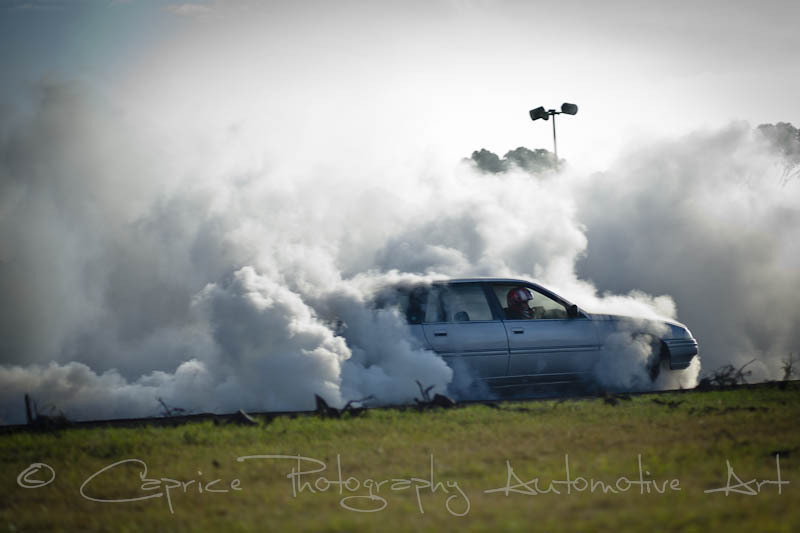 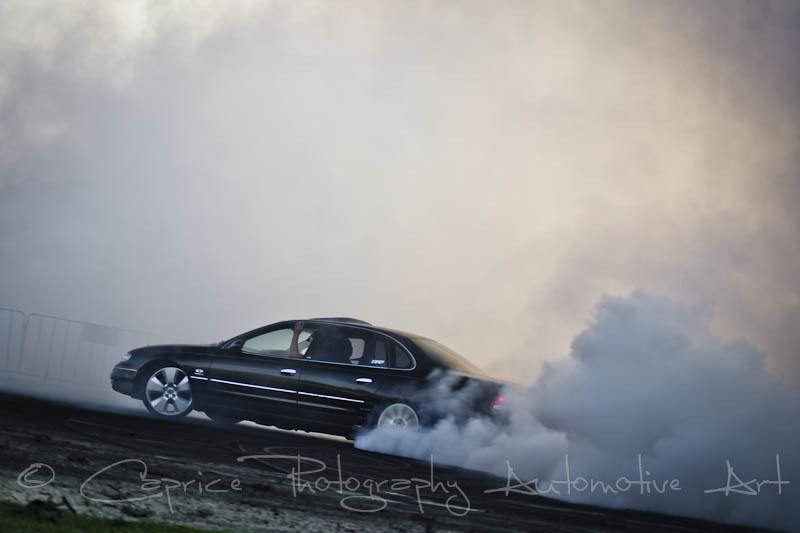 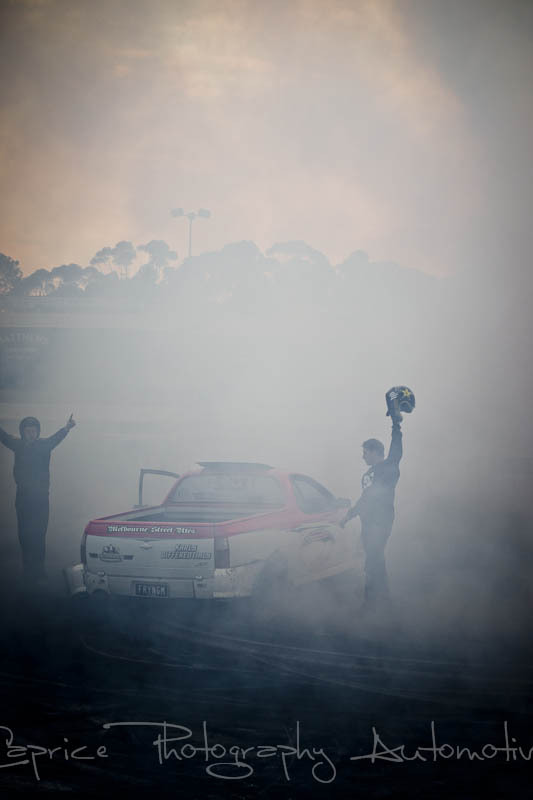 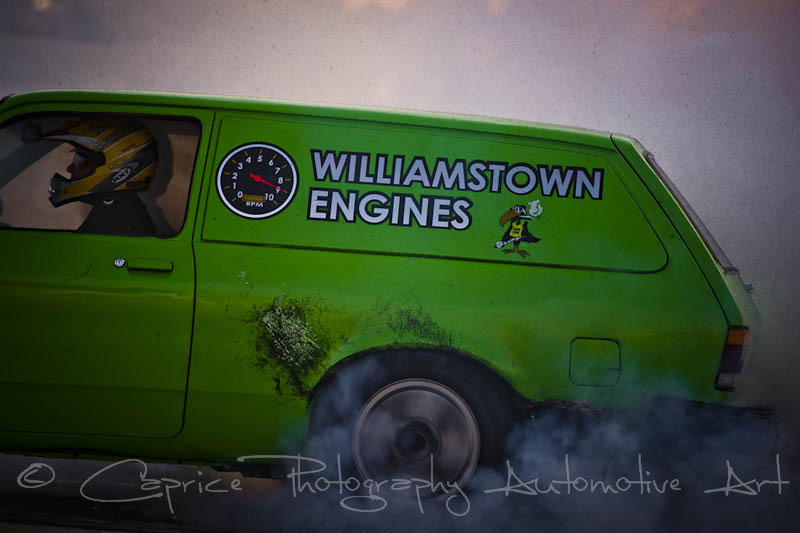 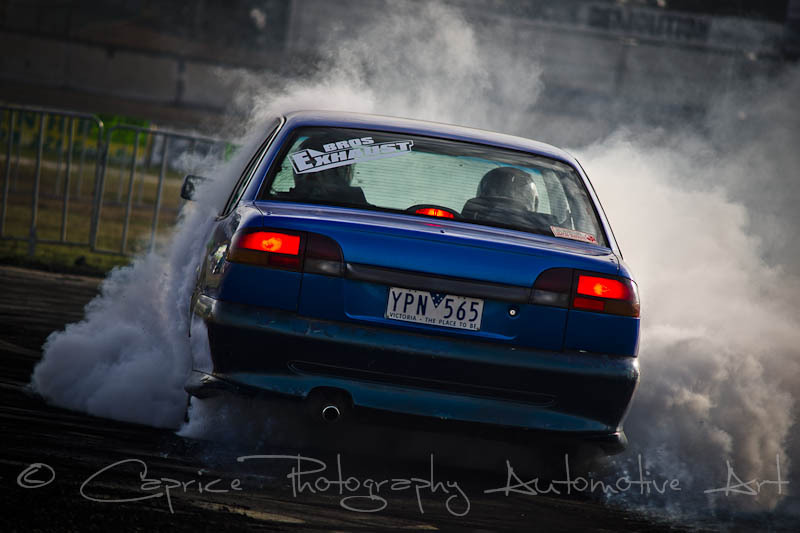 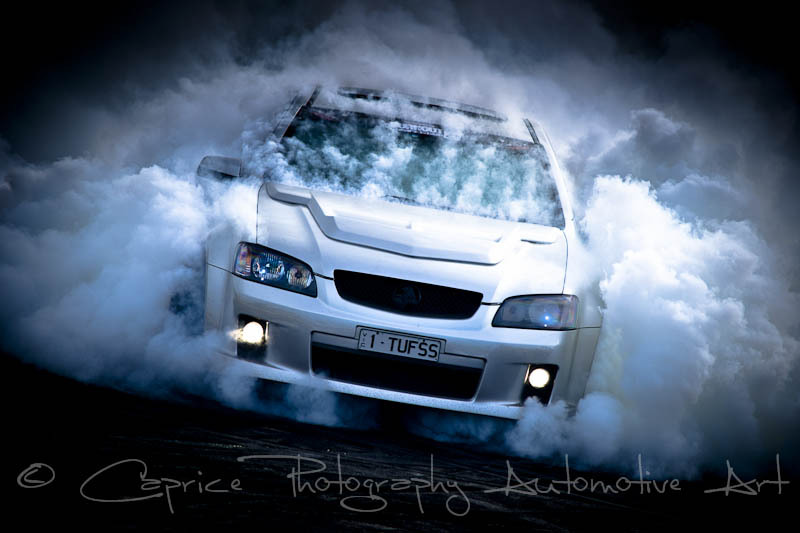 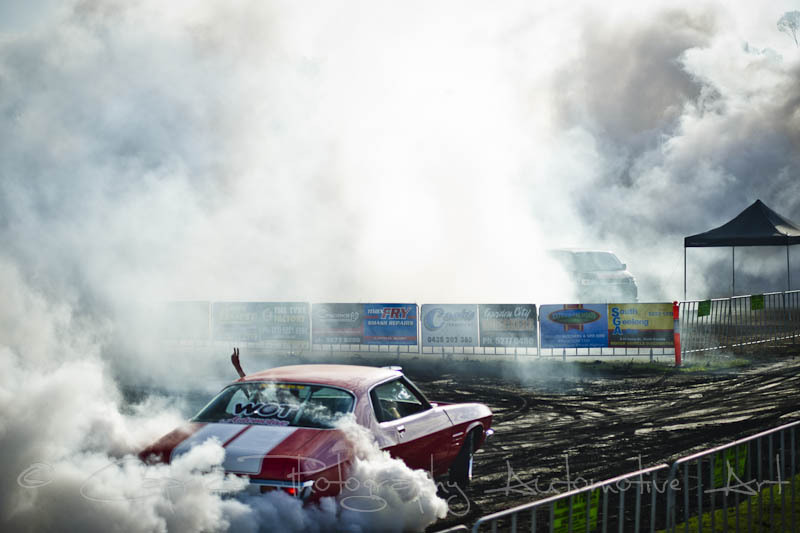 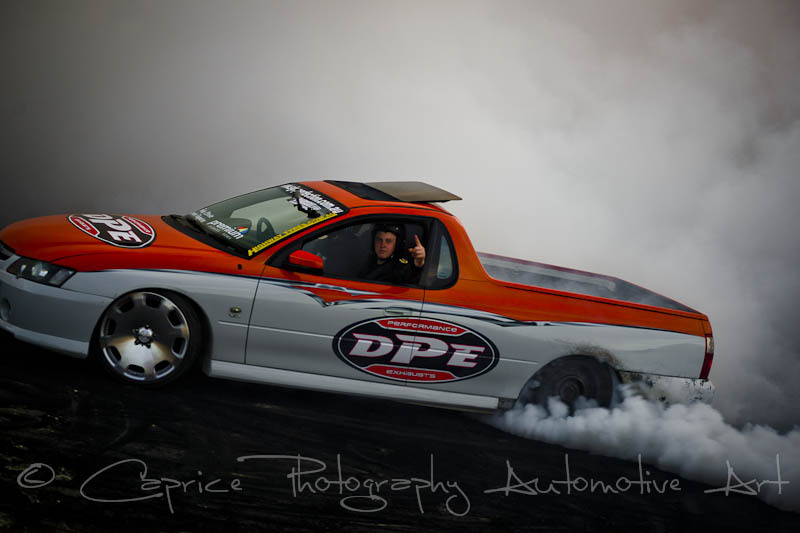 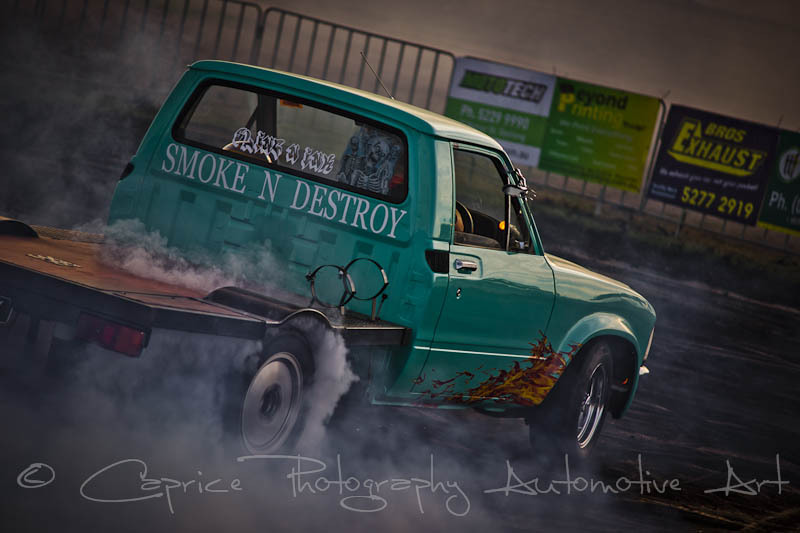 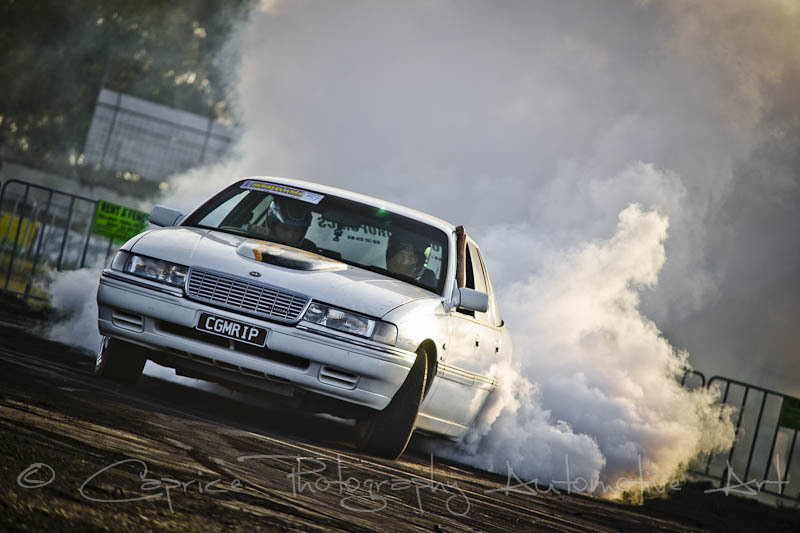 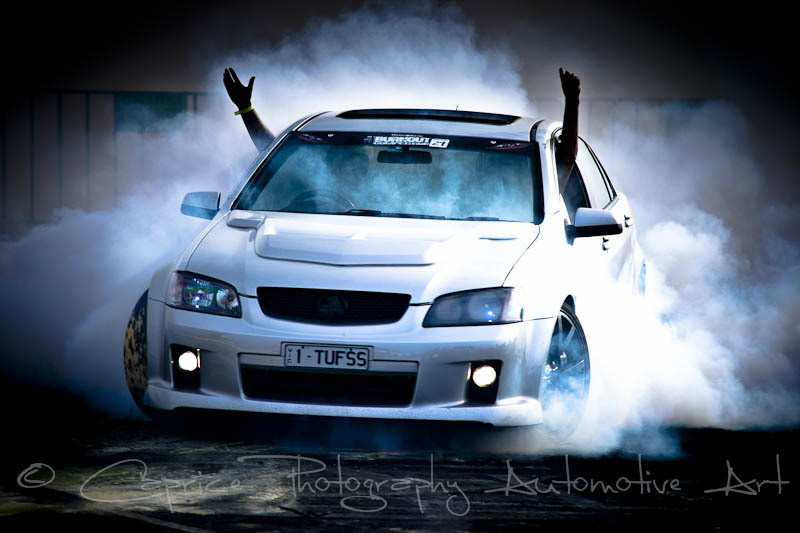 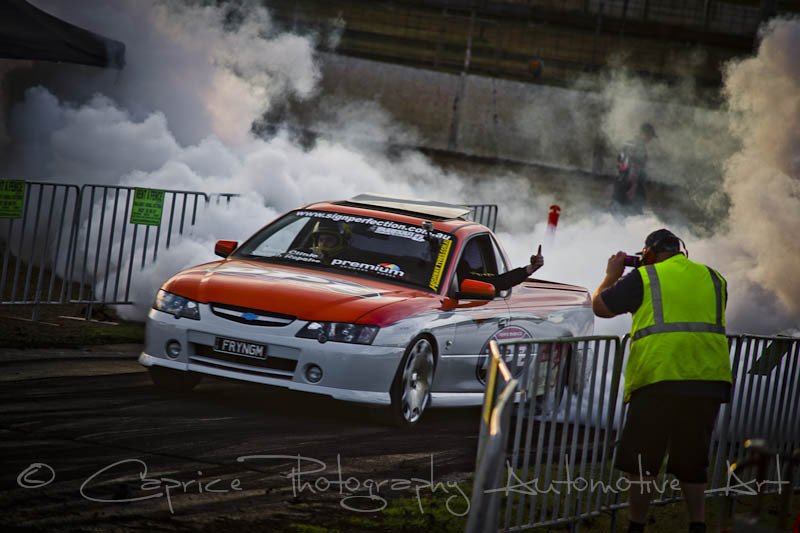 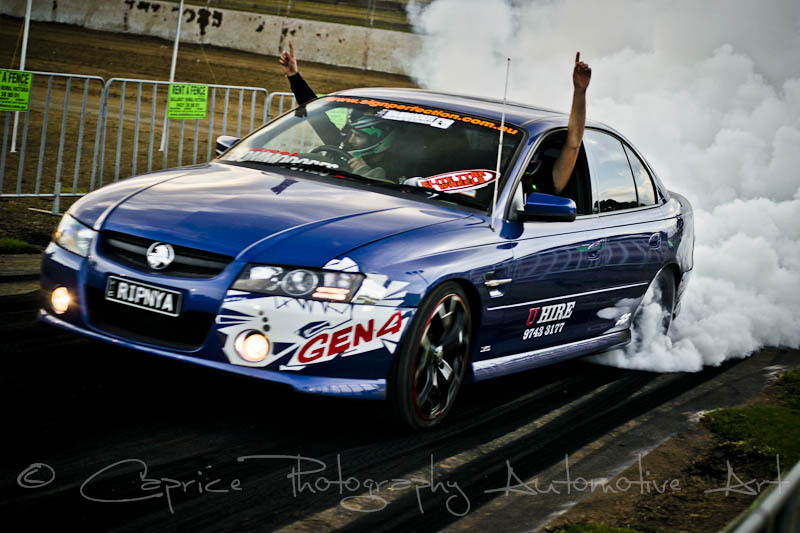 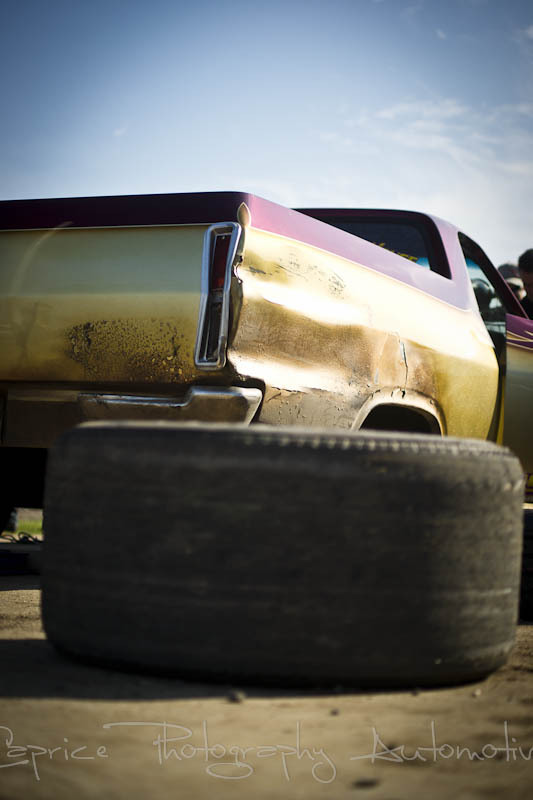 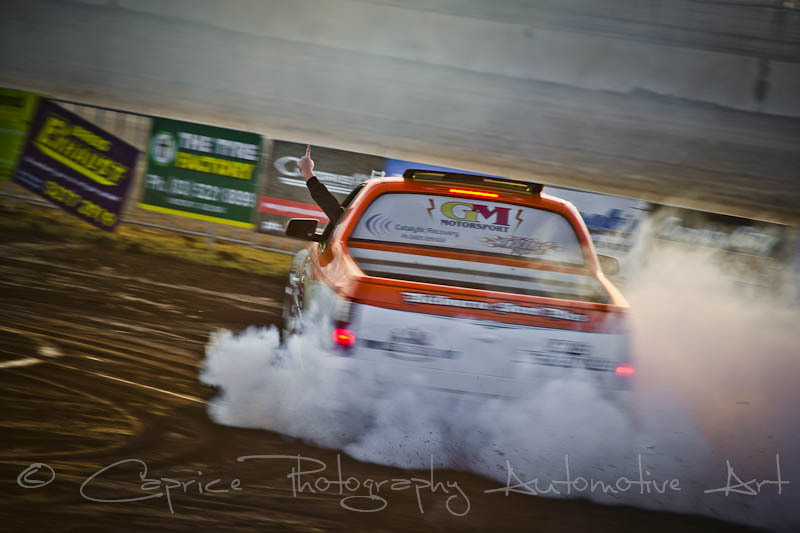 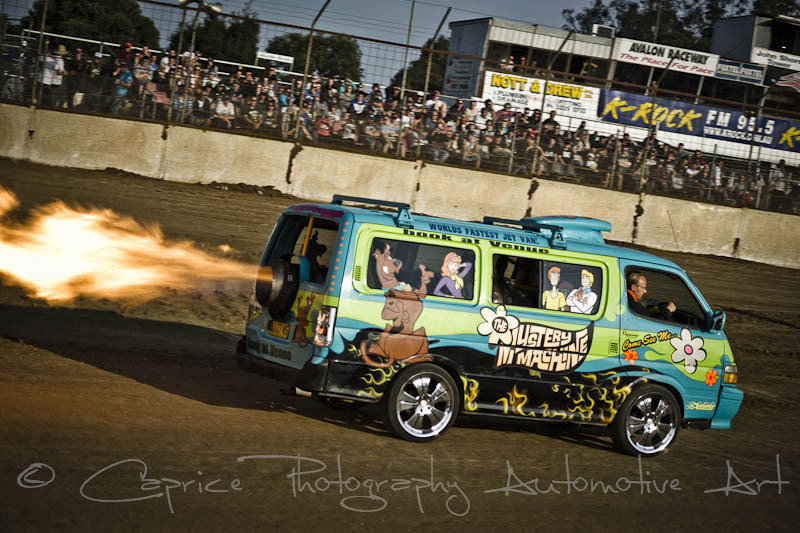 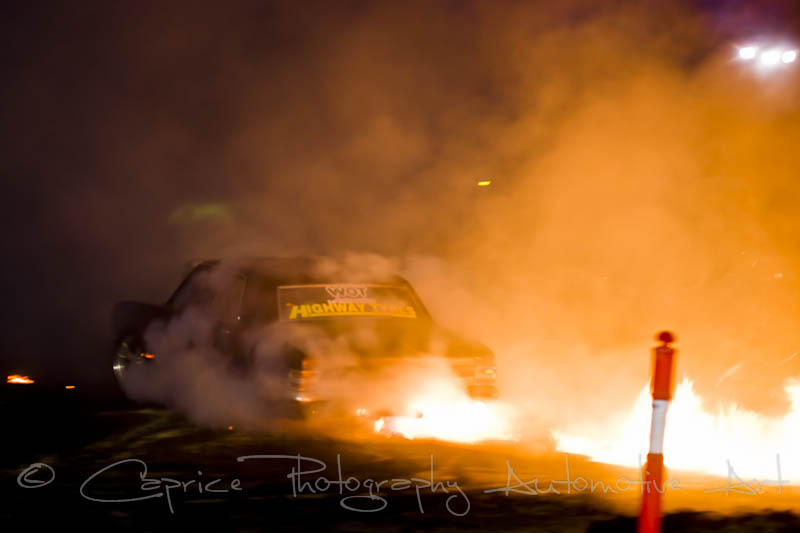 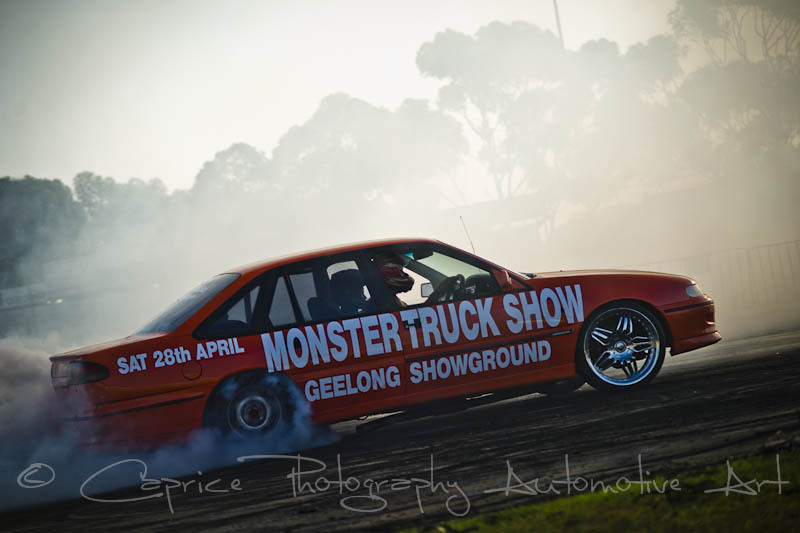 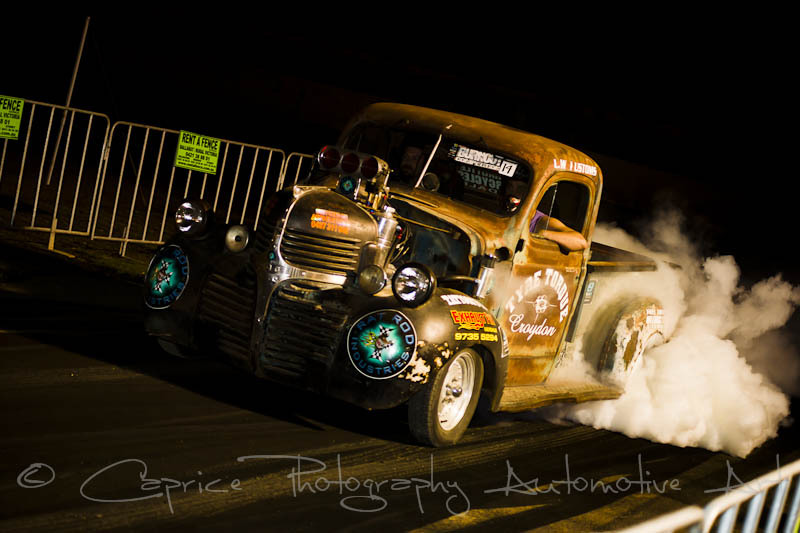 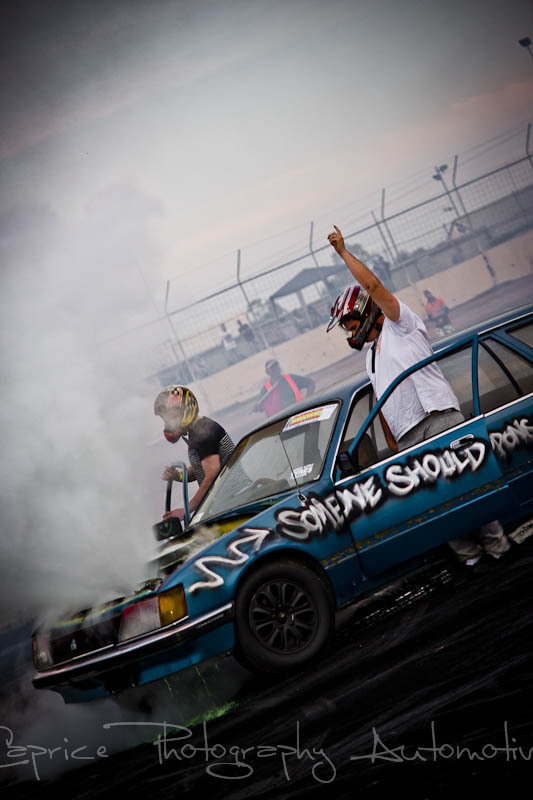 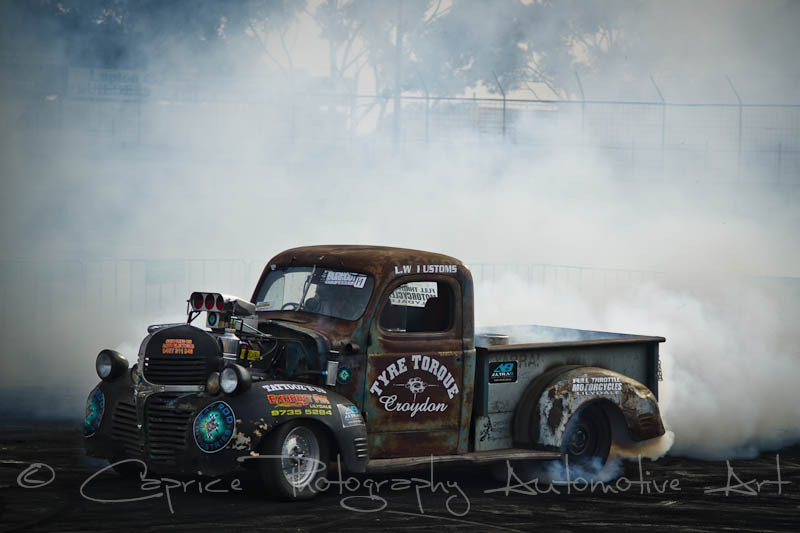 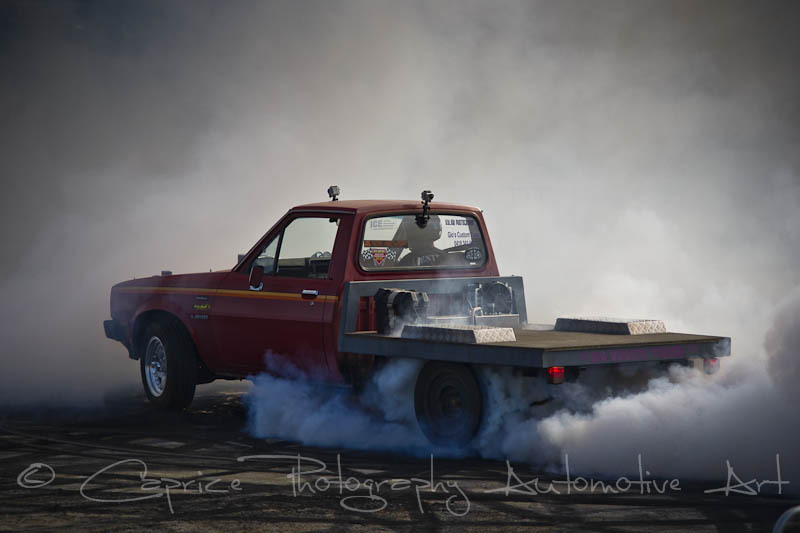 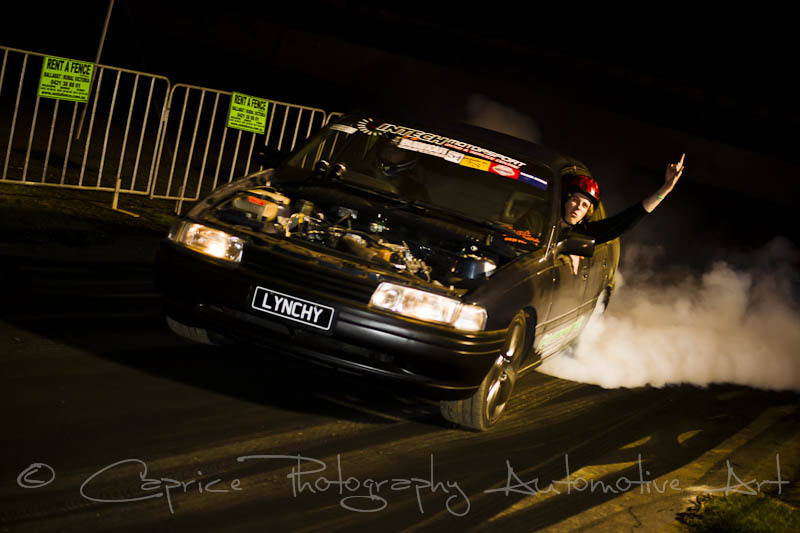 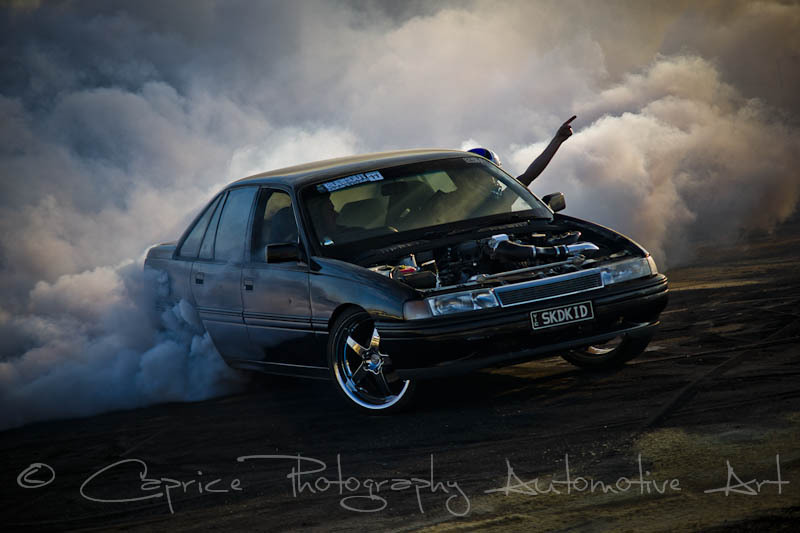 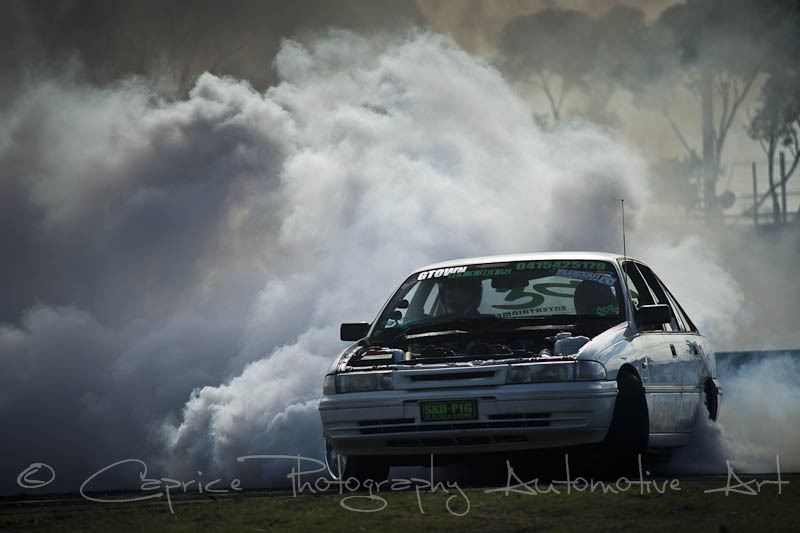 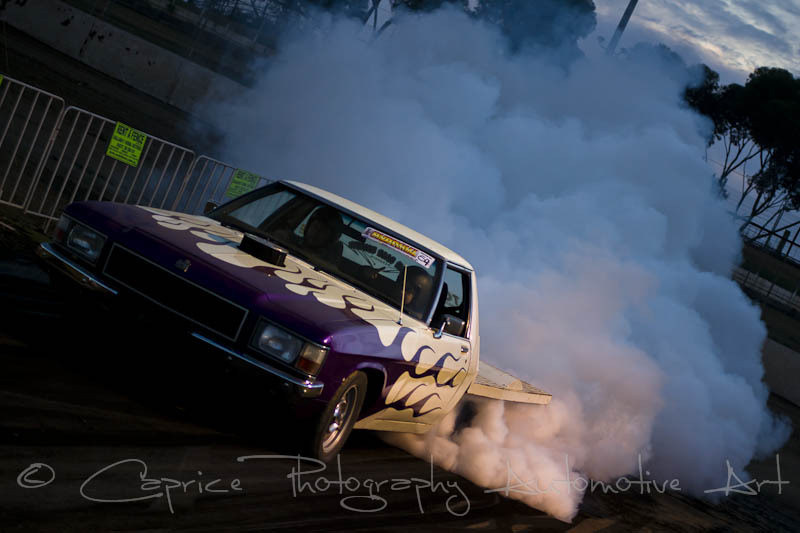 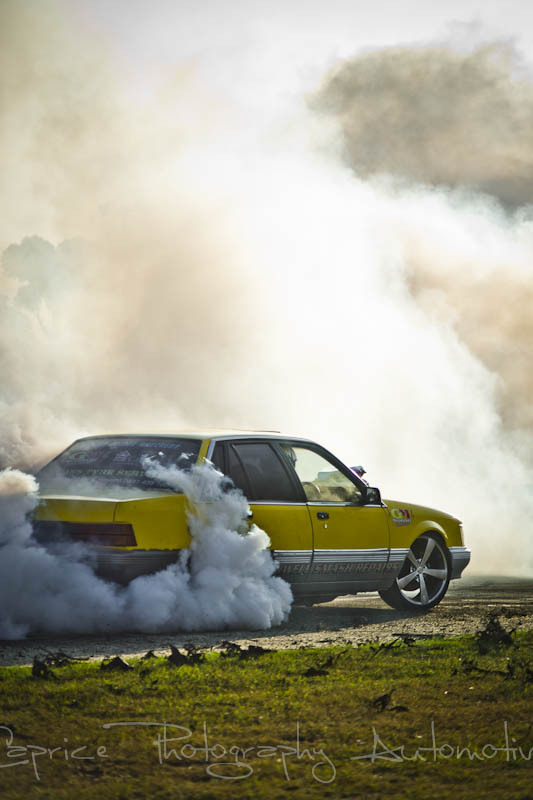 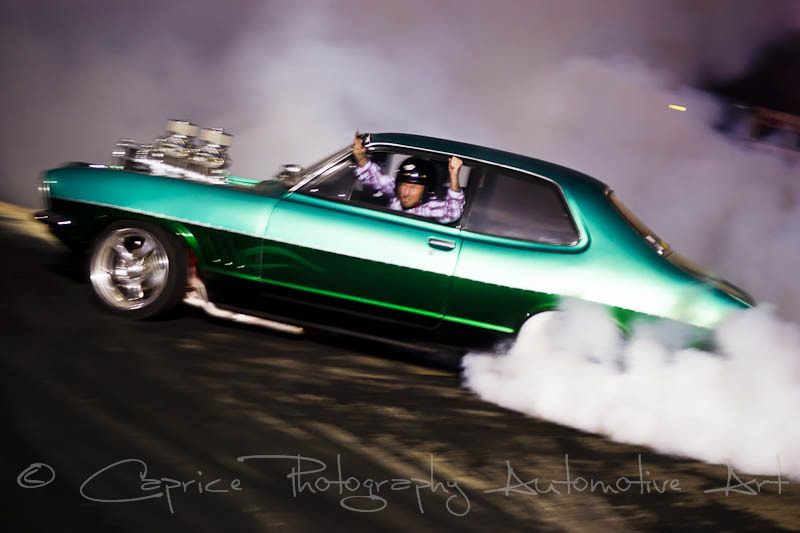 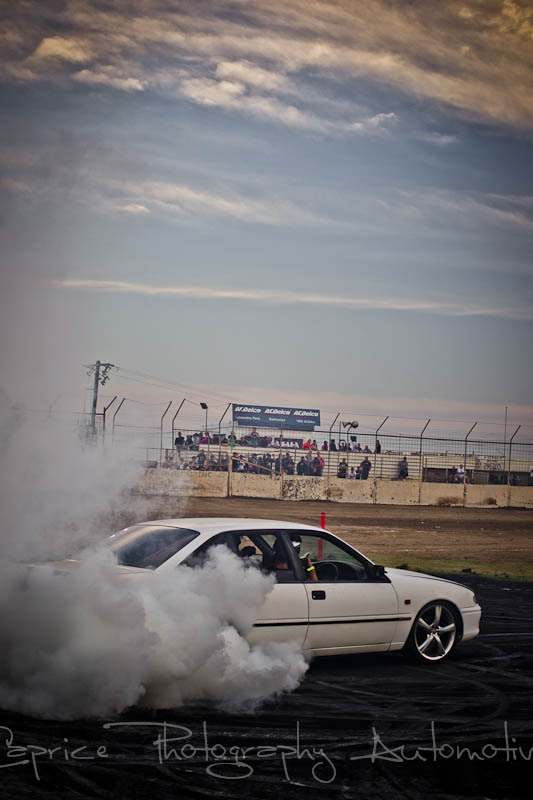 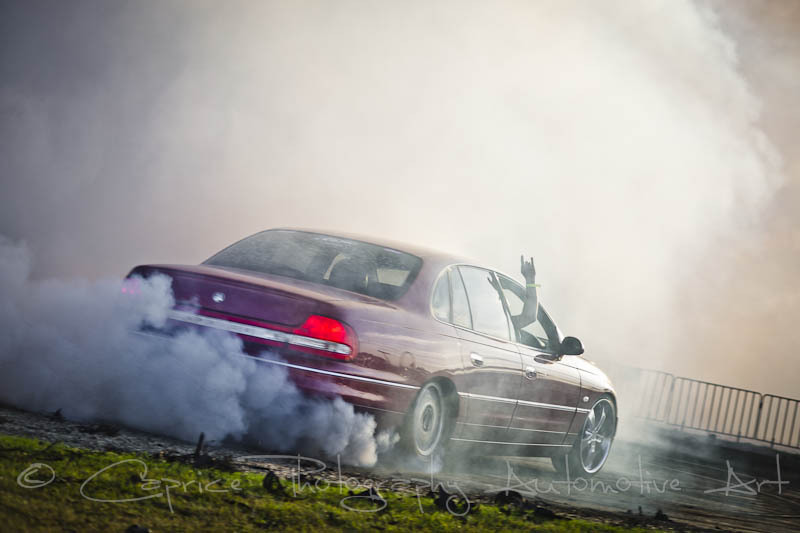 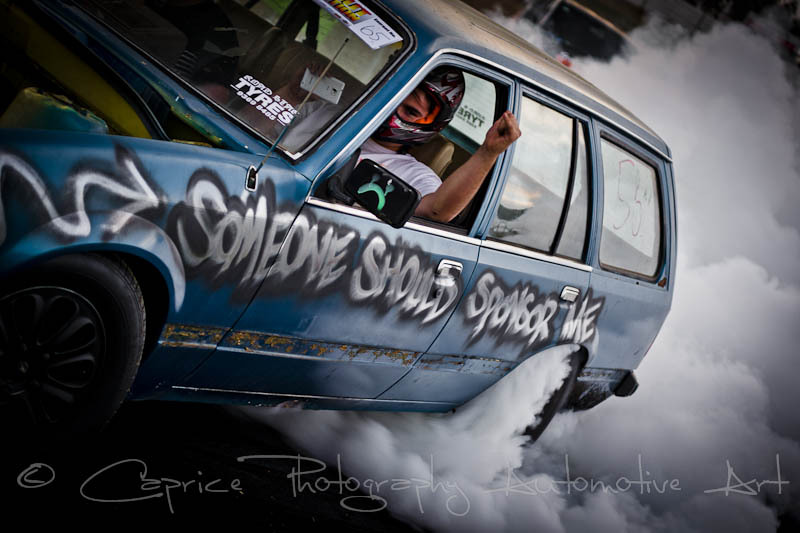 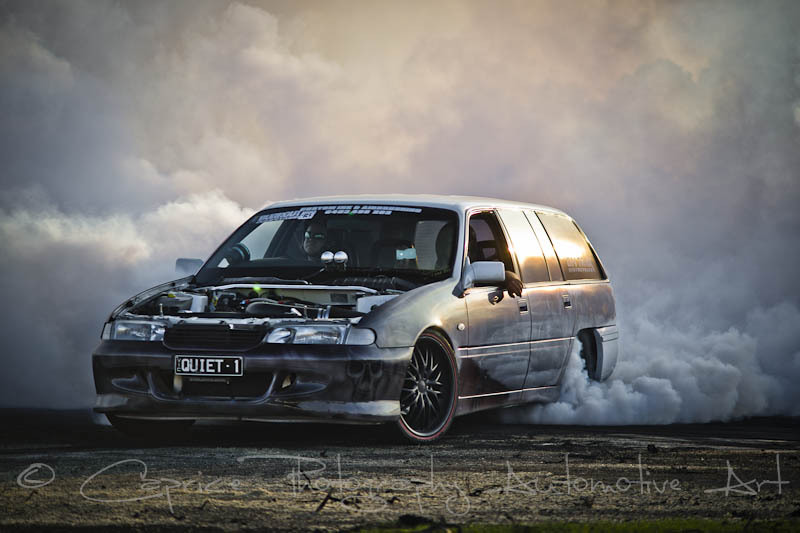 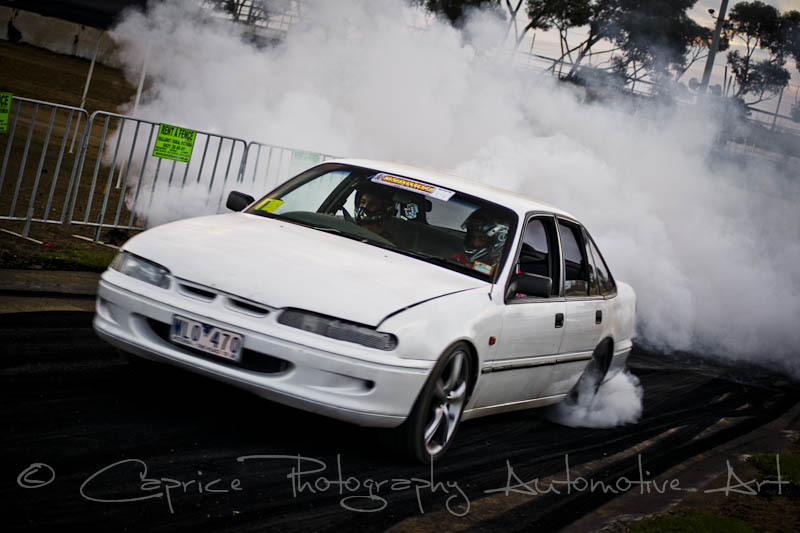 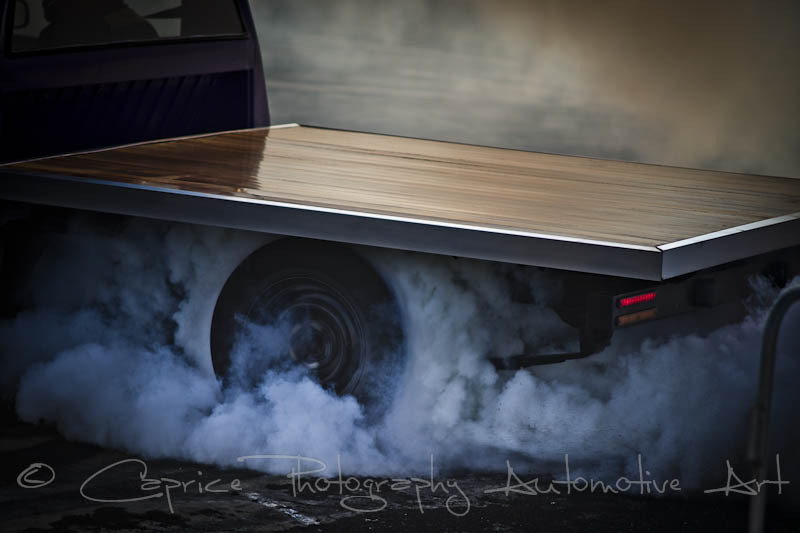 This is a sport fast growing in popularity as the prize monies continue to rise so if you’re after a day of fast paced, engine revving, tire frying, smoke filled action, check out your local area for the next burnout comp and get on down. 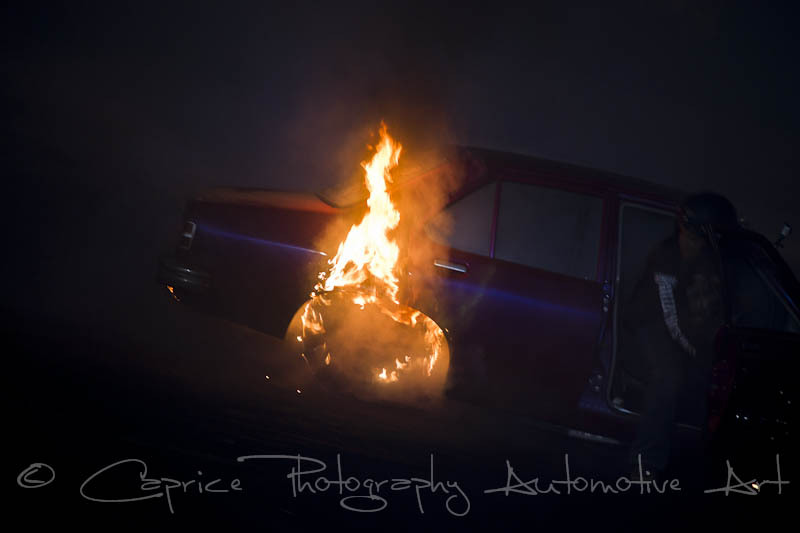 Hey, why not give it a go yourself; guaranteed to thrill you to the back teeth and you might even go home a little richer with a dirty big grin on your face! 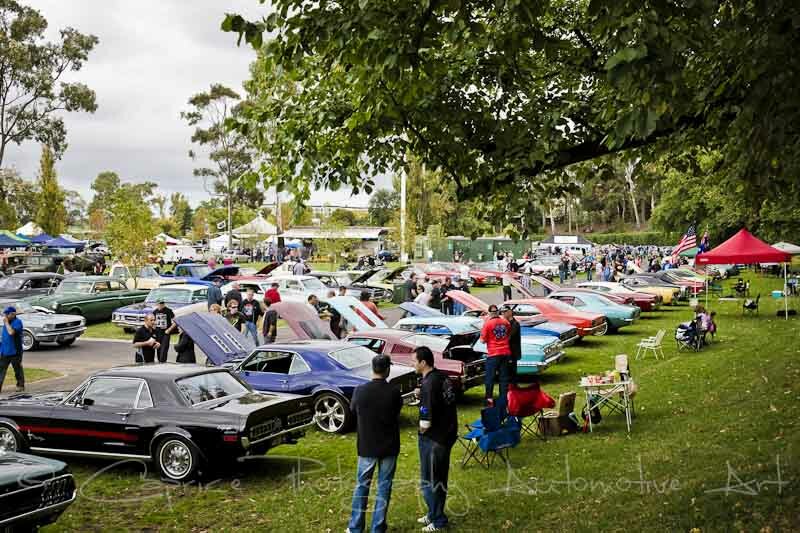 When it comes to country towns, you can take your chances as to the popularity of the event it is putting on and until you arrive you don’t know what you’re in for. 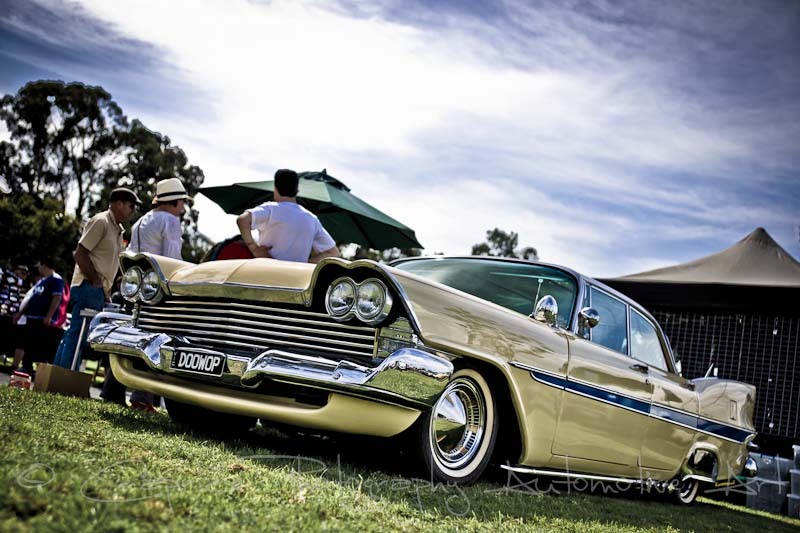 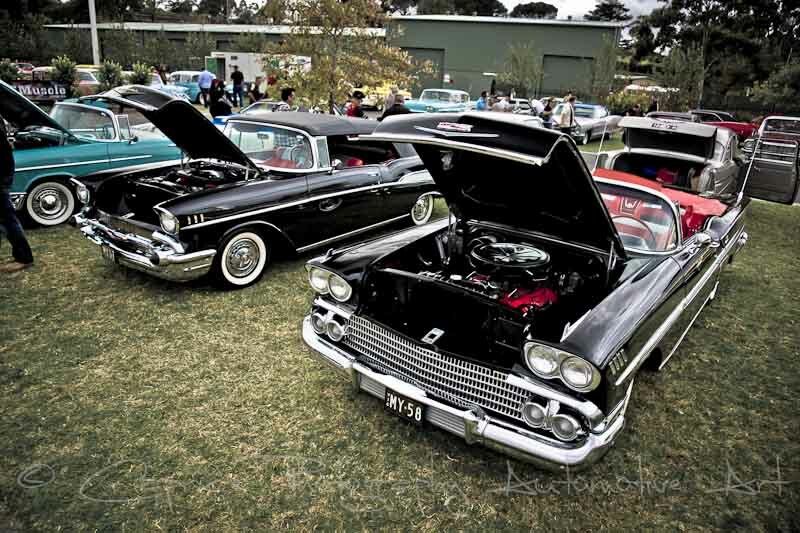 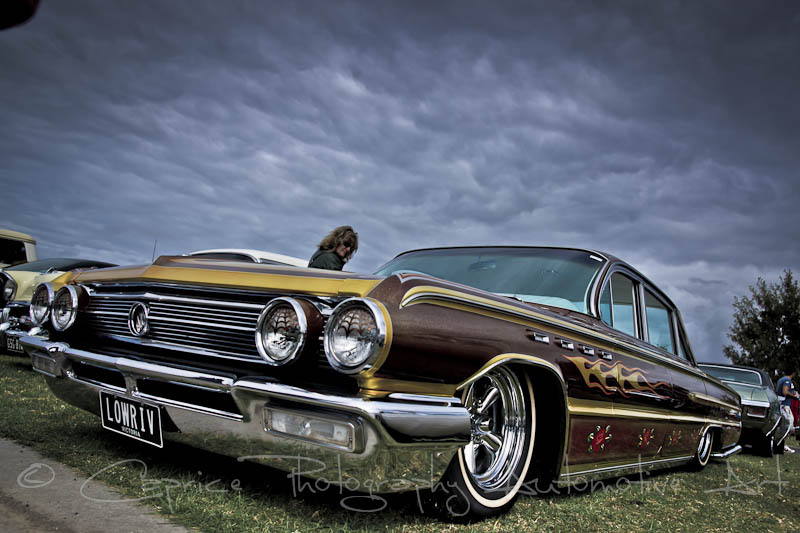 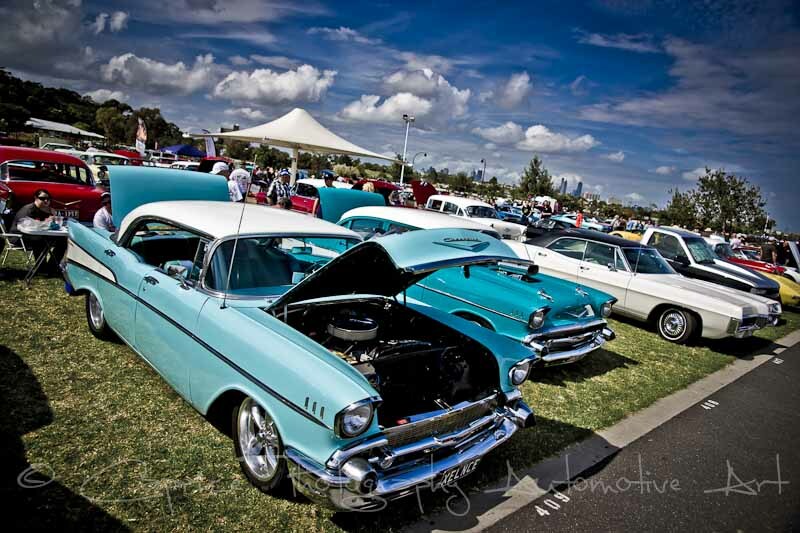 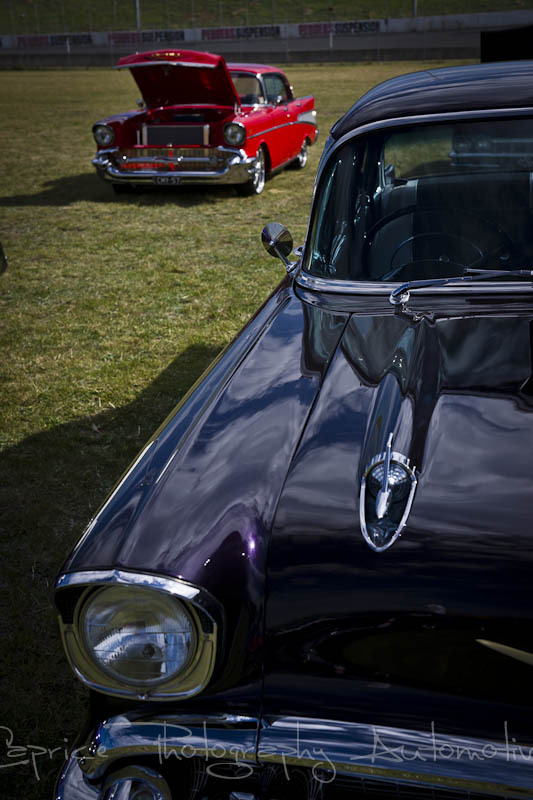 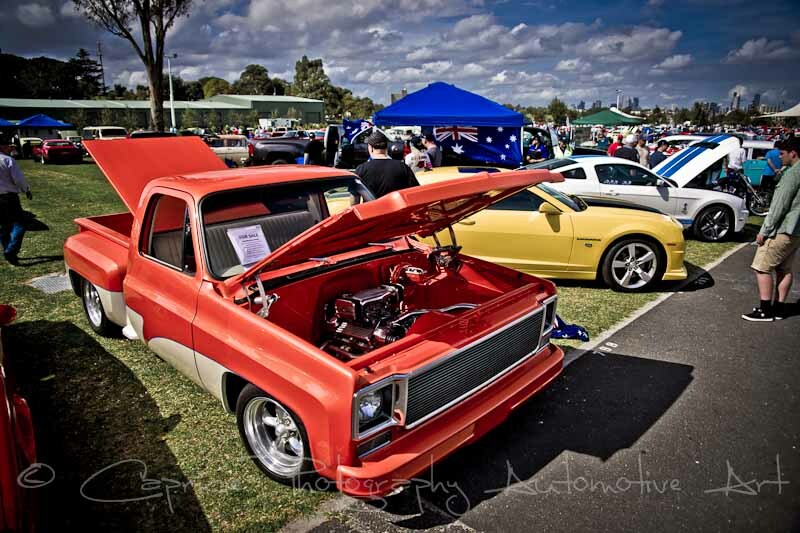 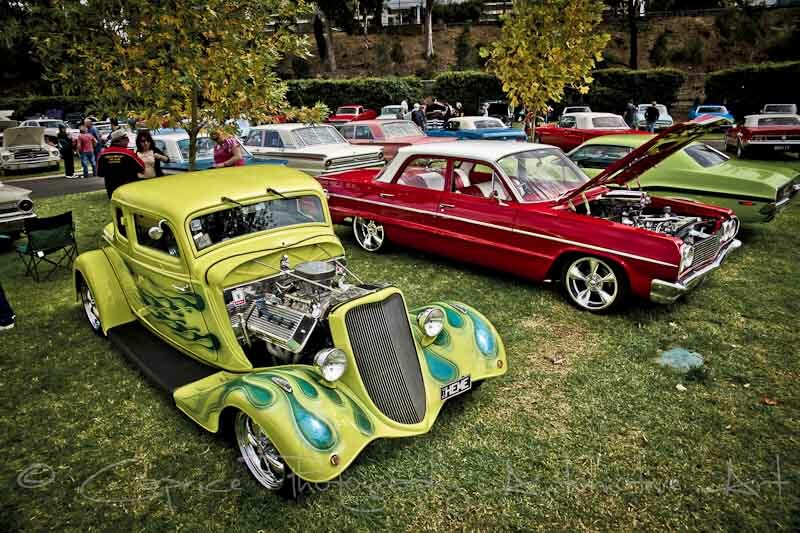 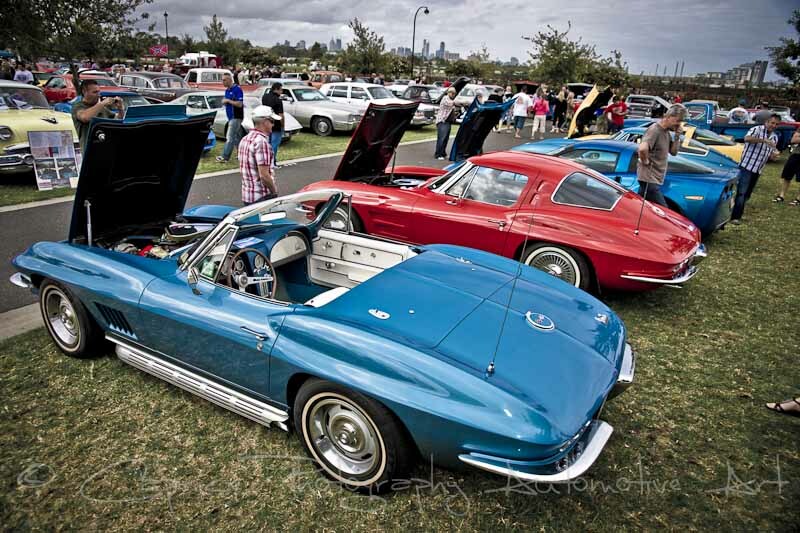 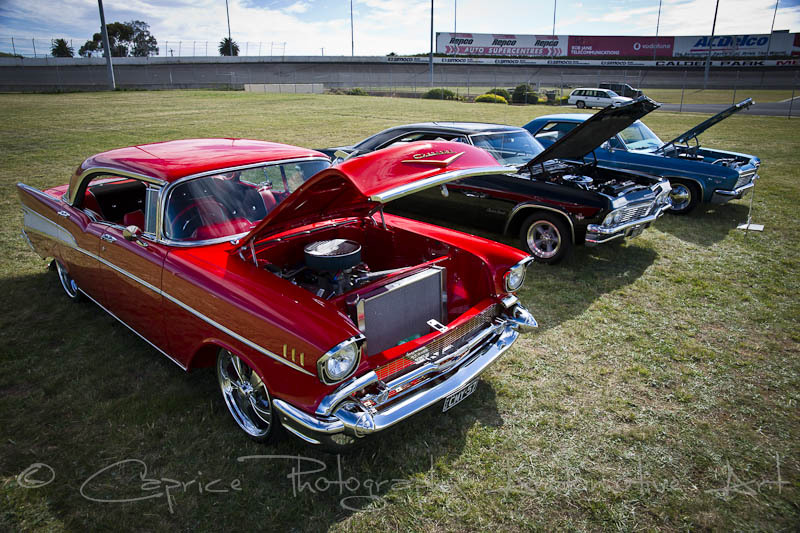 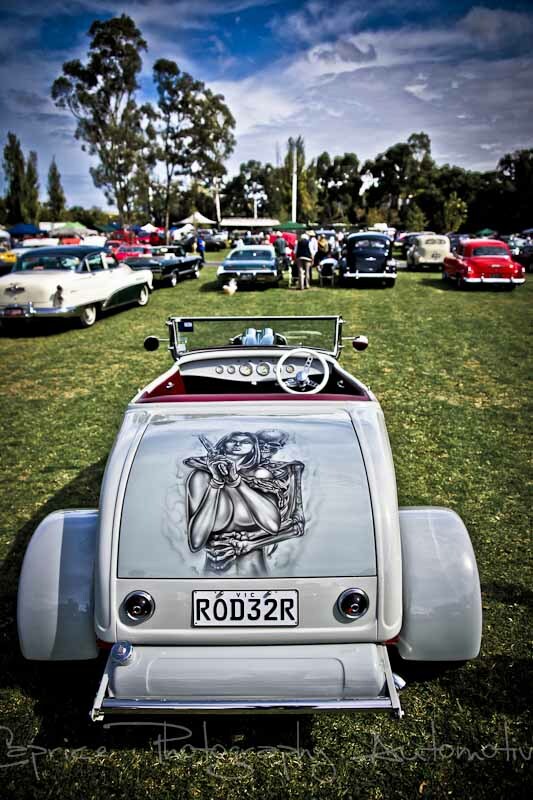 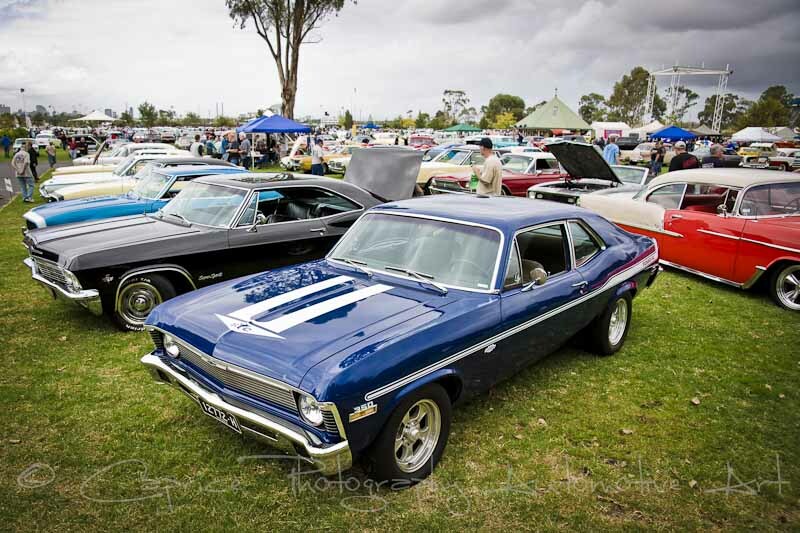 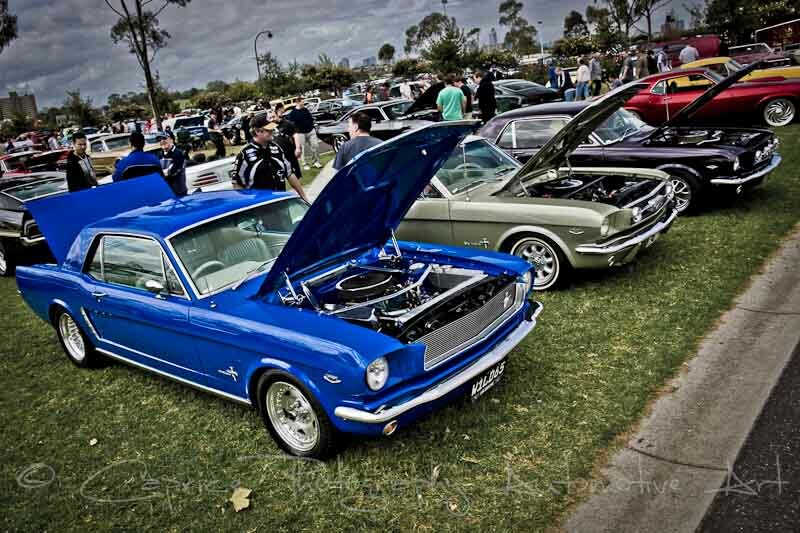 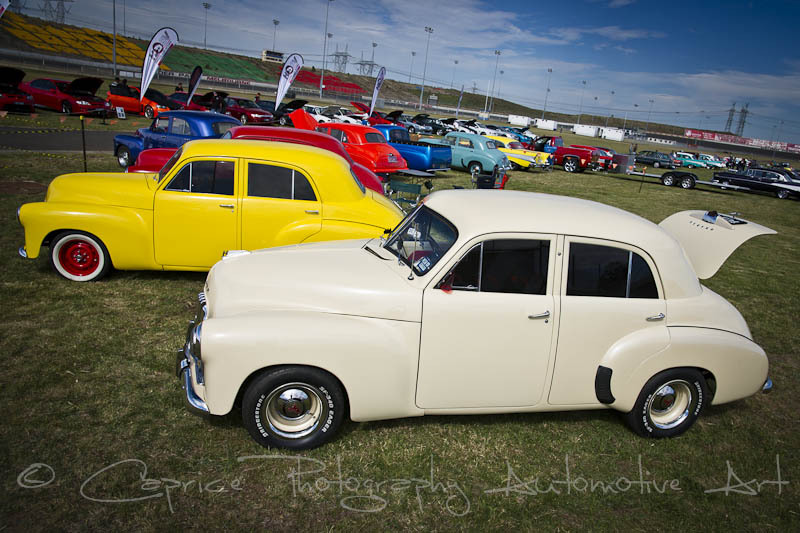 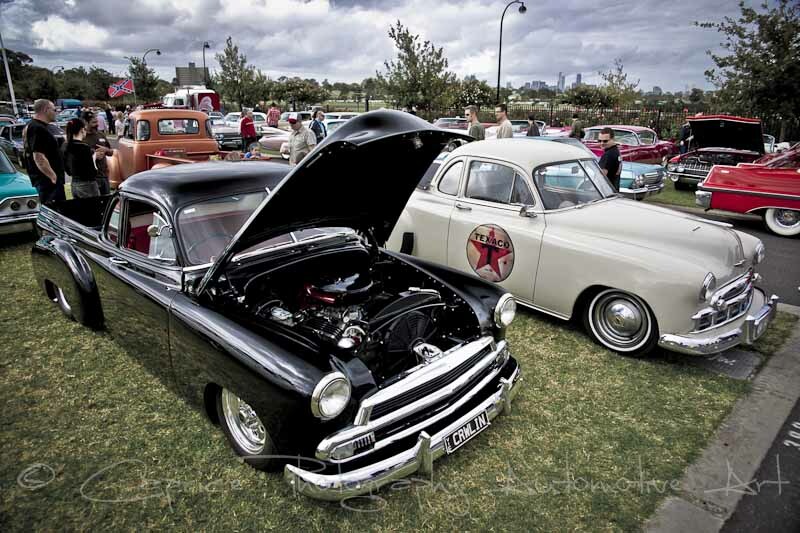 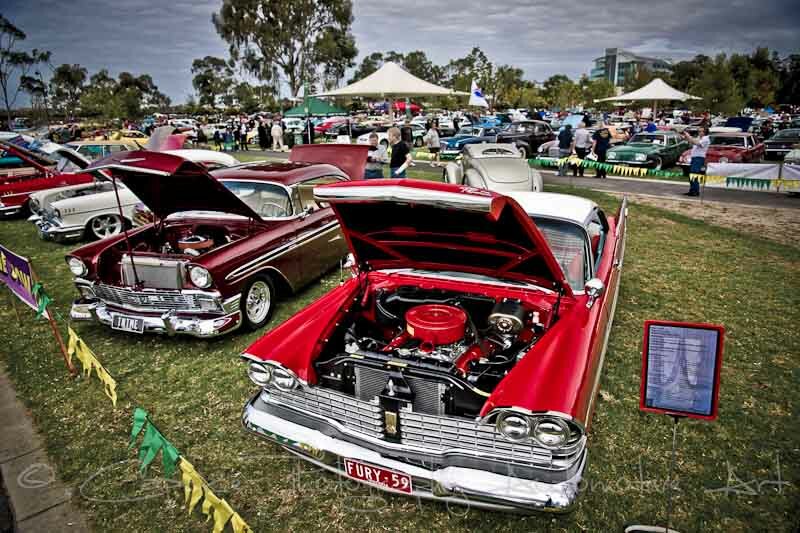 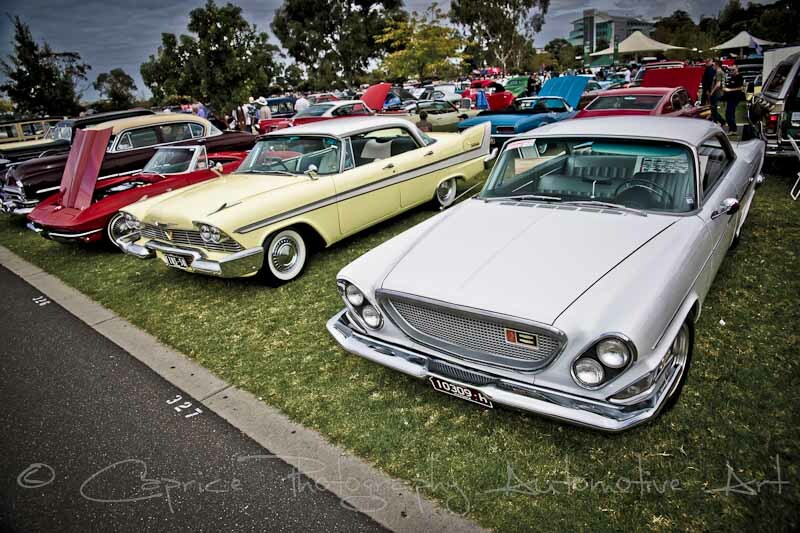 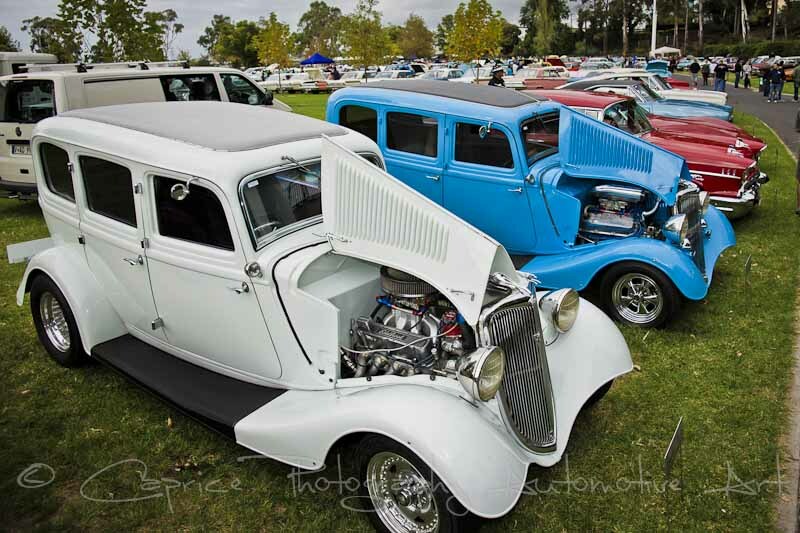 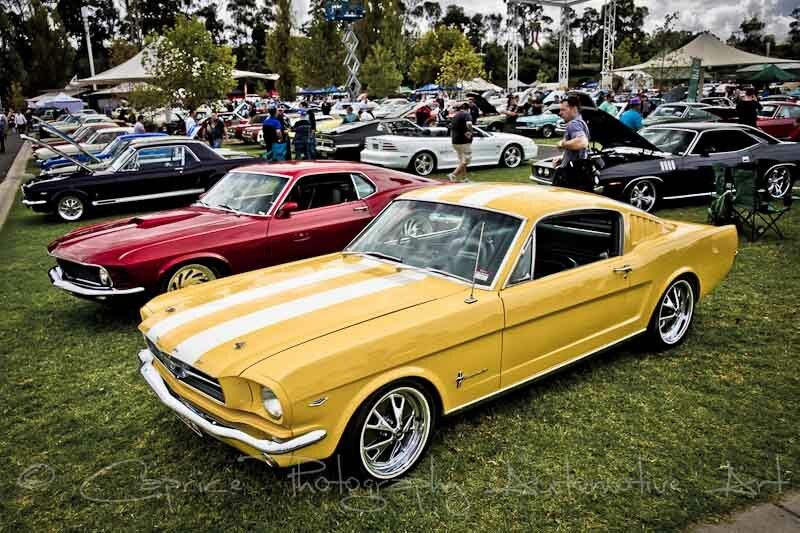 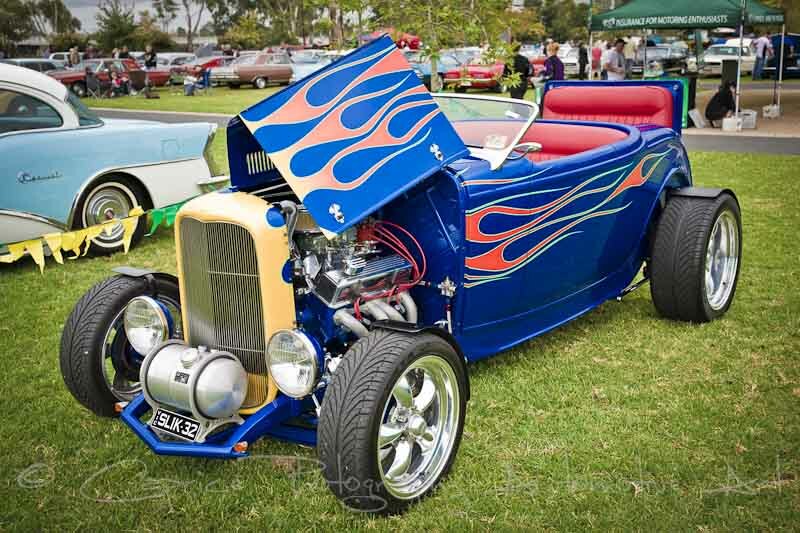 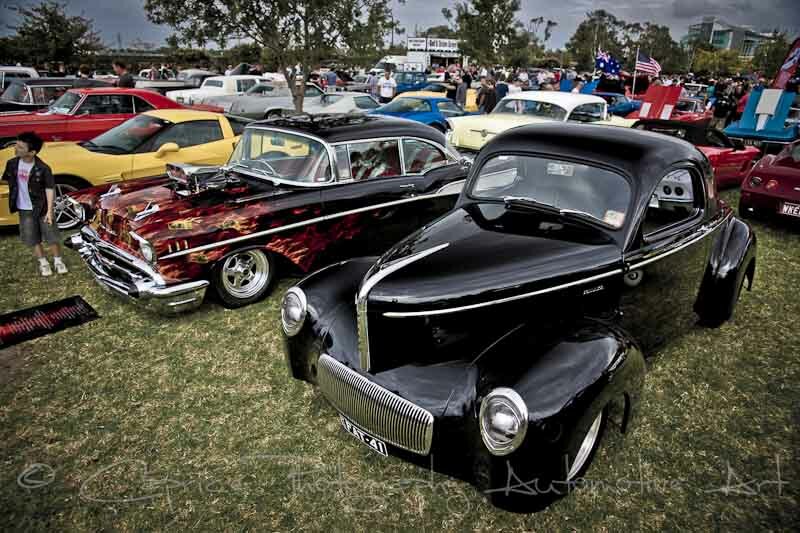 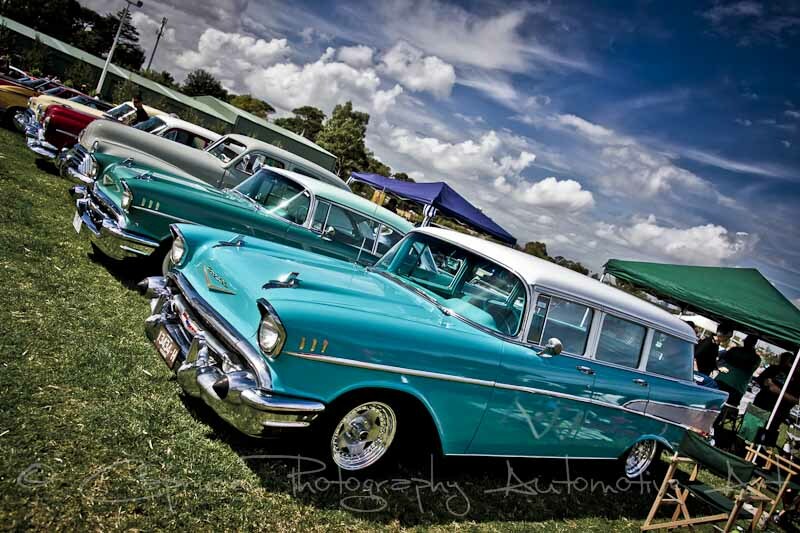 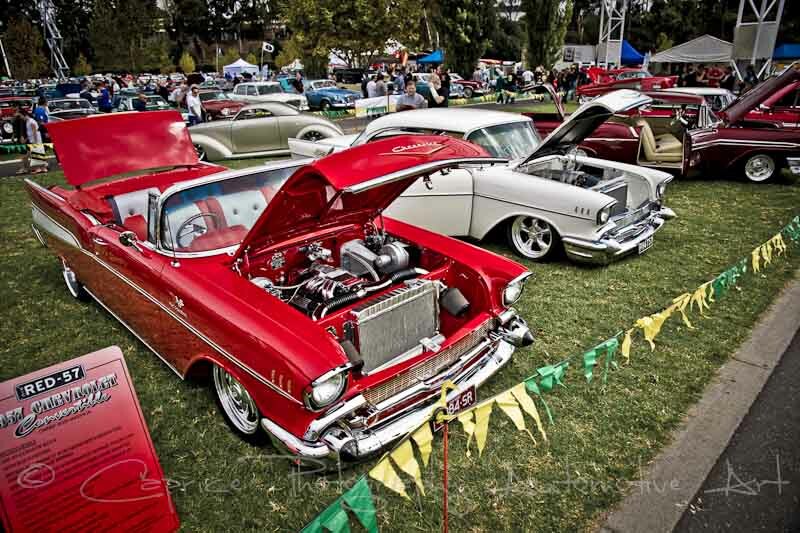 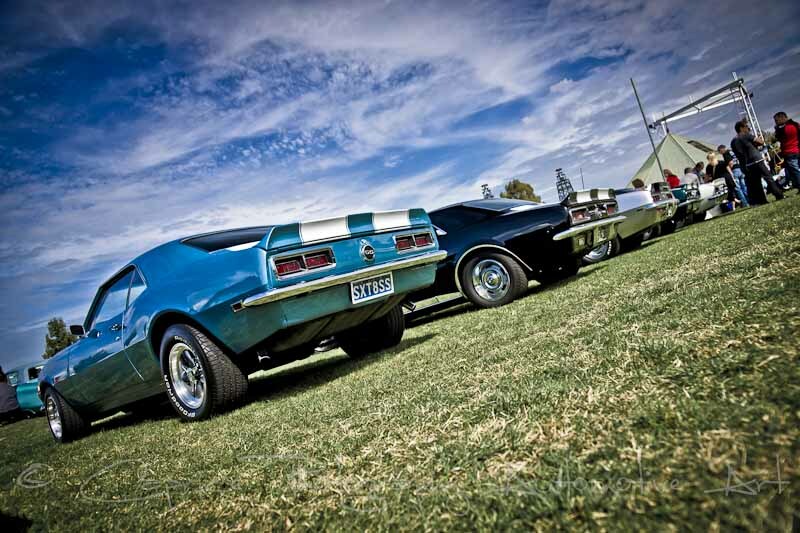 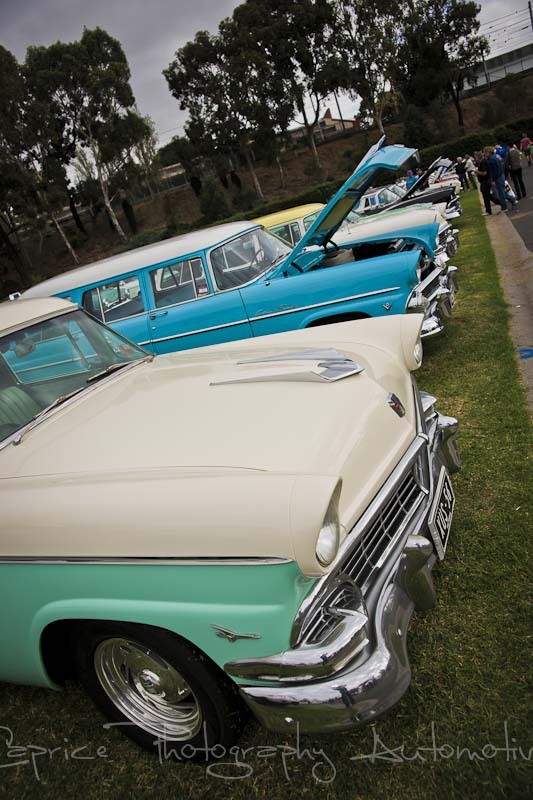 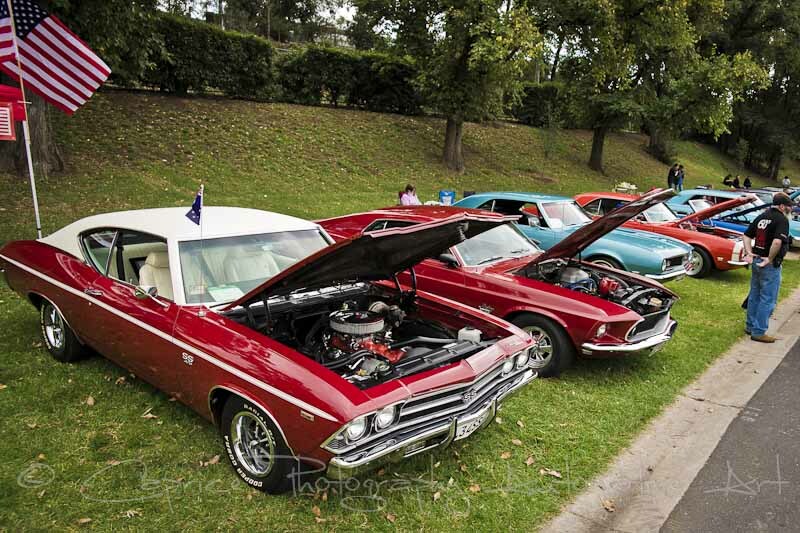 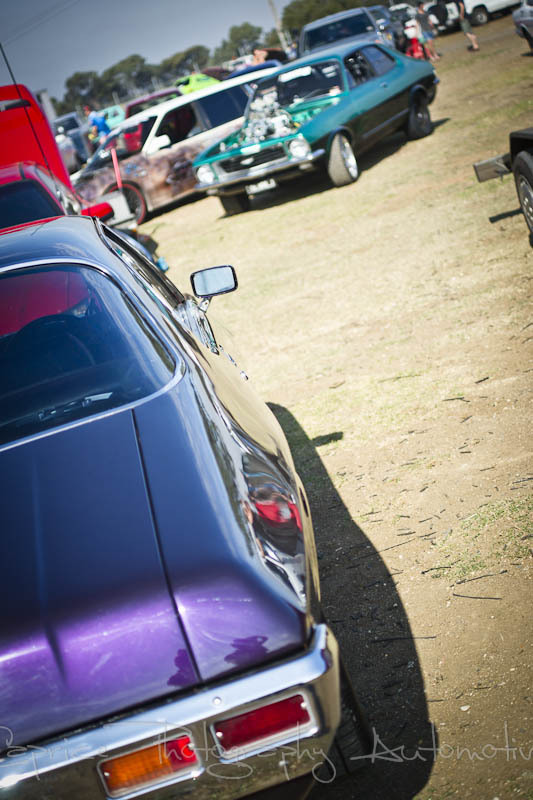 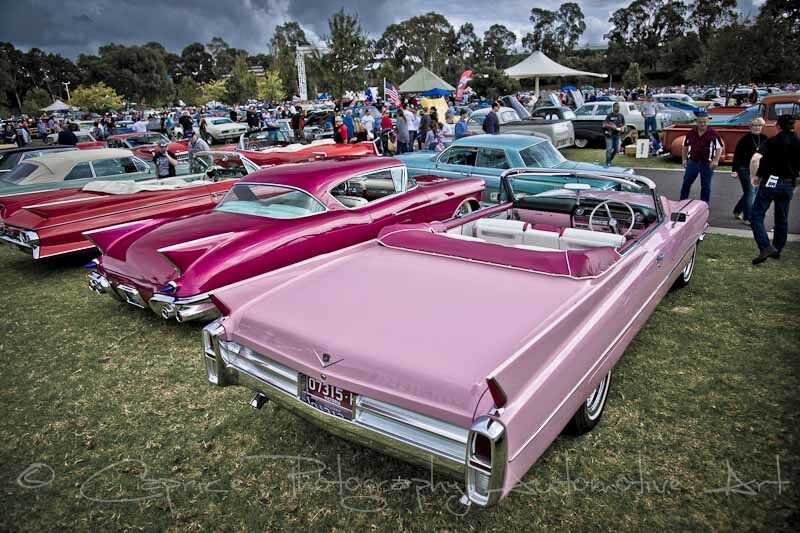 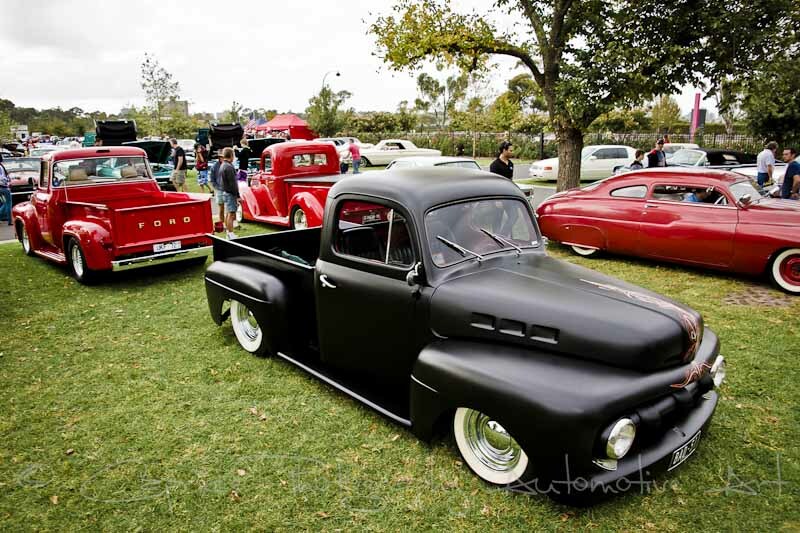 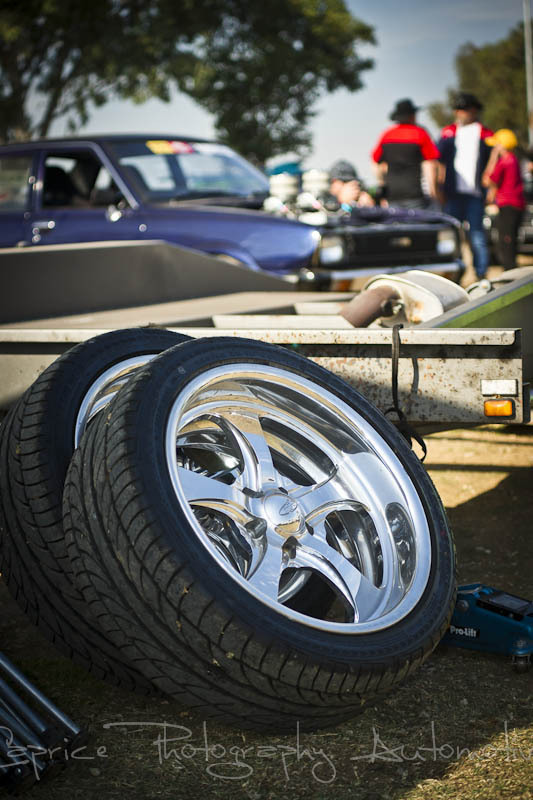 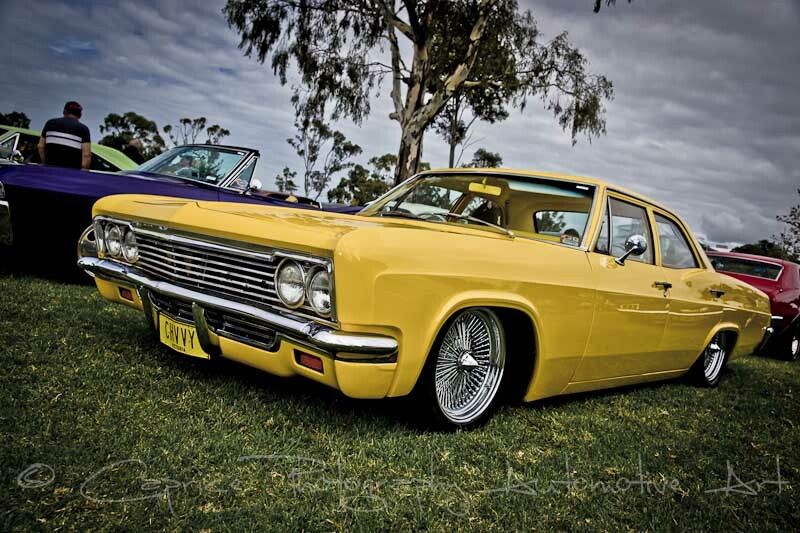 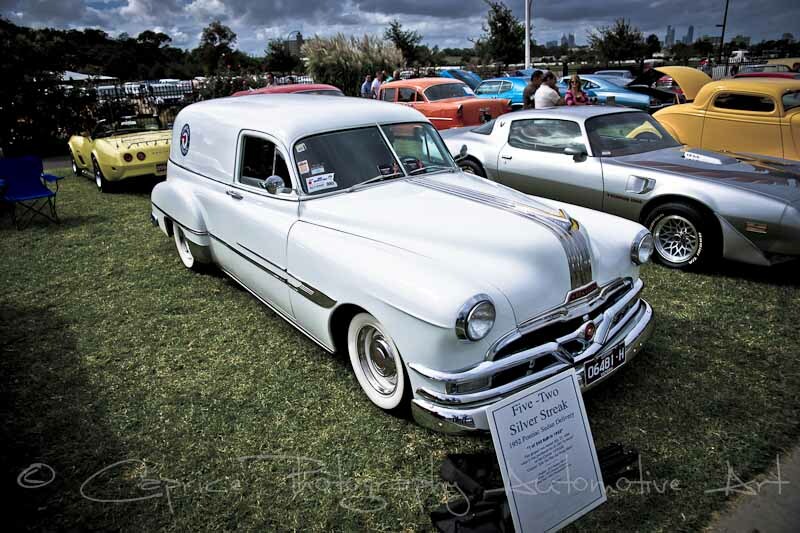 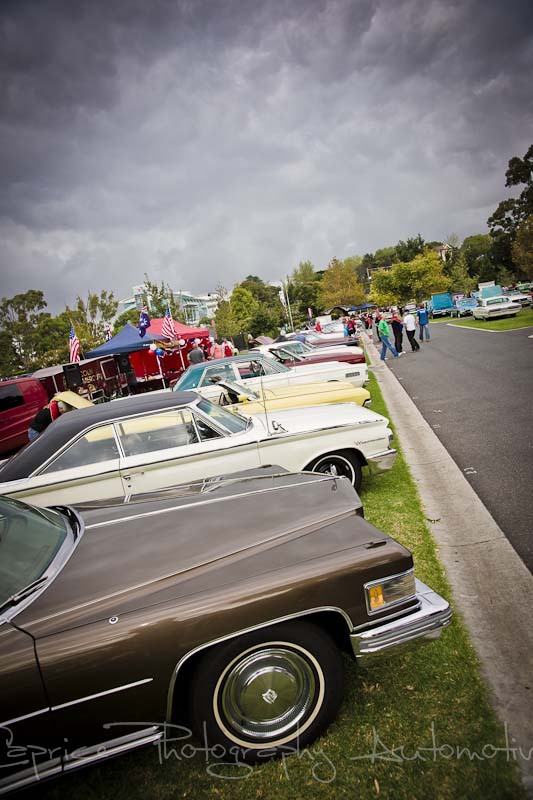 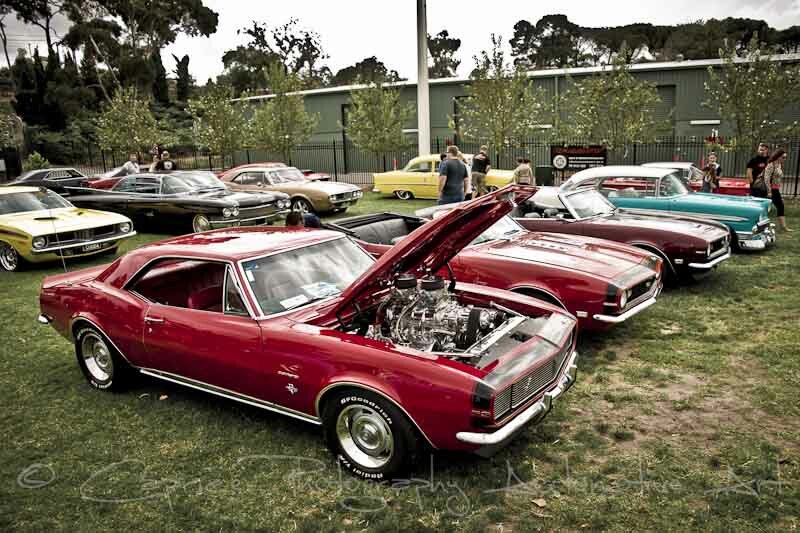 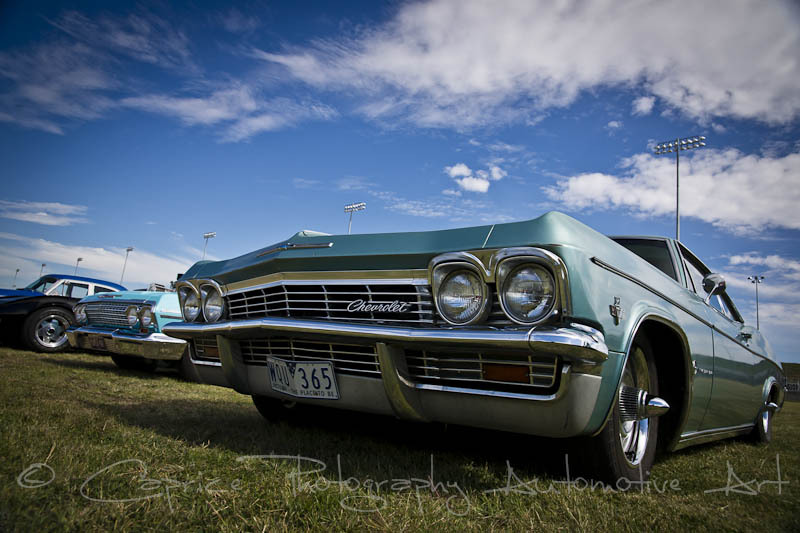 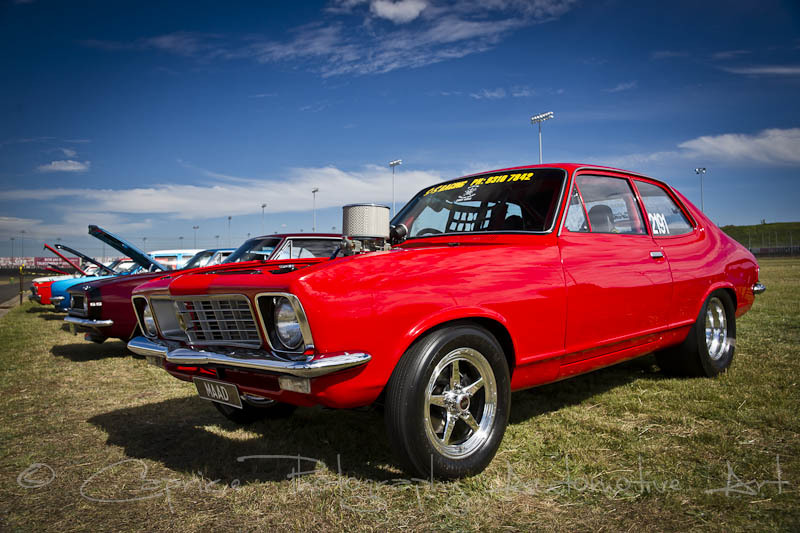 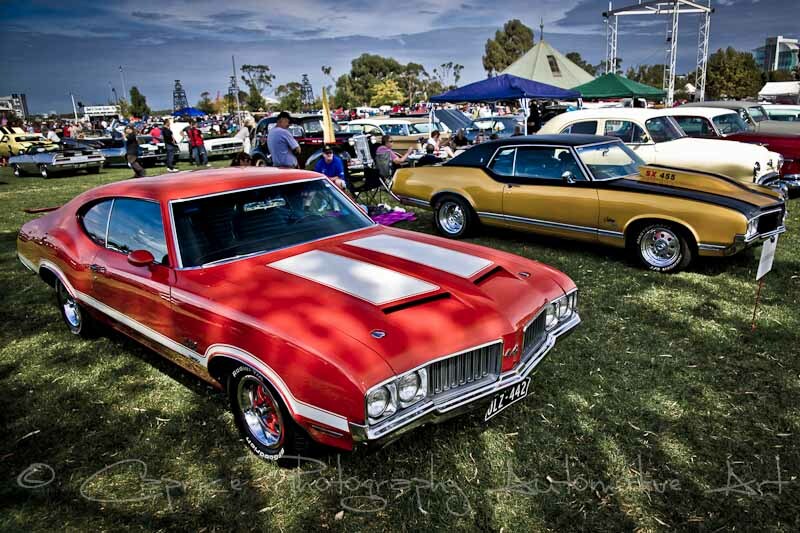 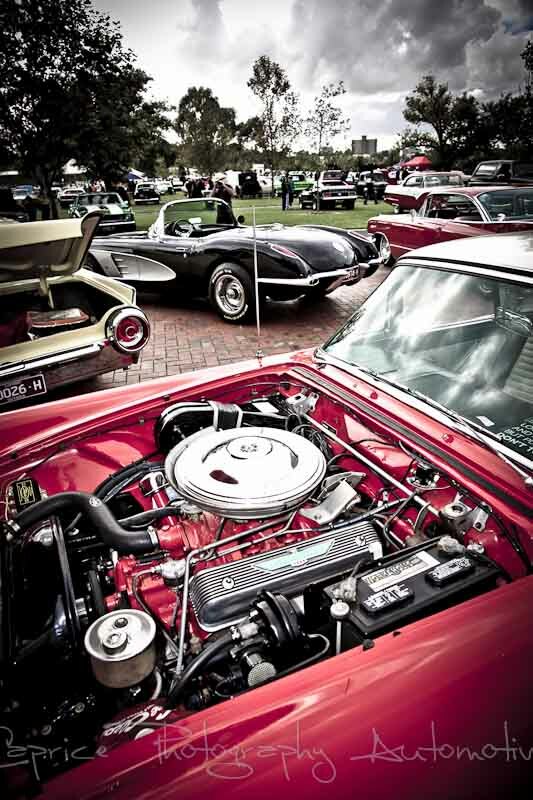 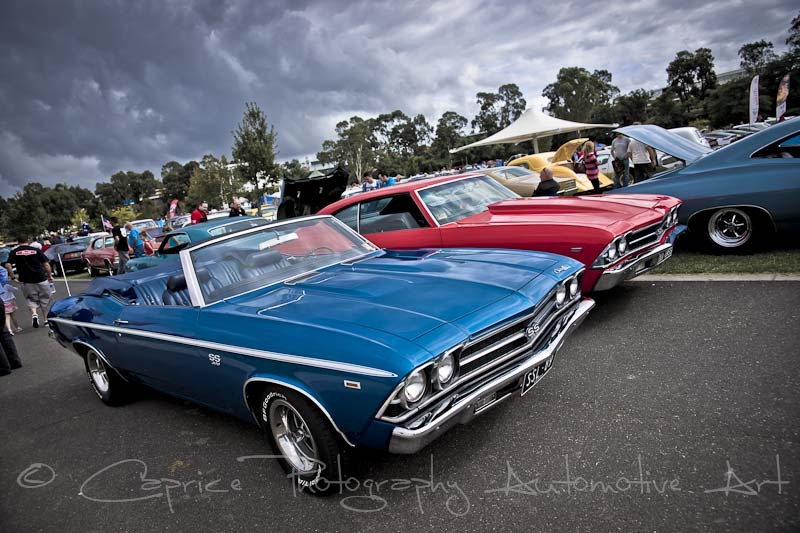 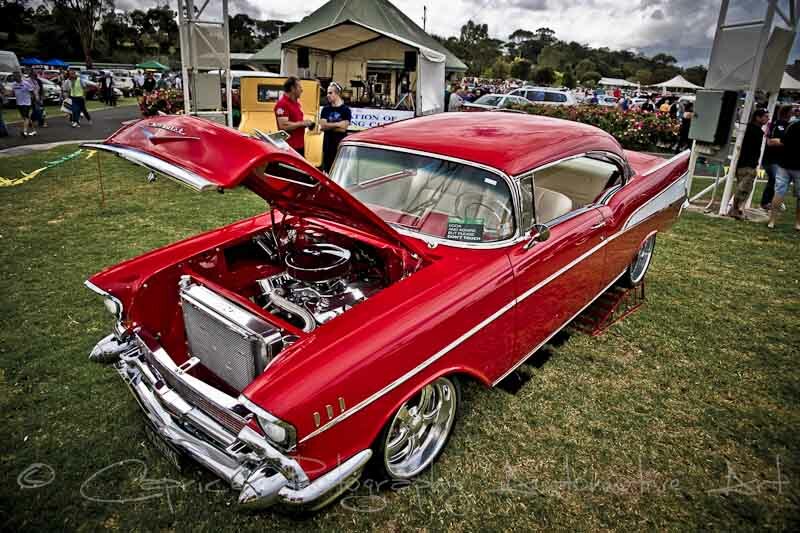 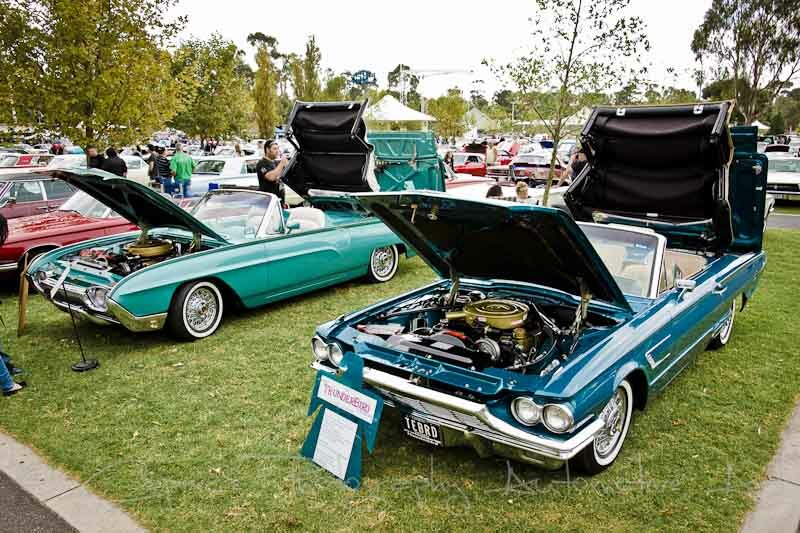 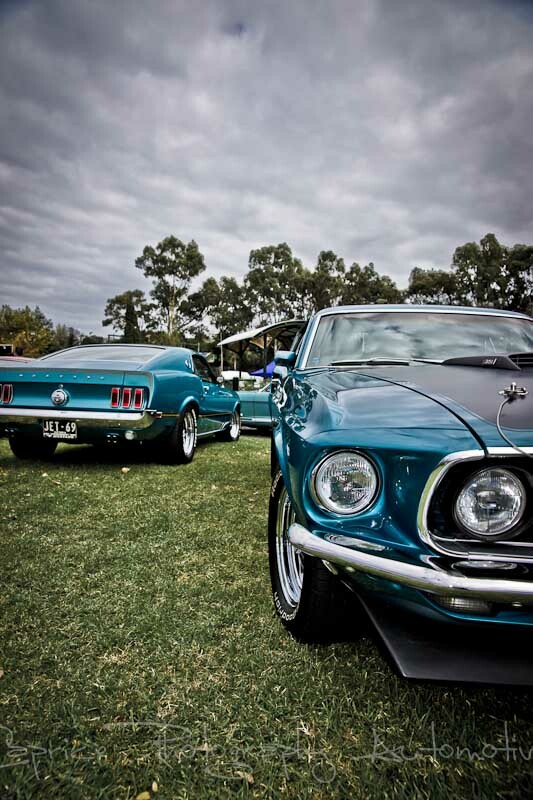 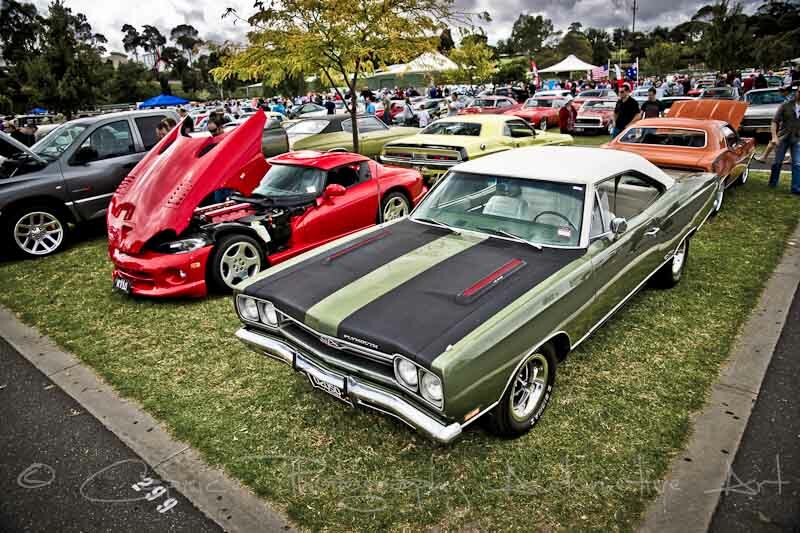 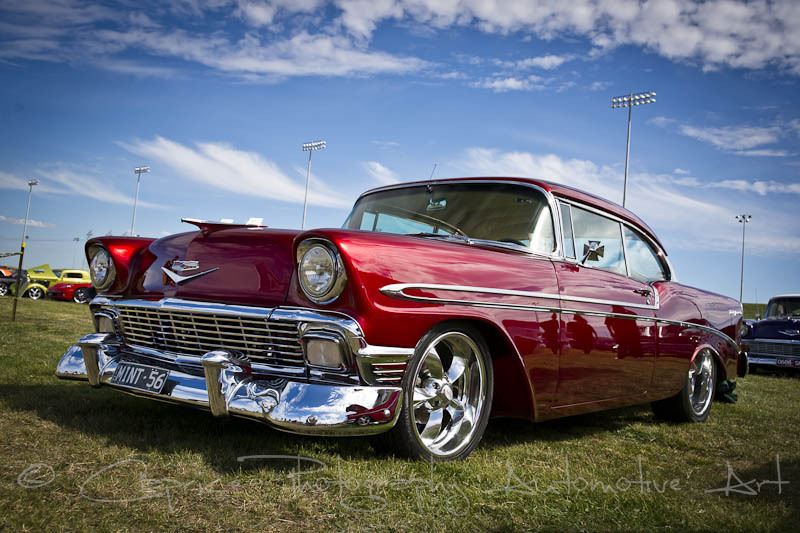 Sometimes they disappoint you while others, such as the Lancefield swap meet and show n shine will blow you away with the size of the turn out. 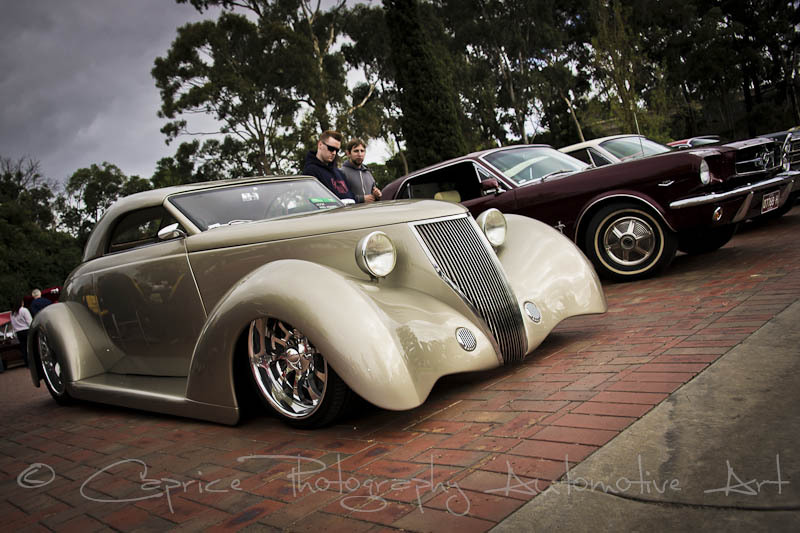 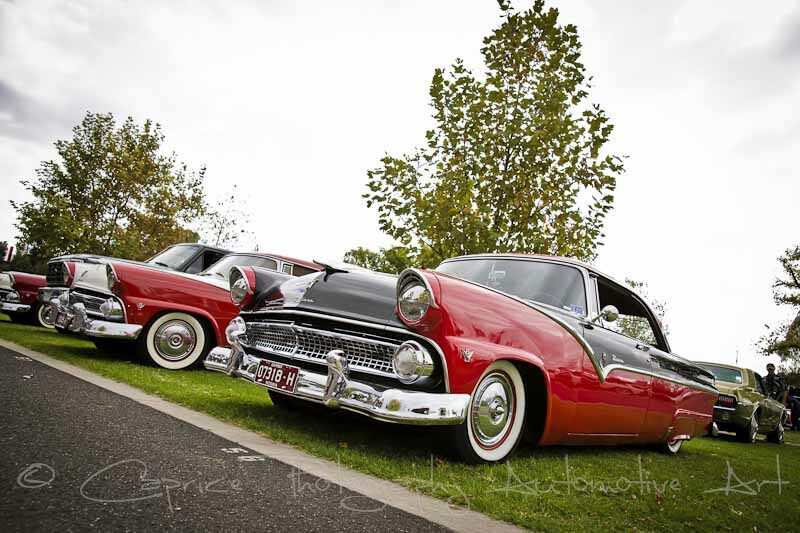 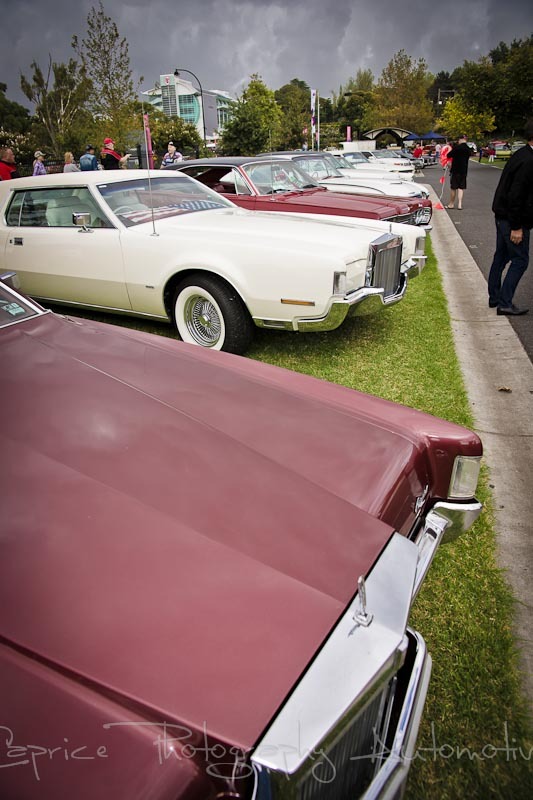 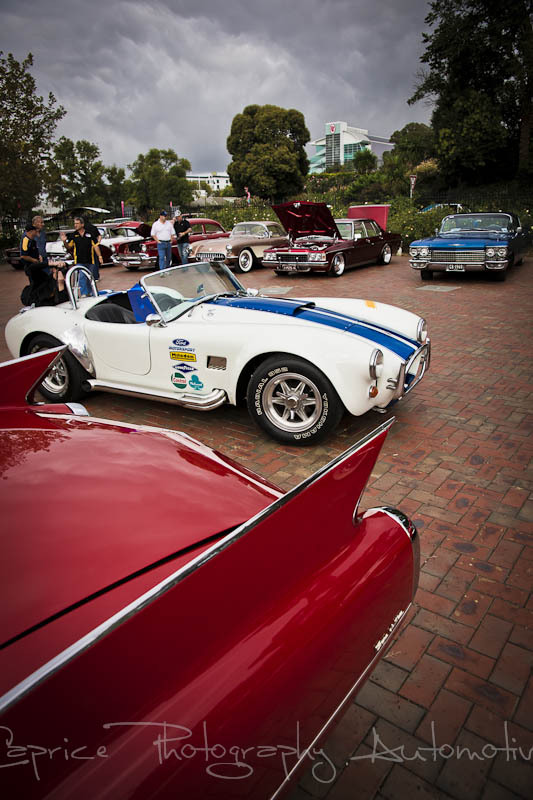 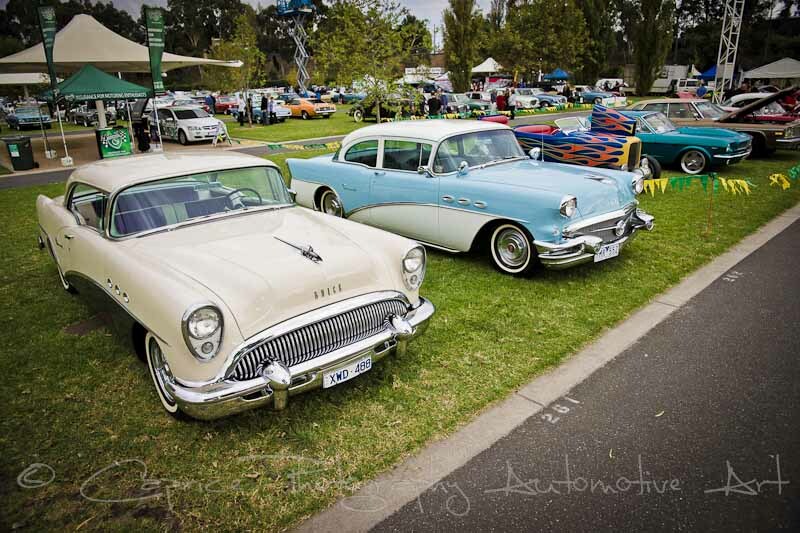 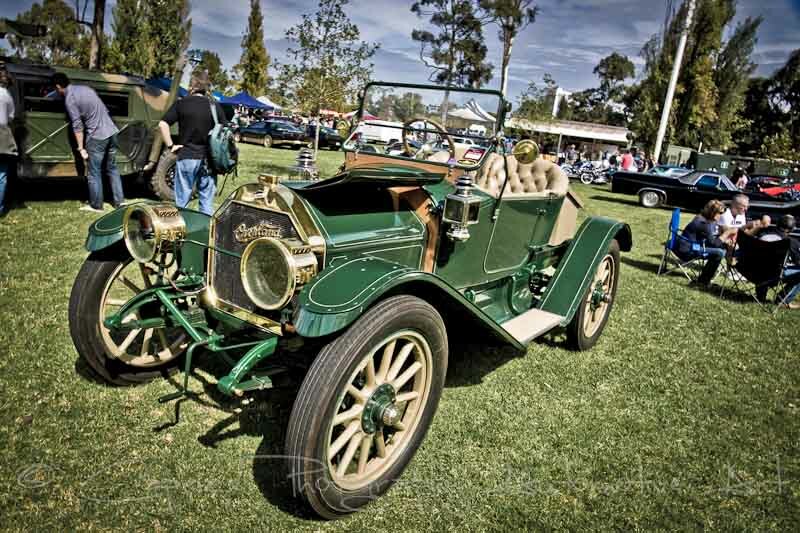 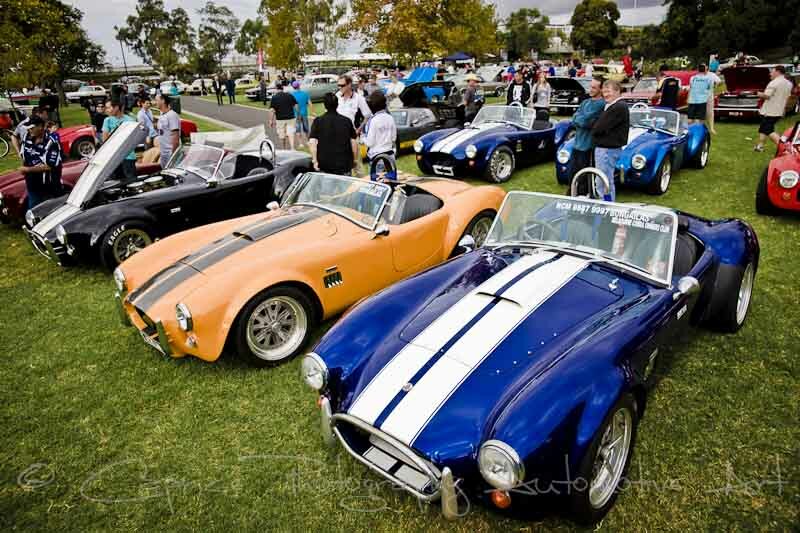 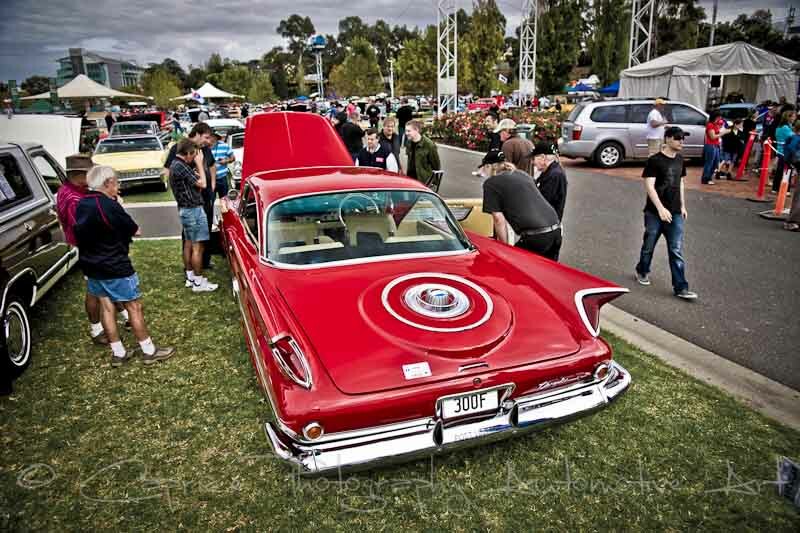 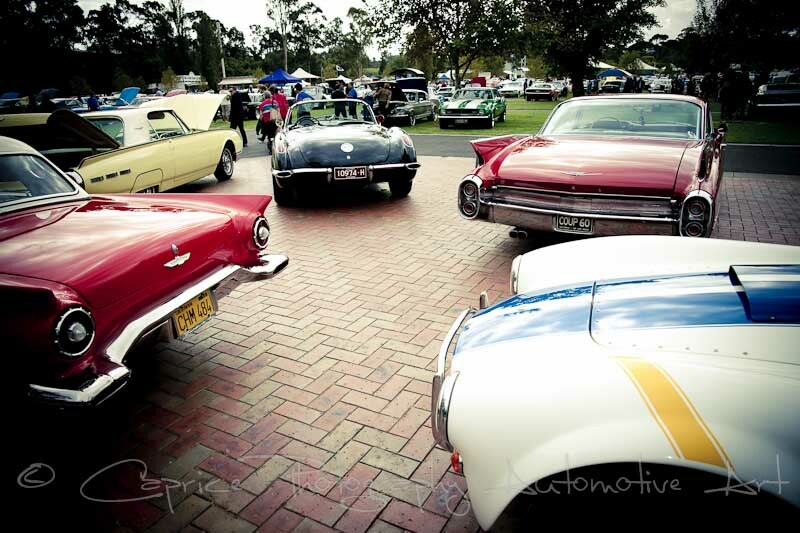 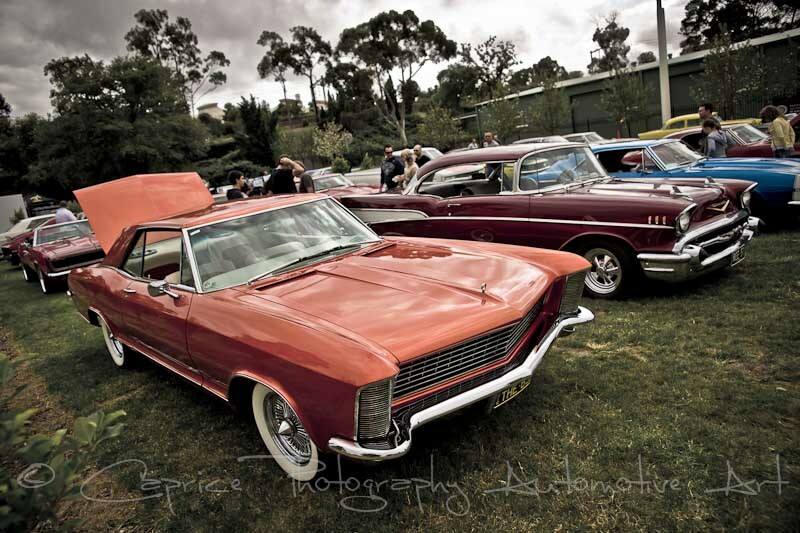 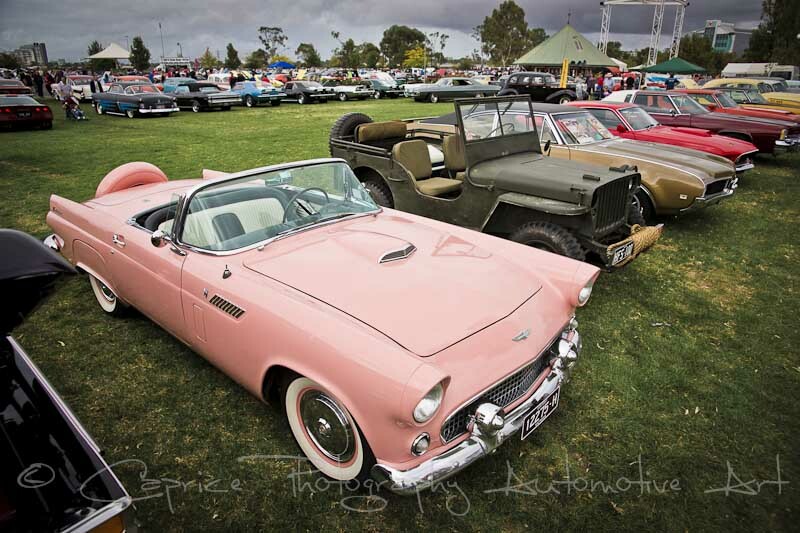 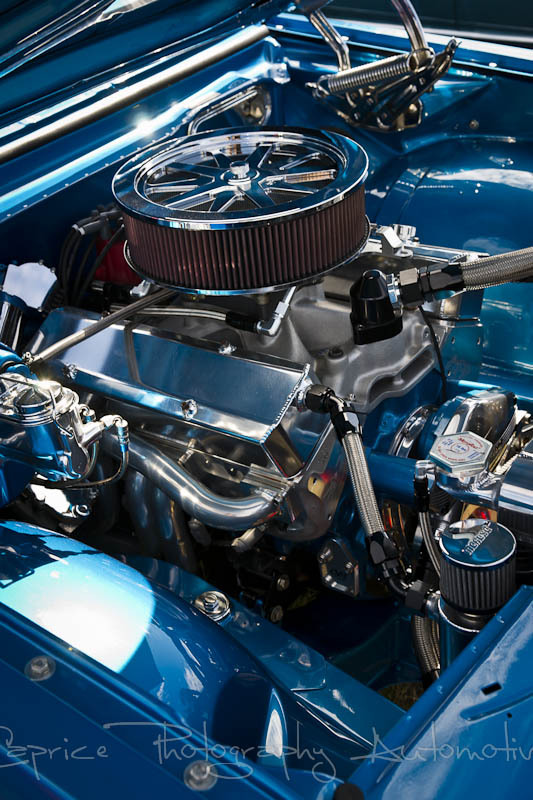 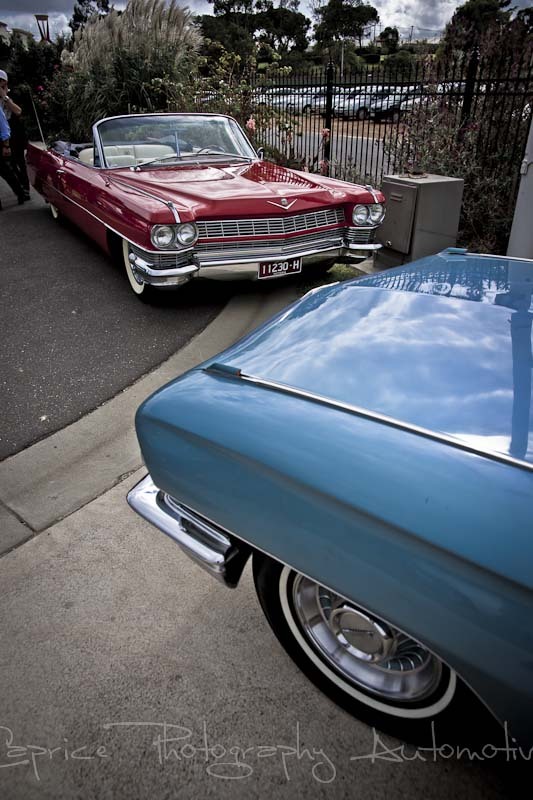 Lancefield, located in centralVictoriais one of those leafy towns you pass through admiring the picturesque setting as you do and could well mistake it for one that doesn’t take to automotive amusements such as swap meets and car shows but you would be sorely mistaken. 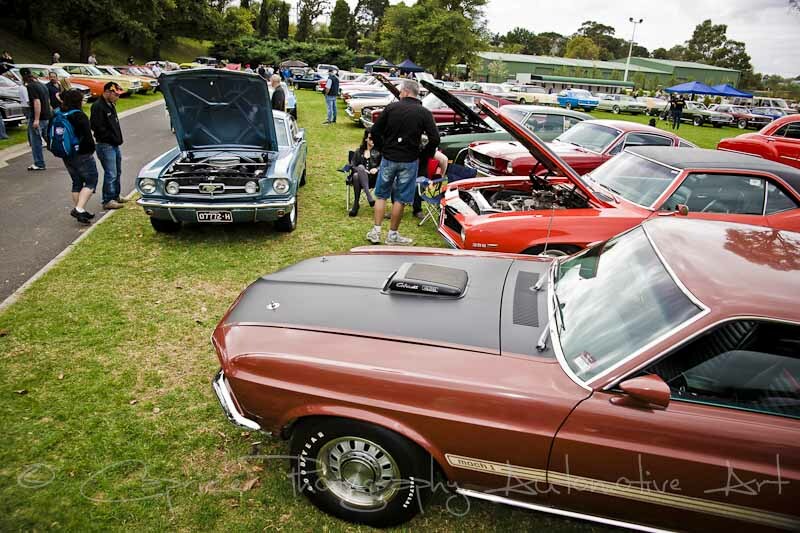 With over four hundred cars on display on the local football team, the Tigers’ oval and flanked by I don’t know how many swap meet sites, anyone visiting for the day could easily fill in their time picking through the wide assortment of automotive parts and great selection of bric-a-brac up for sale or peruse through the wide variety of automotive history, original and modified. 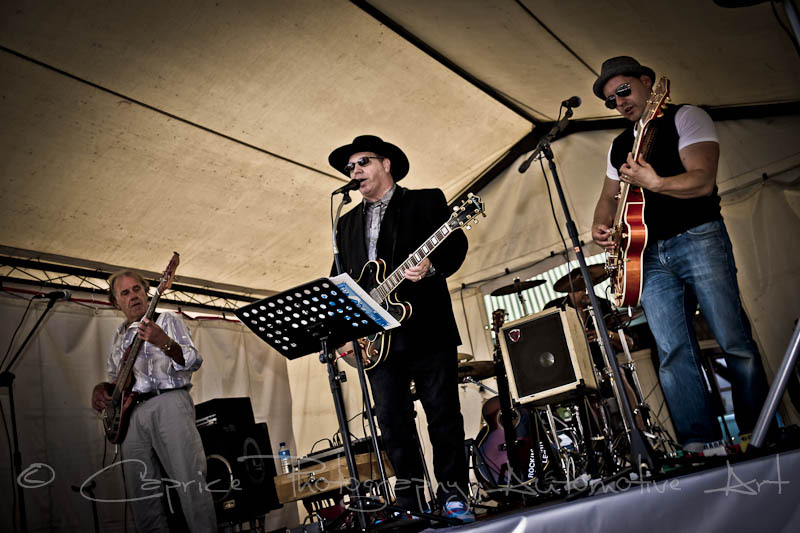 A live three piece band added to the atmosphere with their dulcet tones filling the air while the local club put on a decent barbeque feed for the hungry punters. 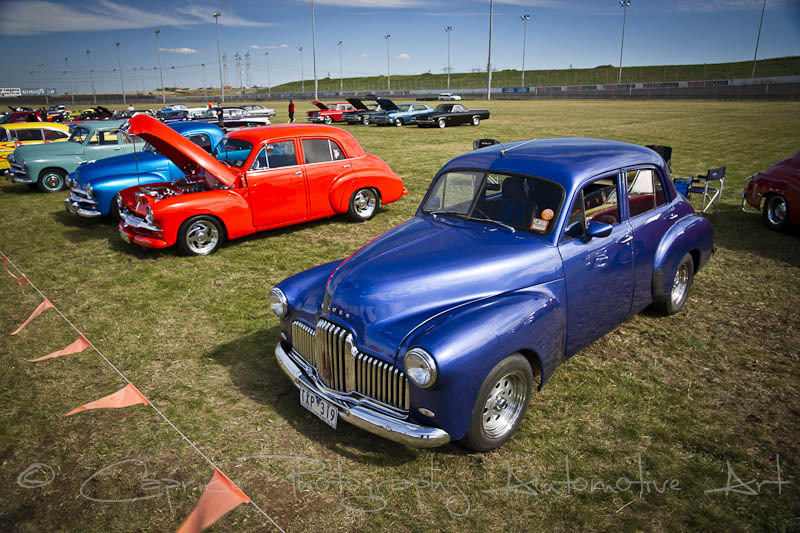 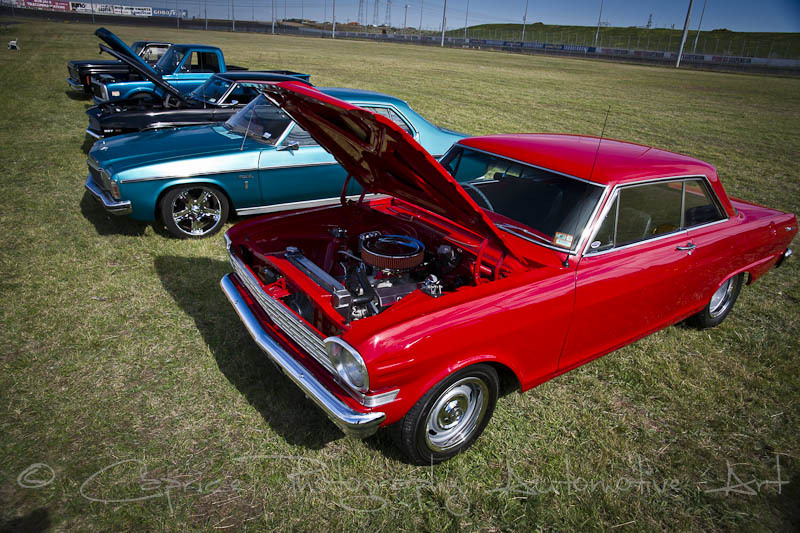 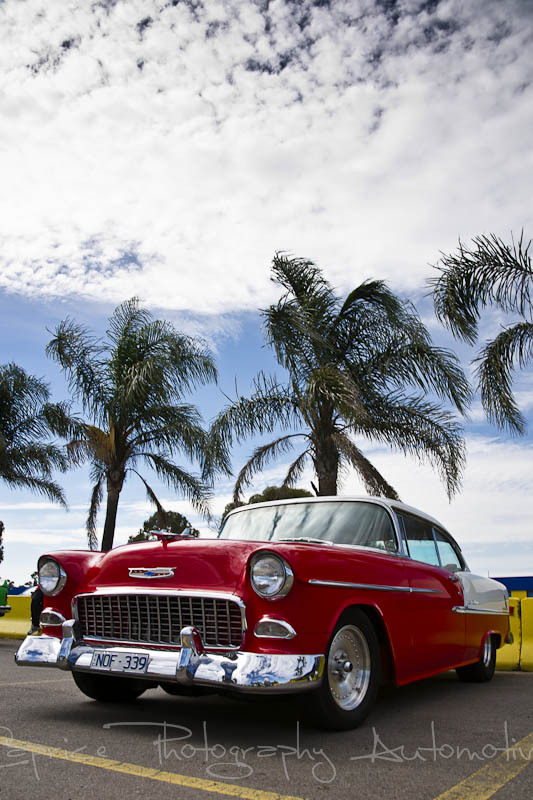 If you’re after parts for your project or a good excuse to drive through the country, you can’t go past this event as one of your regular calendar cruising dates!